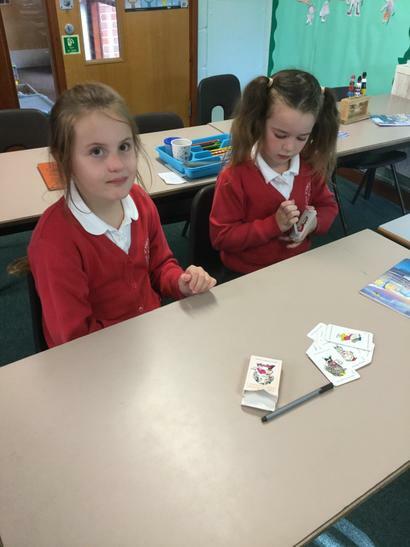 Hello from Mrs Jolley and Mrs Ayers! 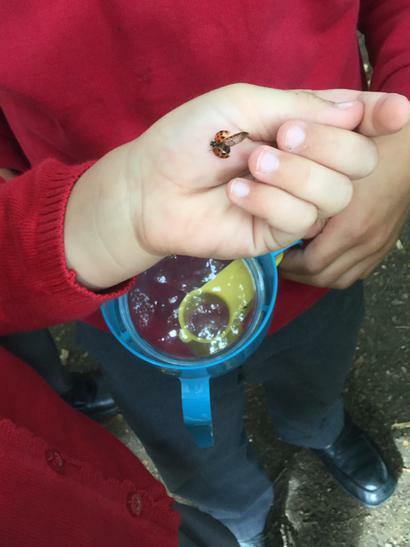 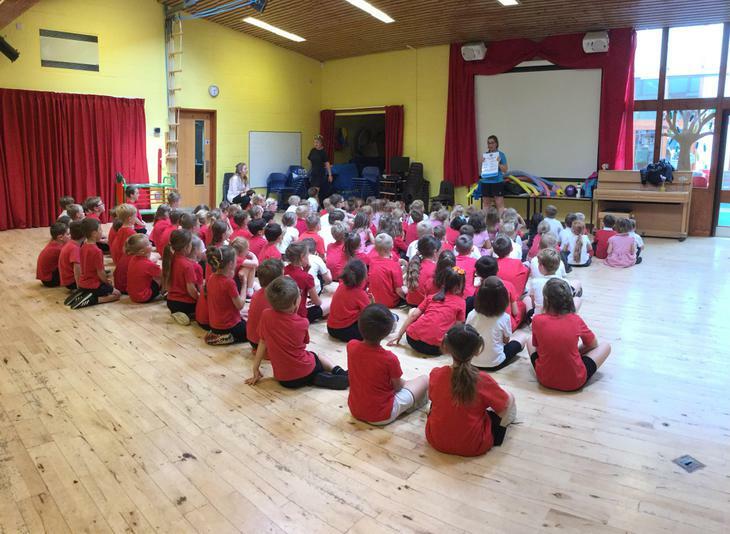 We have really enjoyed getting to know the children and staff at Ickworth Park, and look forward to meeting parents in due course. 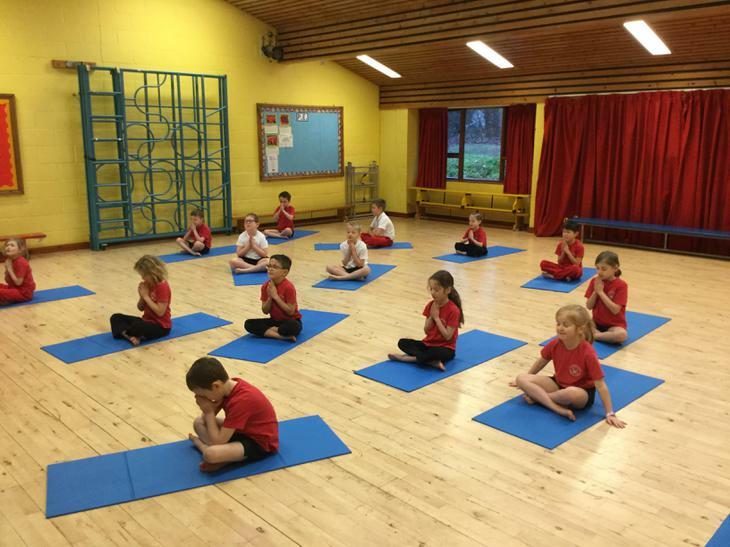 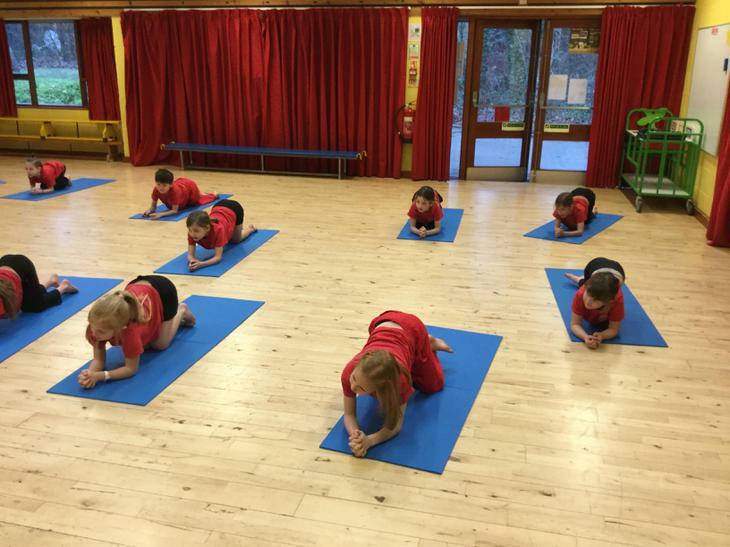 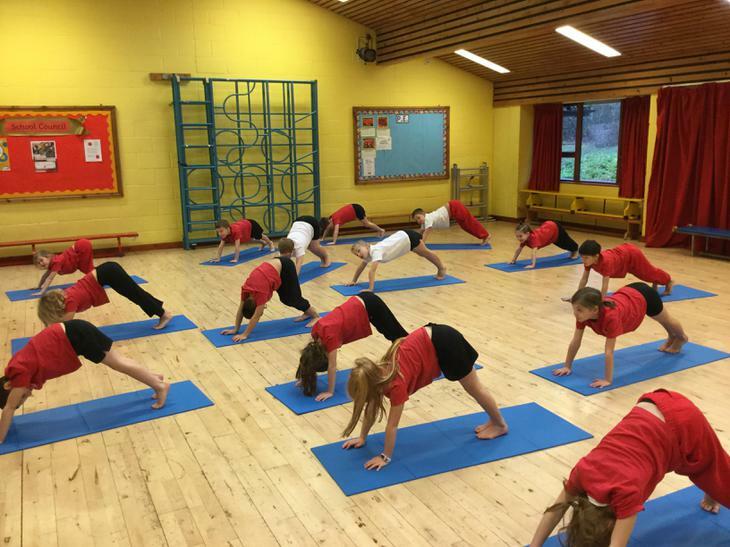 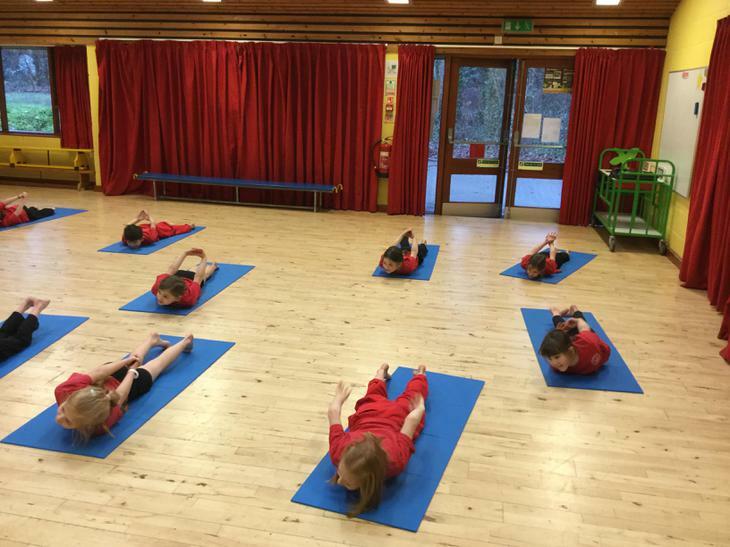 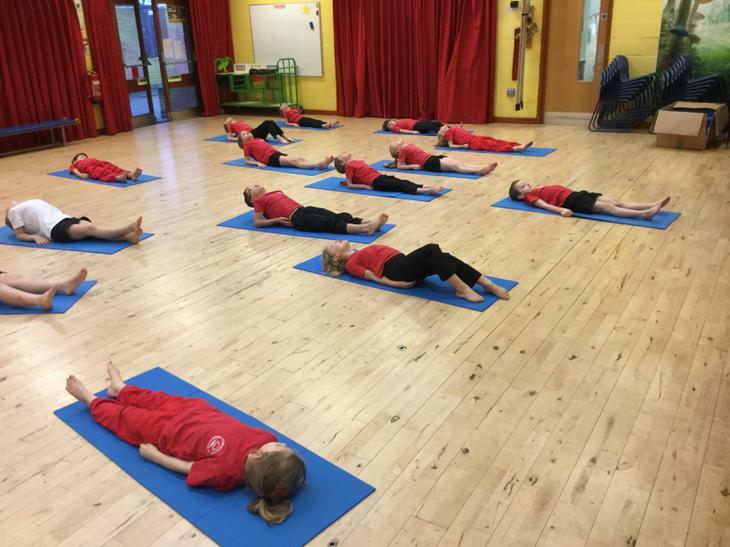 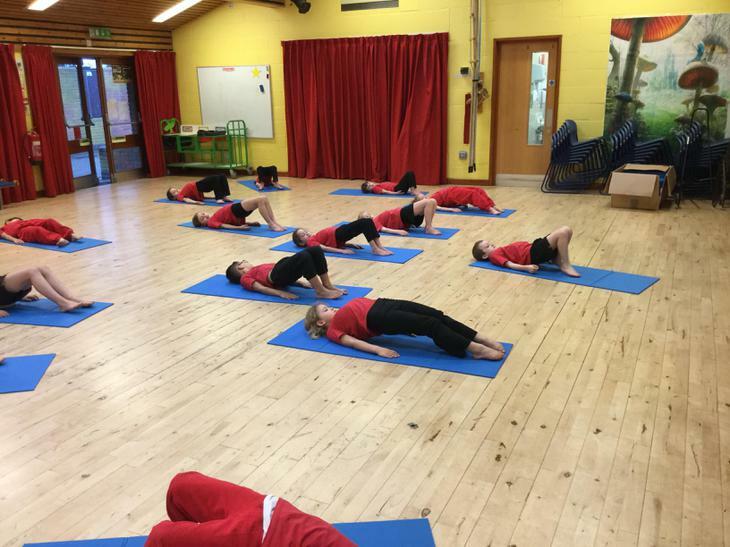 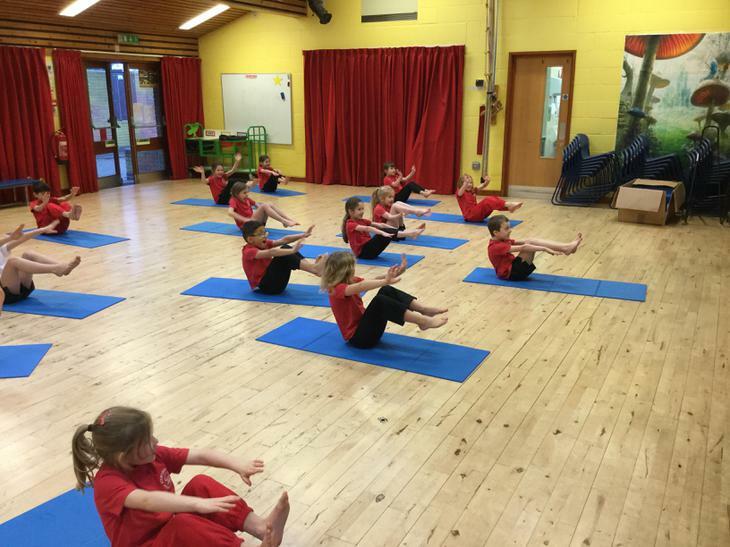 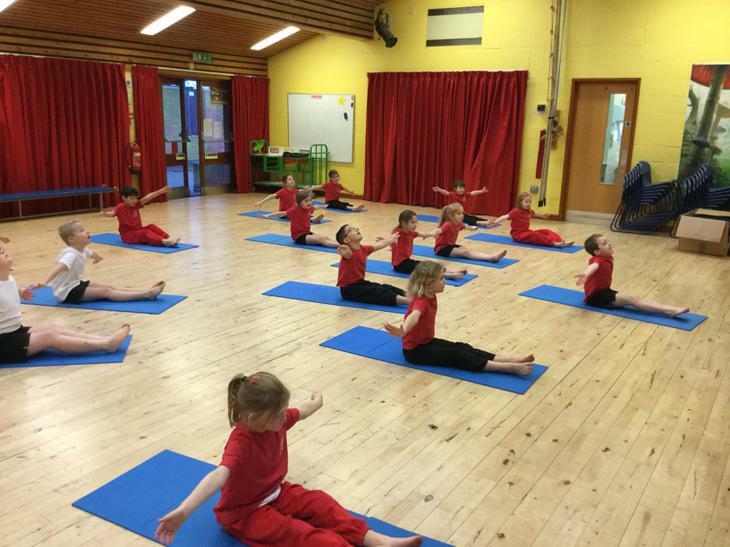 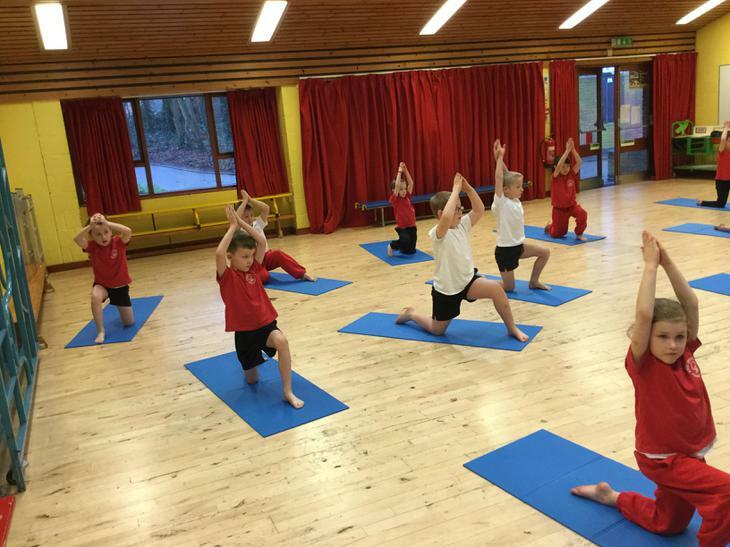 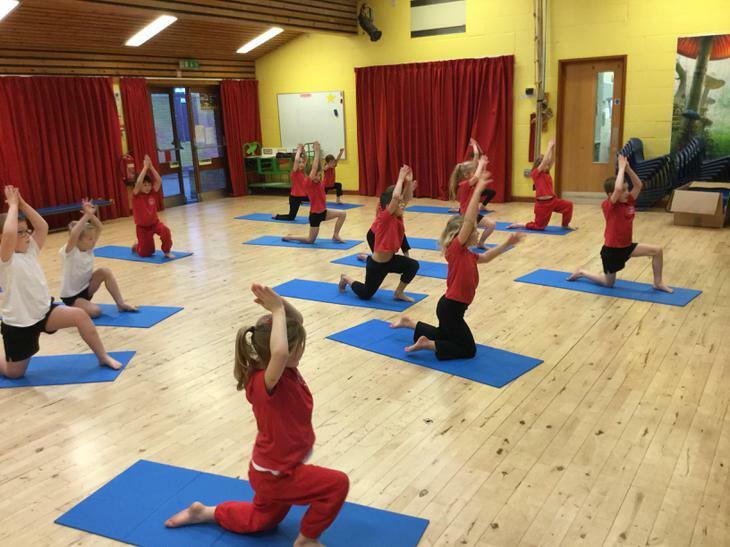 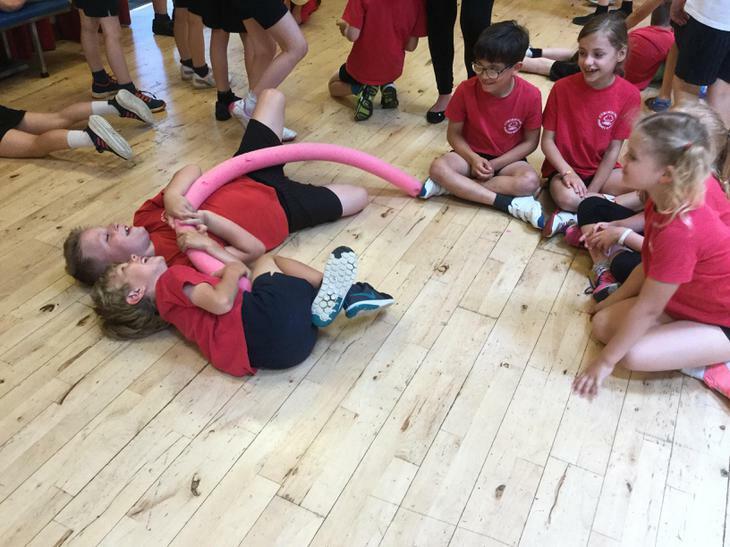 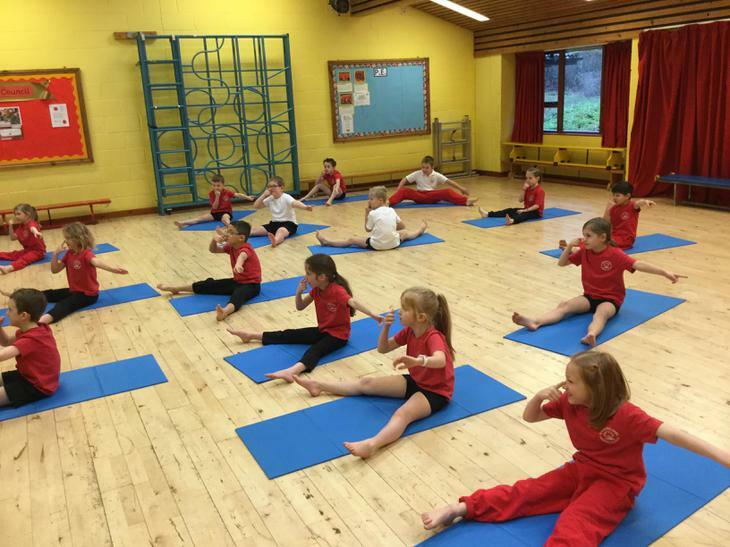 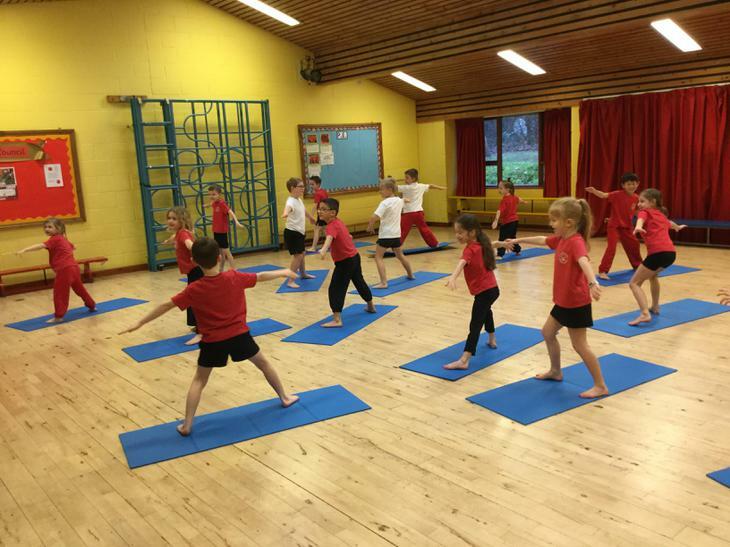 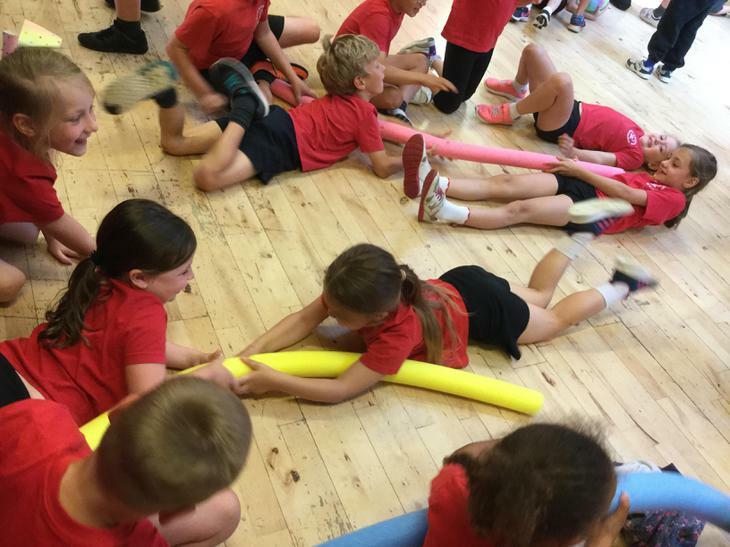 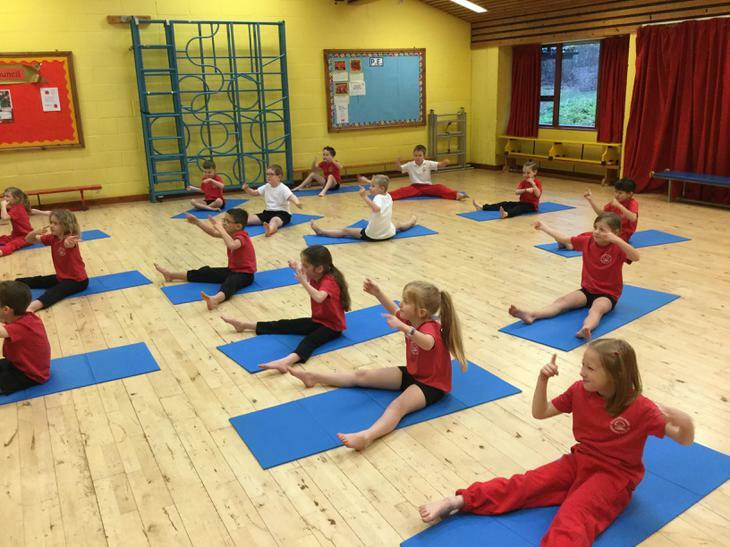 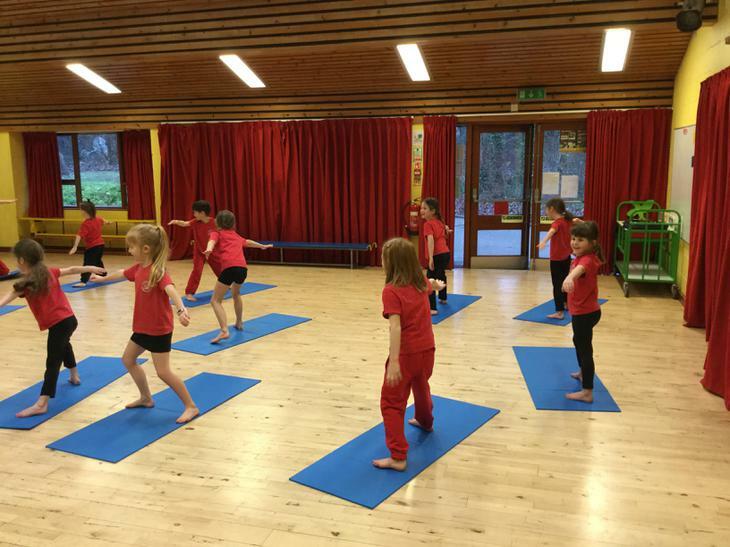 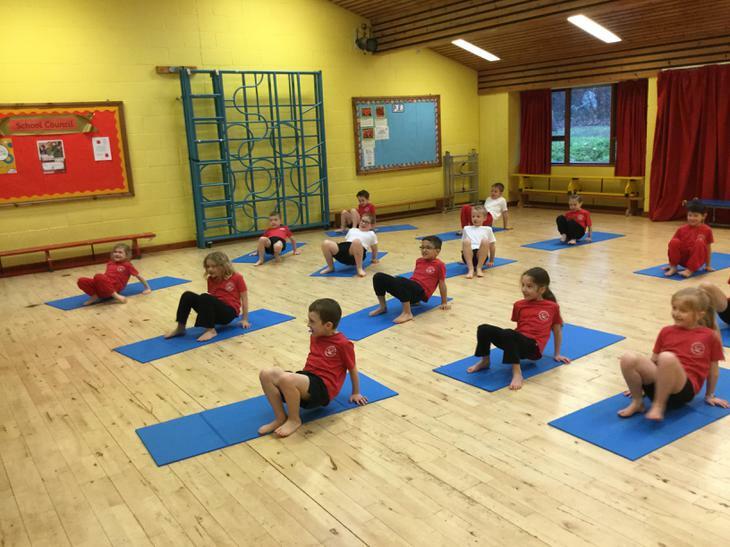 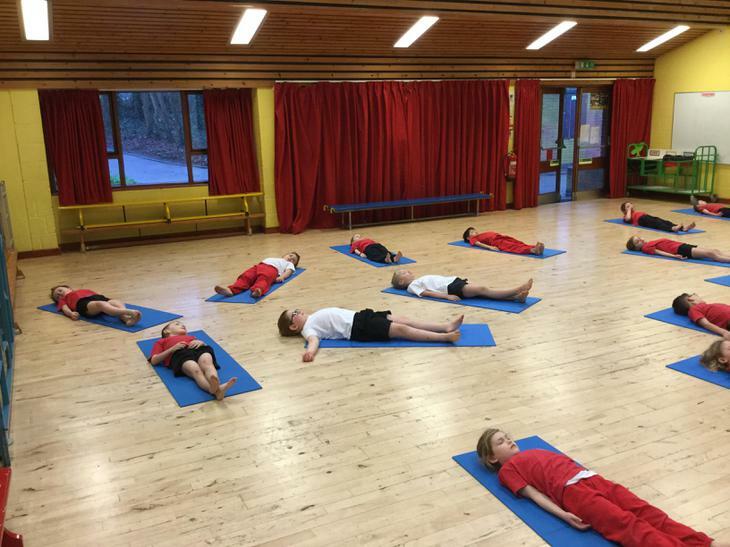 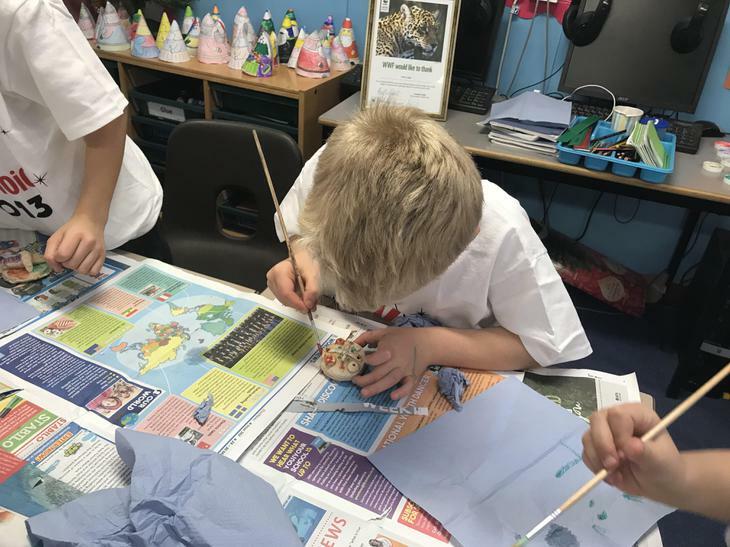 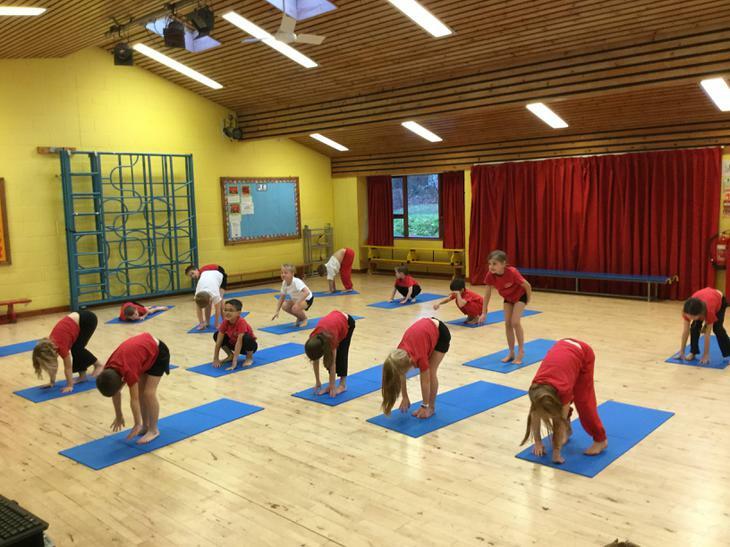 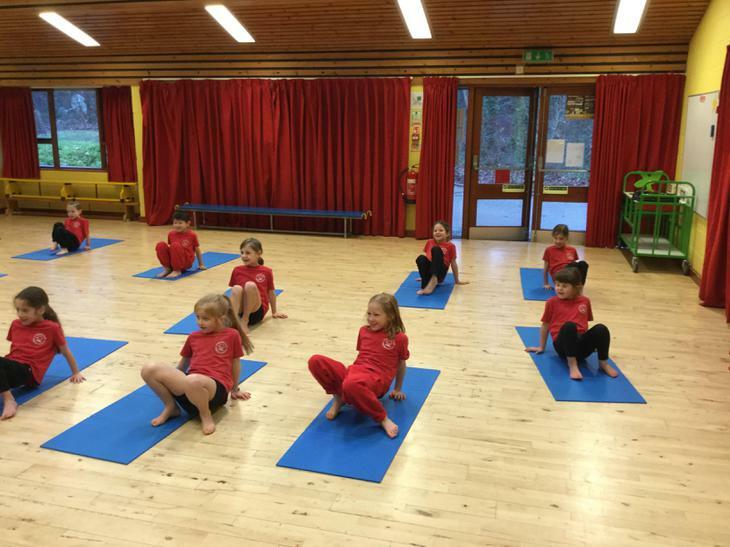 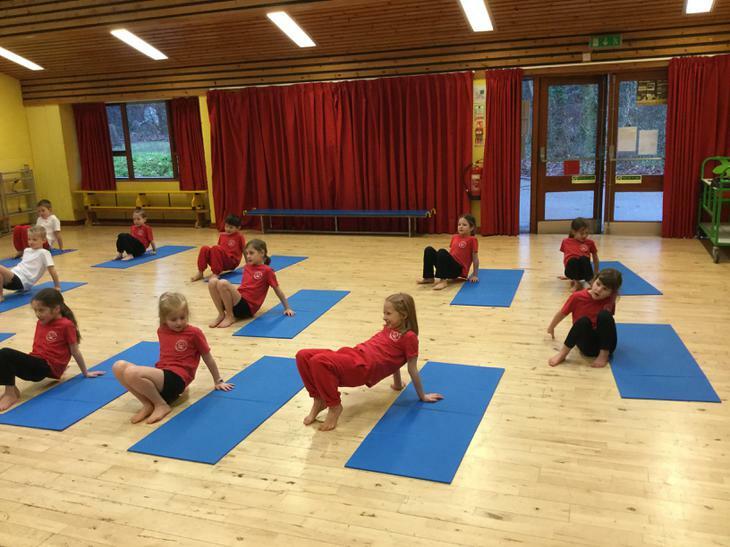 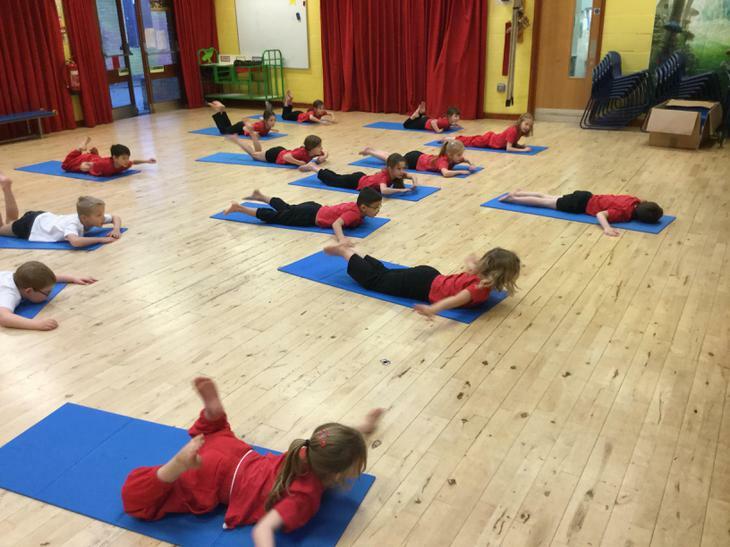 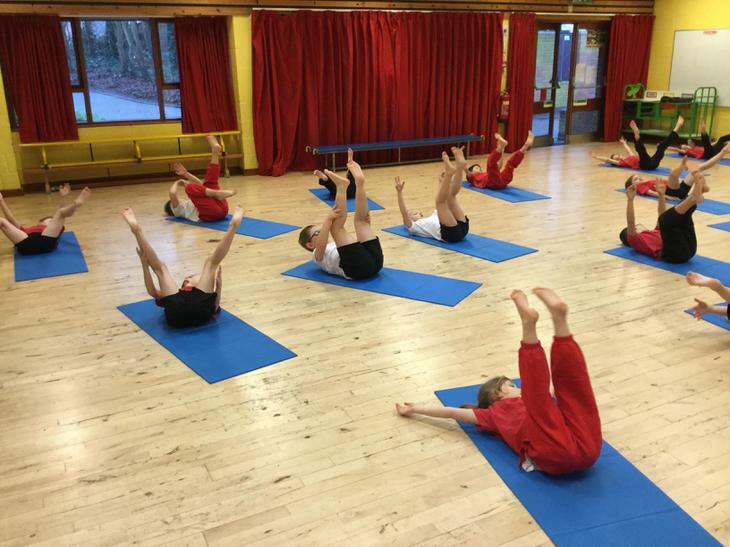 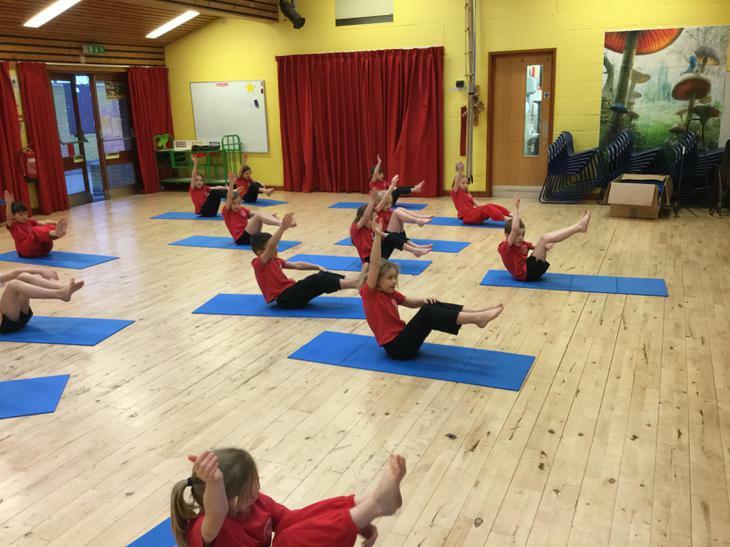 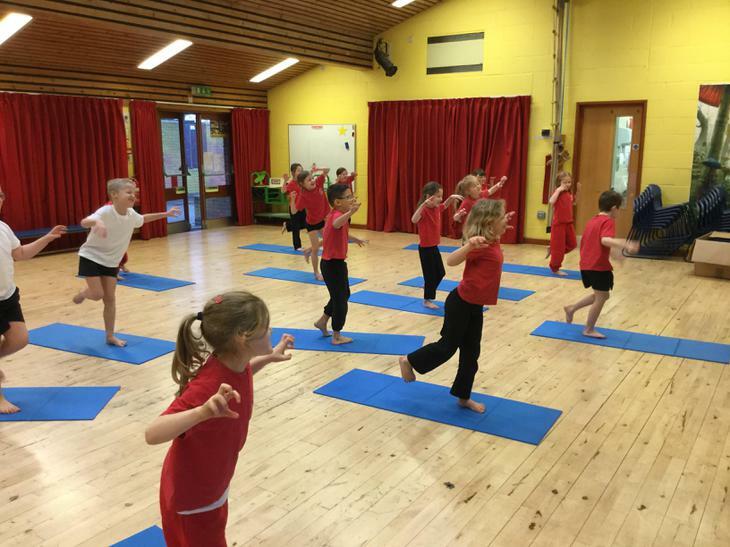 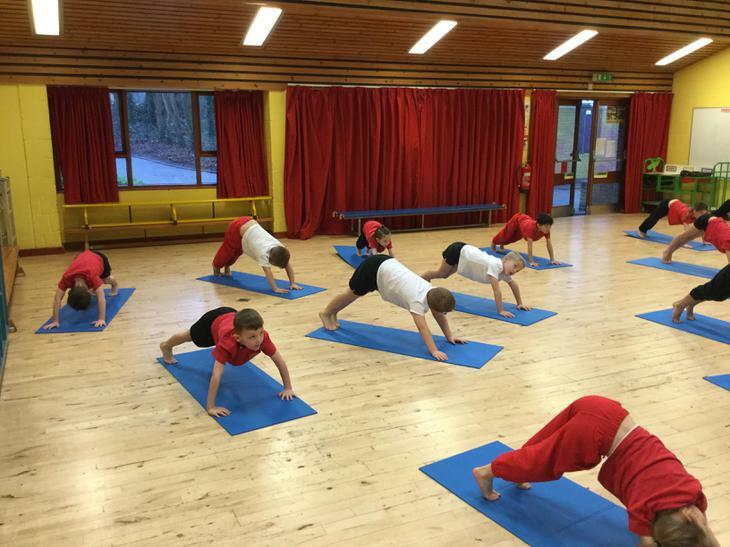 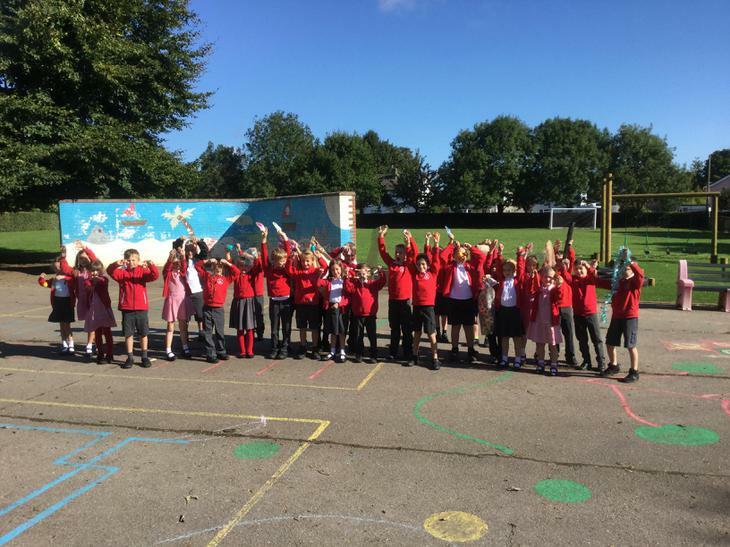 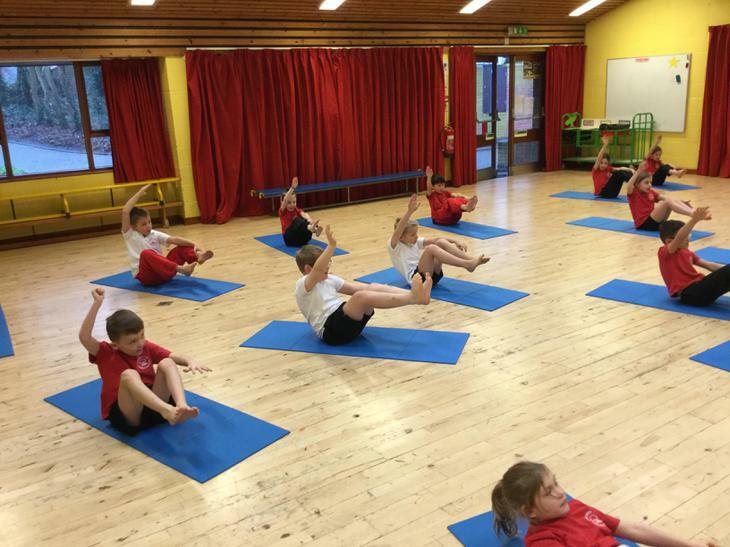 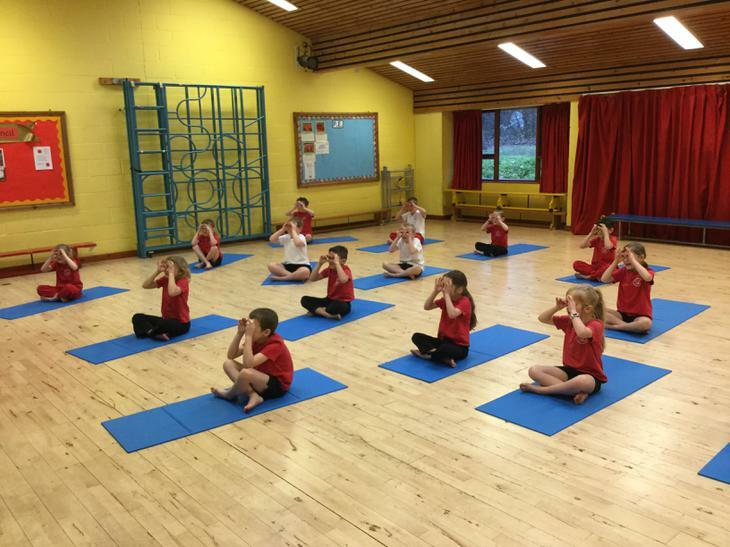 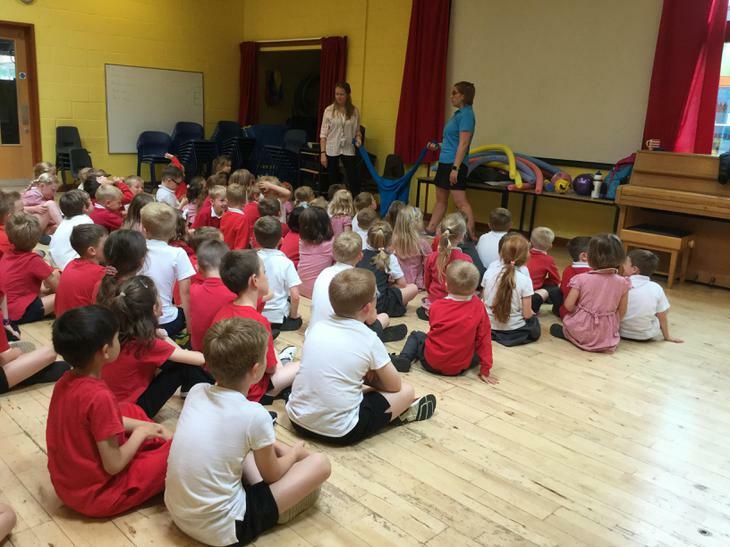 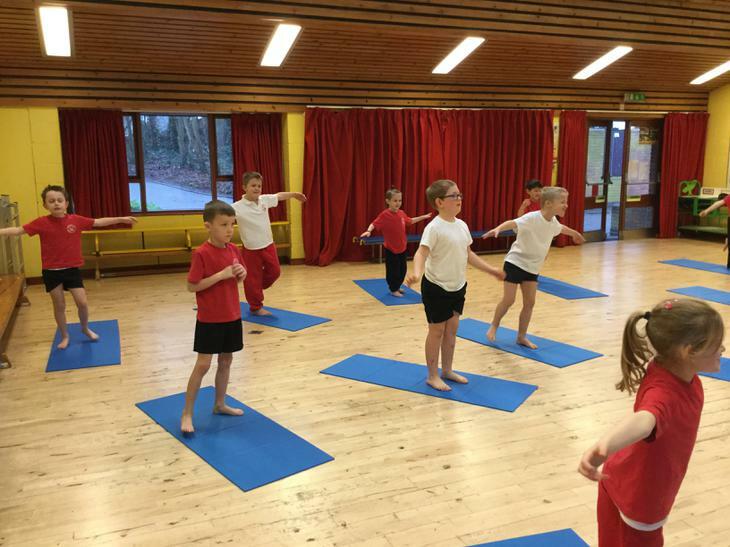 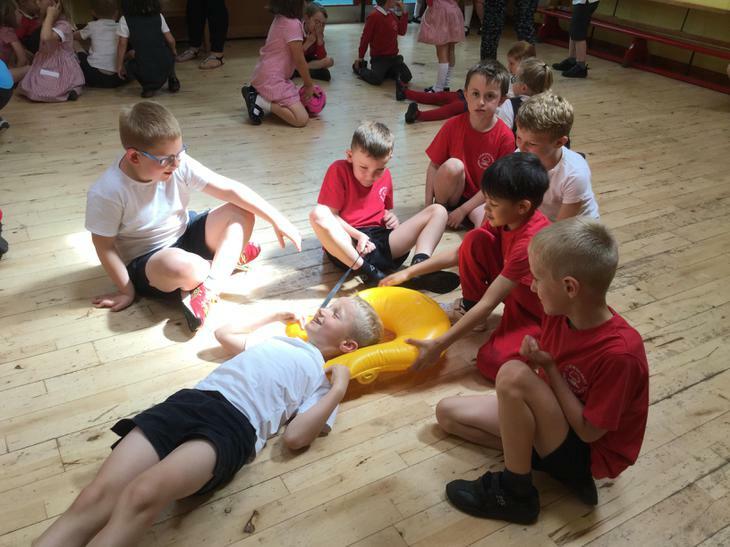 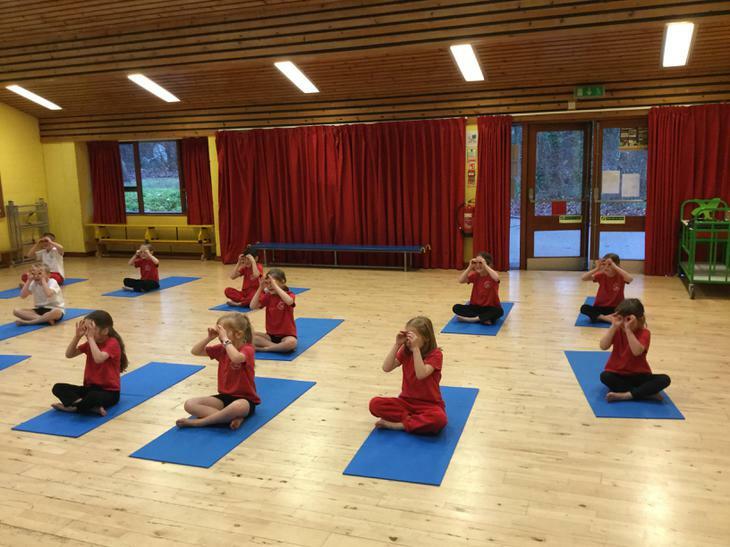 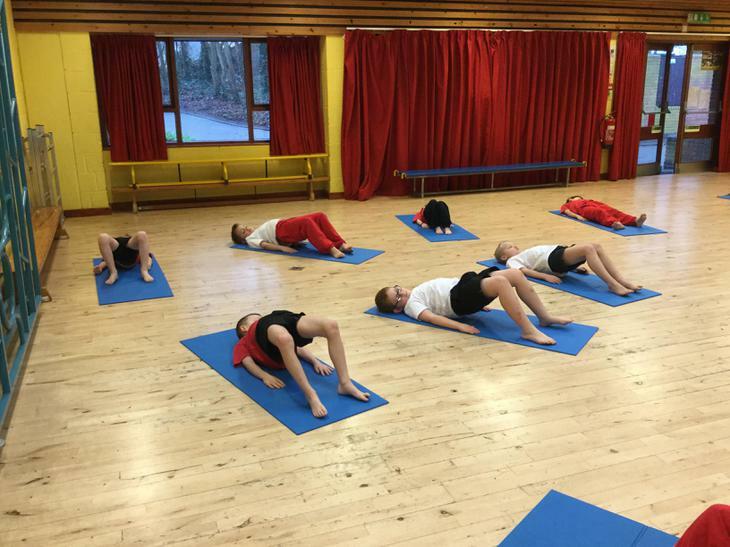 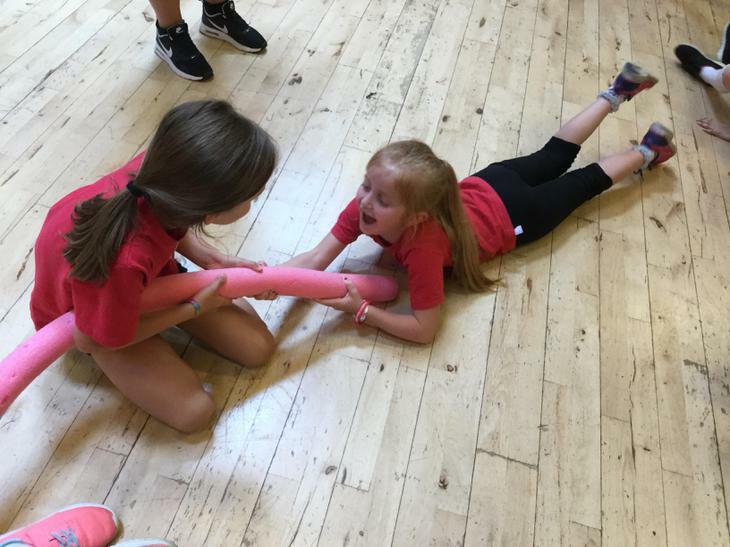 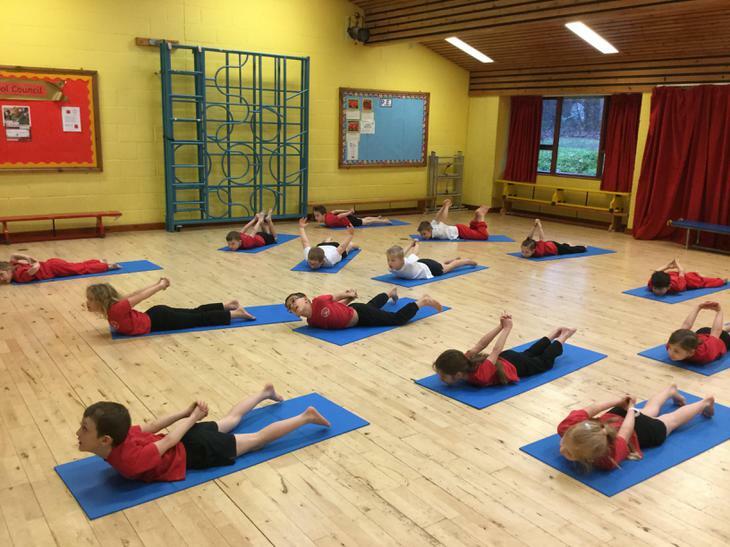 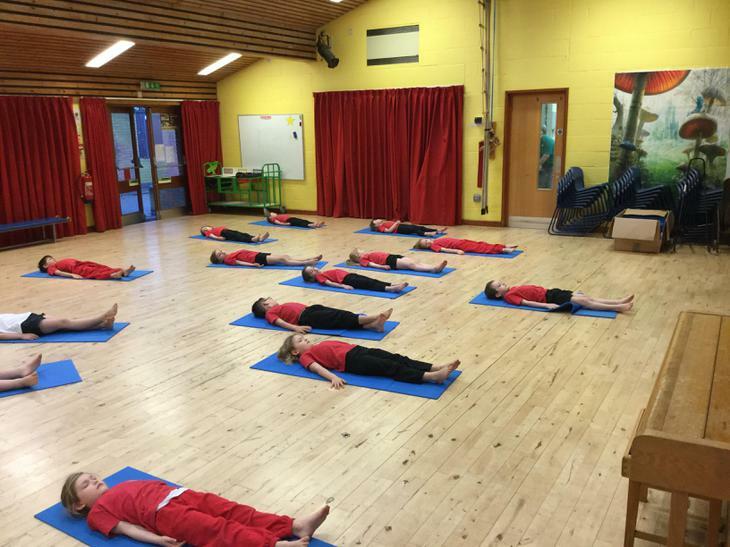 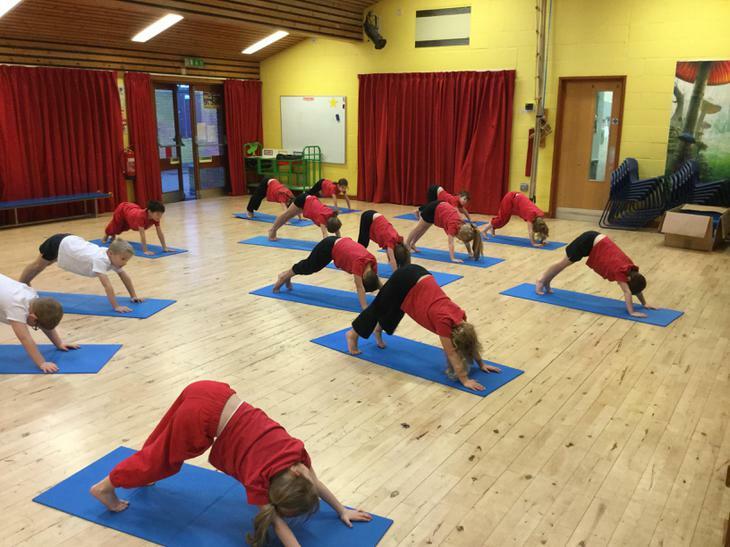 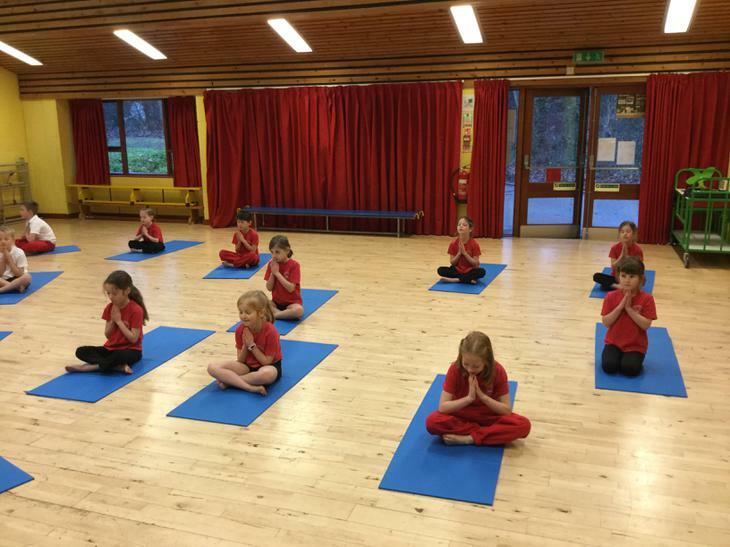 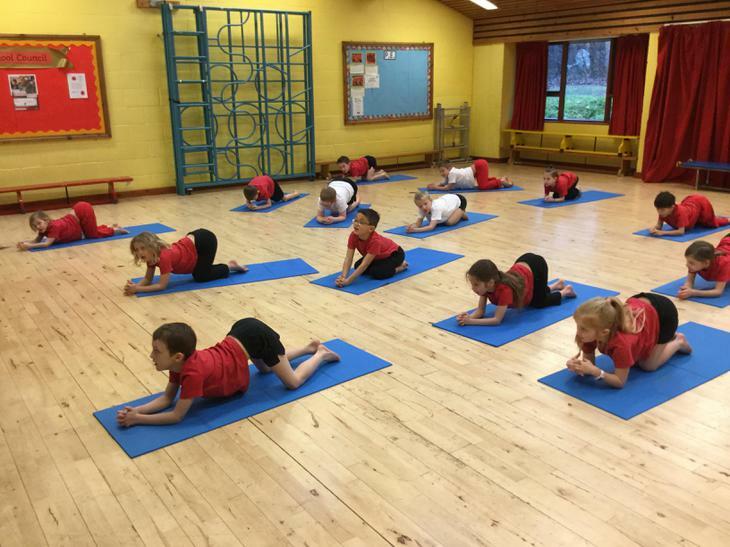 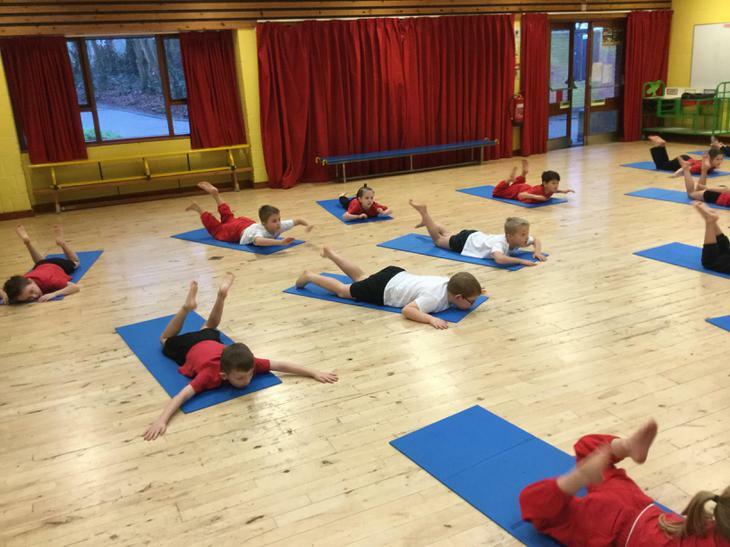 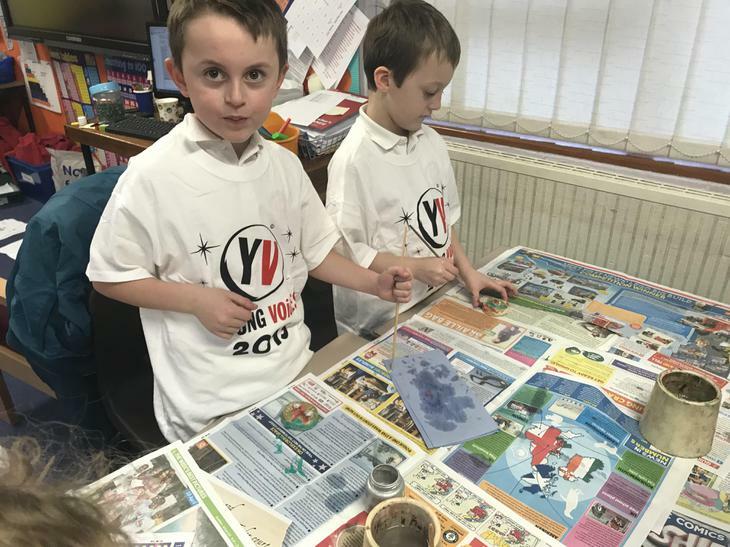 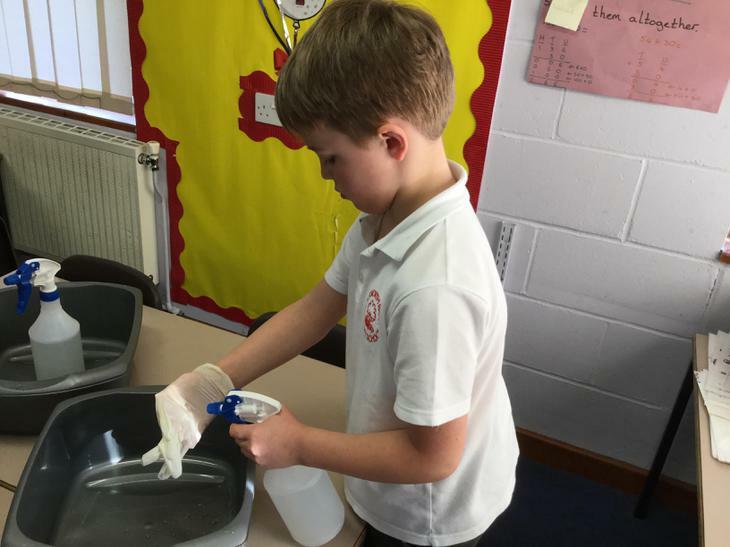 We have both been teaching for several years in Key Stage One and Two and look forward to the challenge of a new environment. 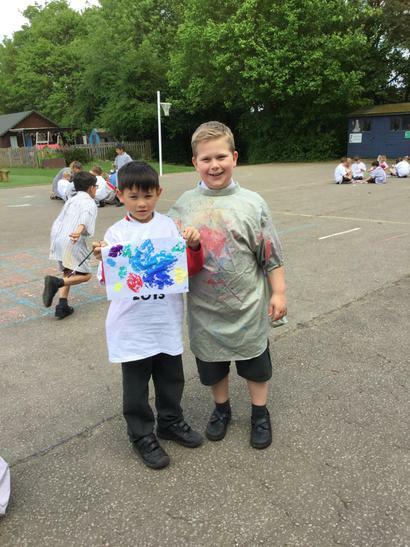 Please feel free to contact either of us at any time. 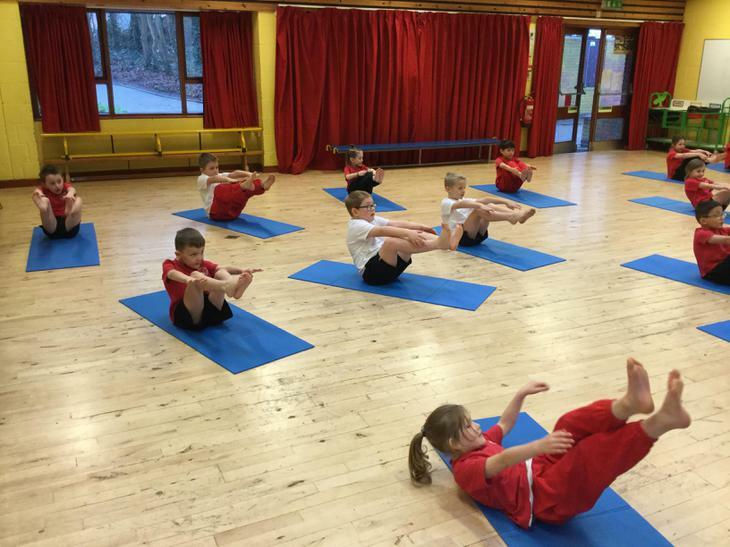 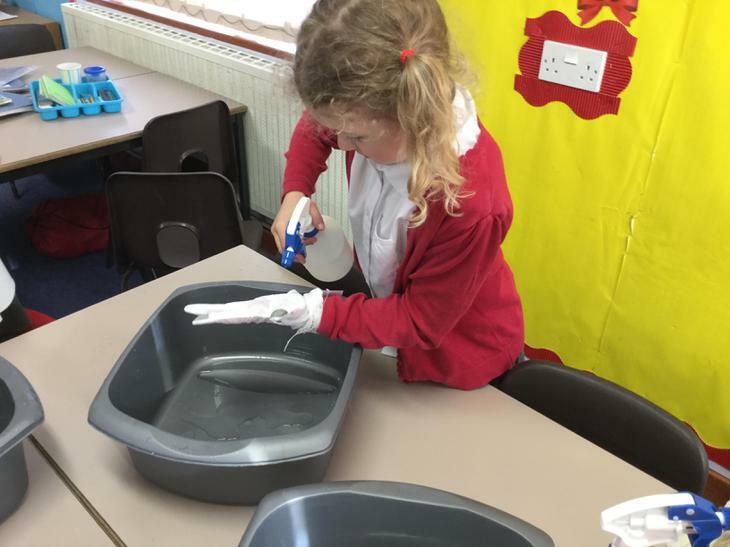 Mrs Jolley will be working Monday and Tuesday and Mrs Ayers on Wednesday, Thursday and Friday. 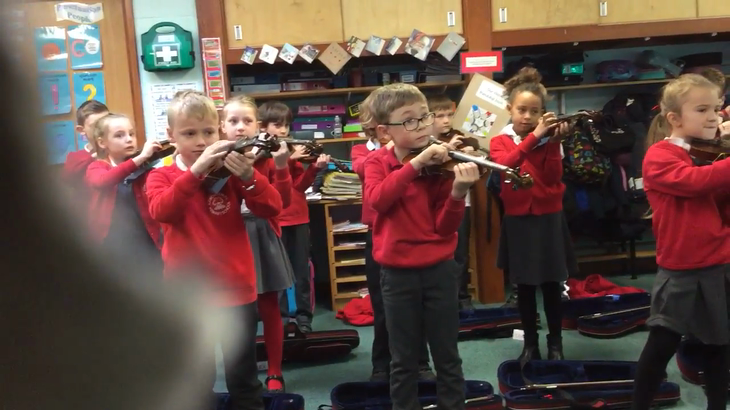 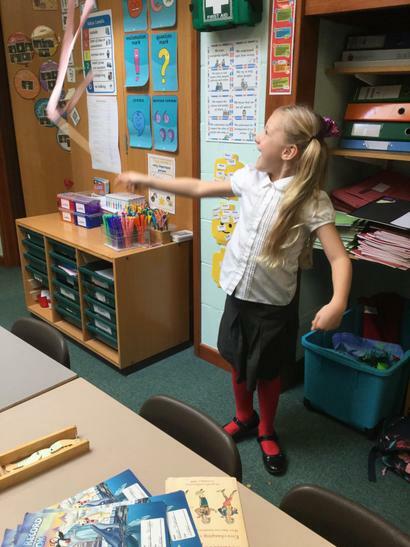 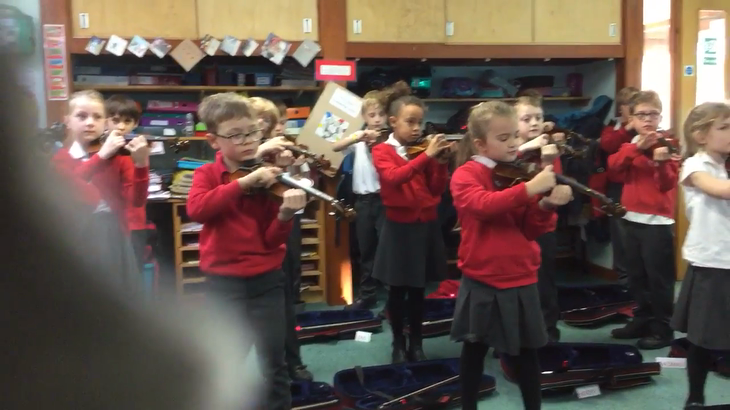 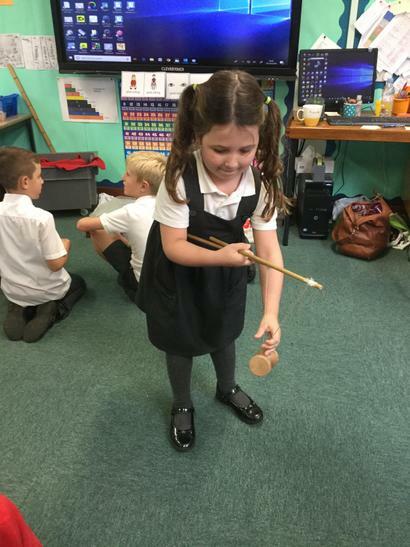 We have been practising playing the violin to put on a performance to the rest of the year 3s. 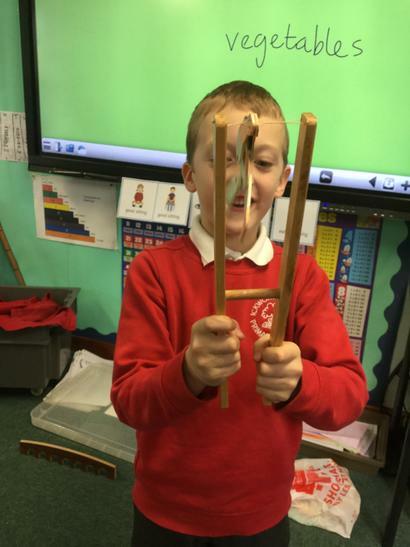 The videos show us playing our instruments. 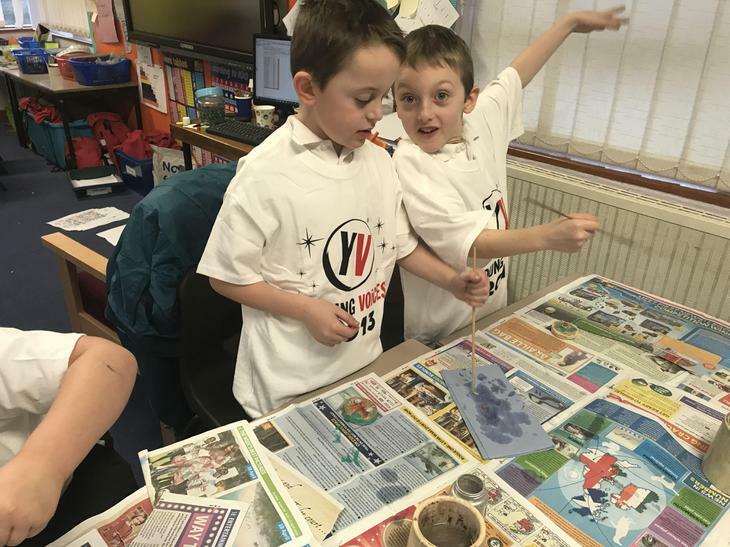 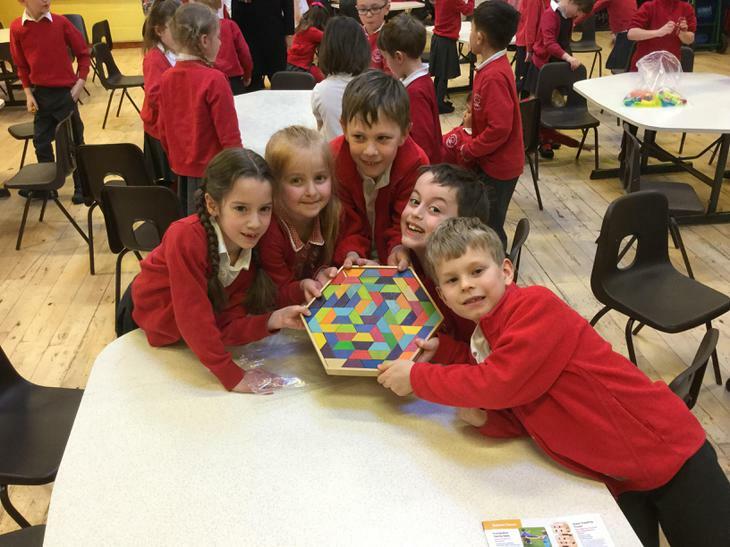 We think they really enjoyed it! 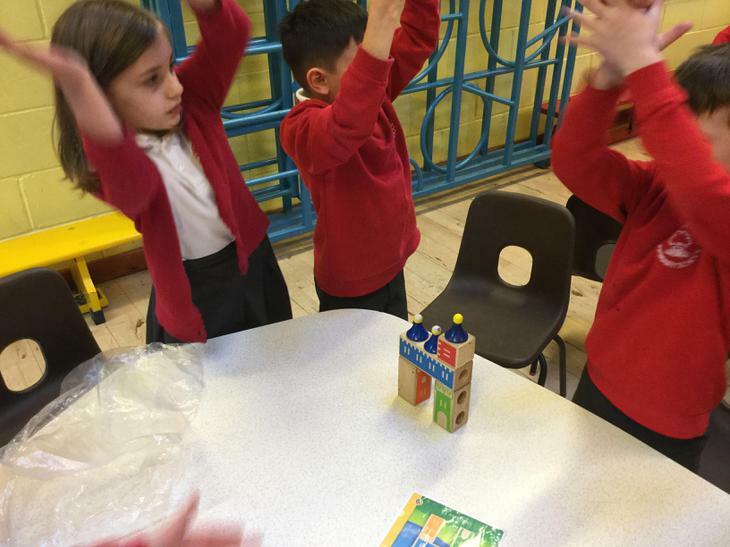 We have been using our cutting and folding skills to make windmills. 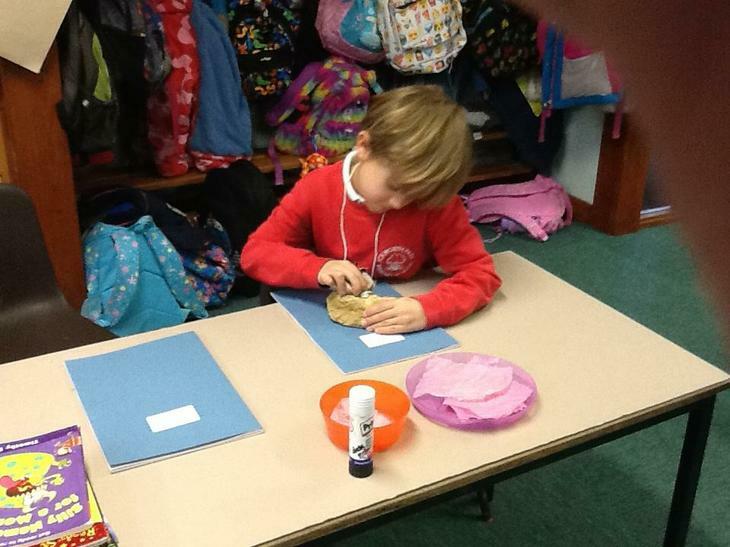 We had lots of fun experimenting using different sized paper. 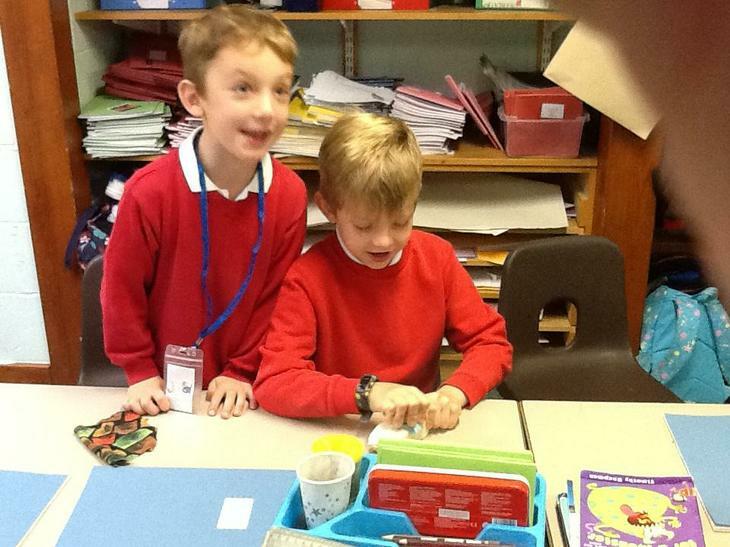 We decorated them with wrapping paper and different Christmas shapes. 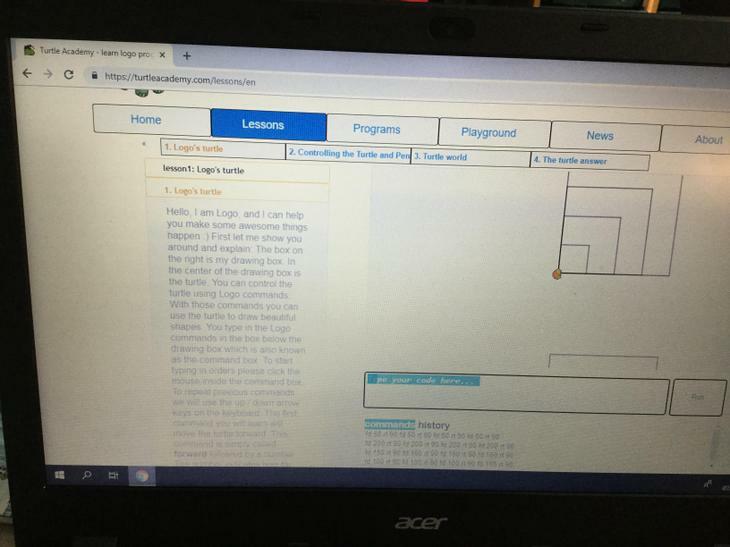 The children are learning to create and debug algorithms, using basic commands in Logo to move and draw using the turtle on screen. 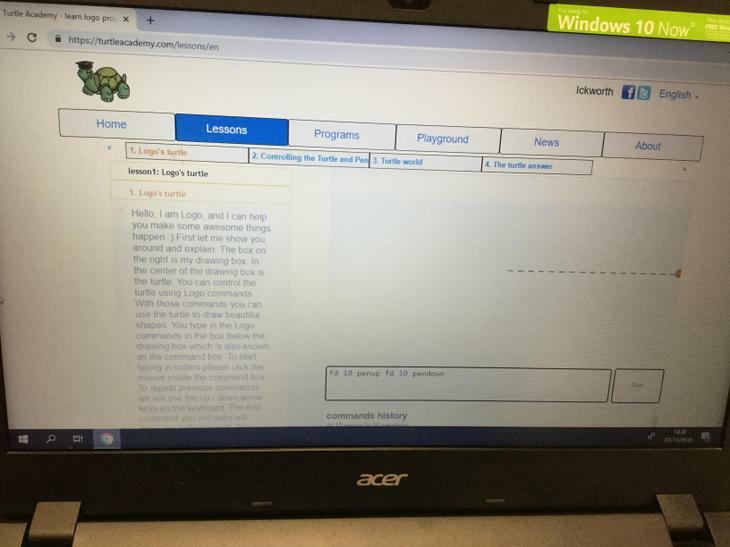 Their skills will develop to allows them to repeat commands and begin to program Scratch 2. 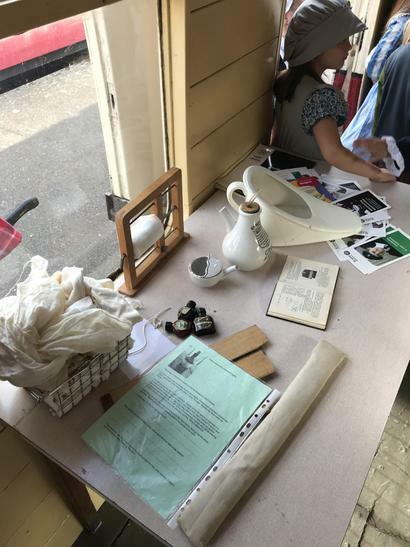 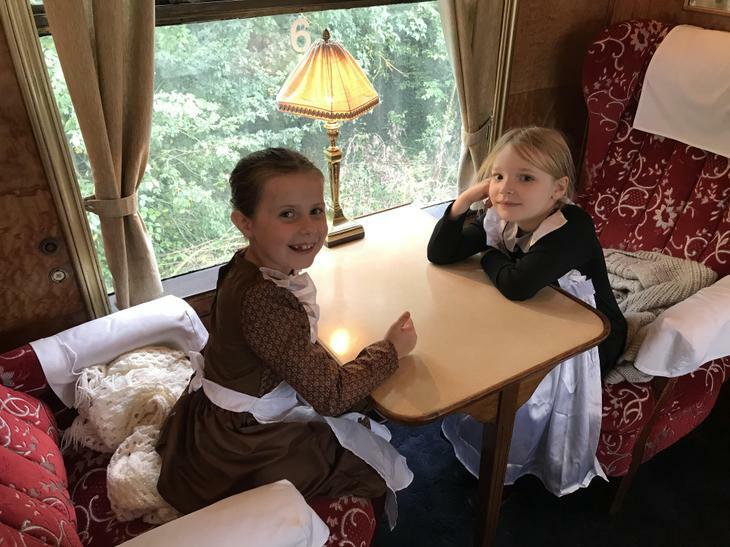 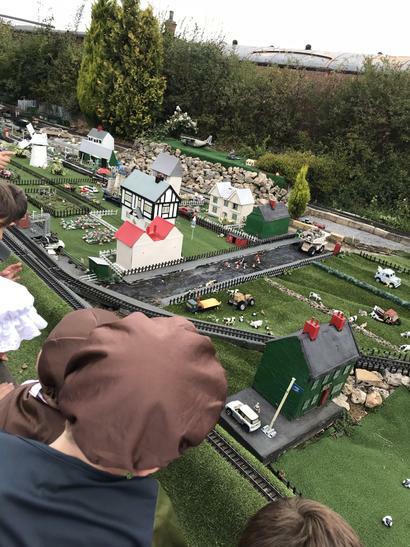 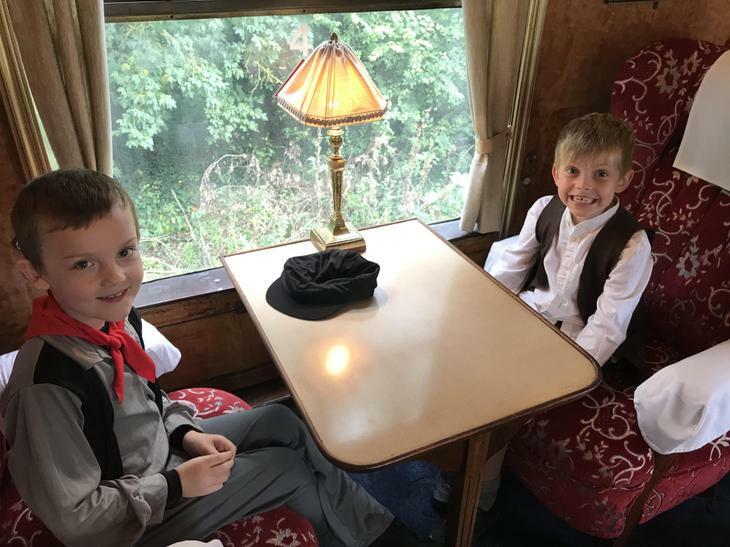 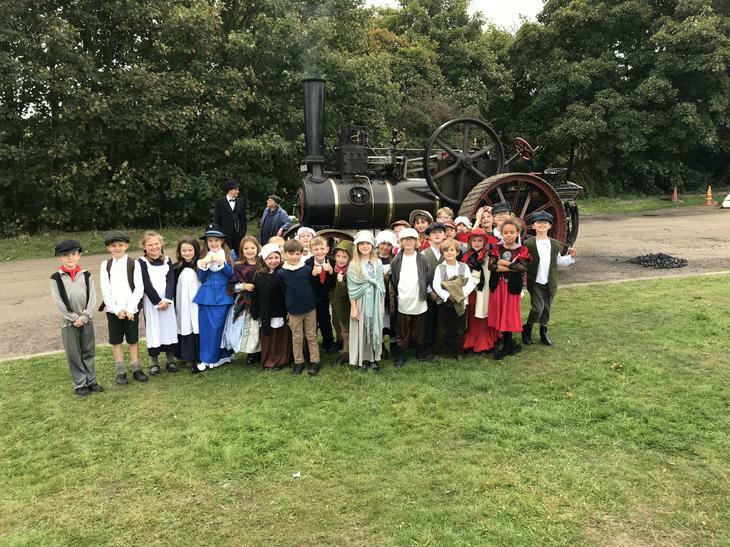 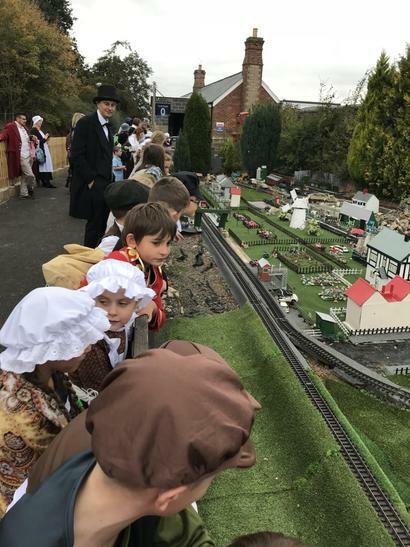 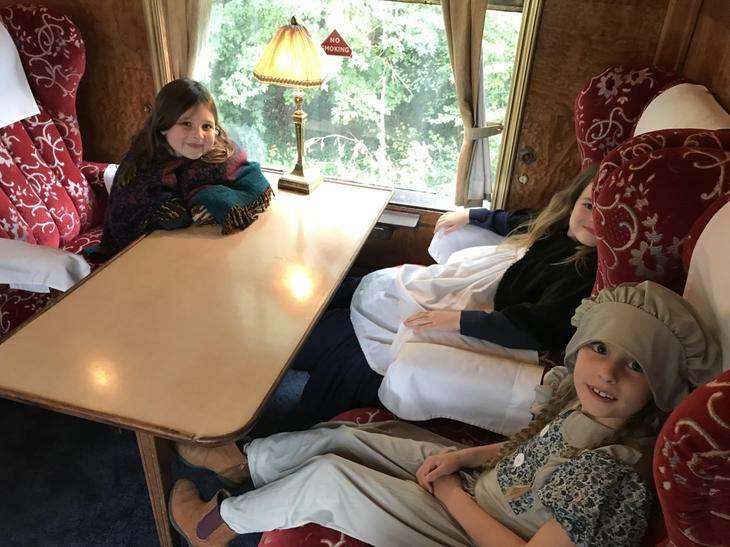 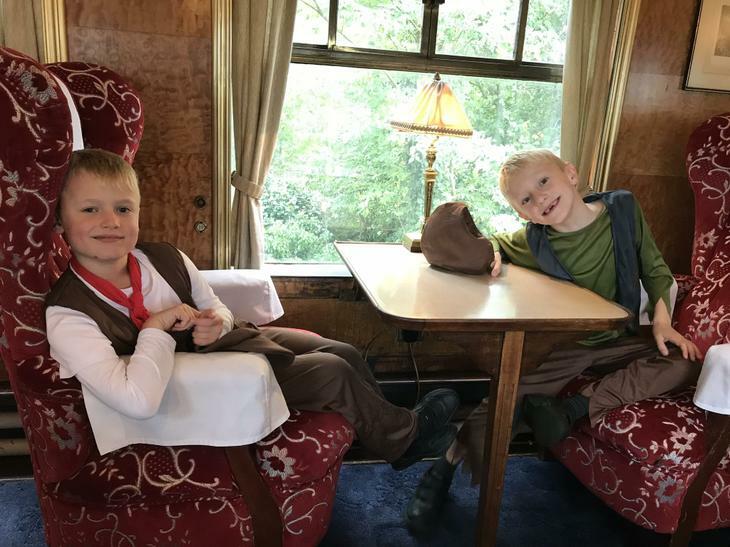 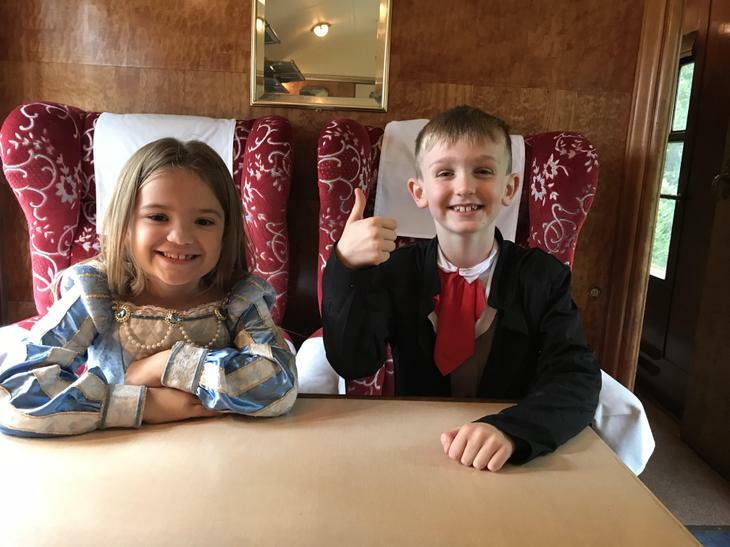 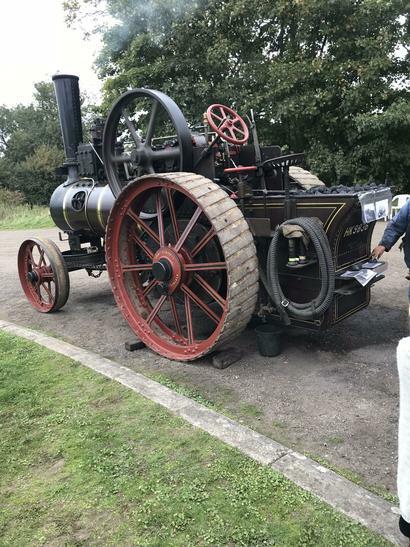 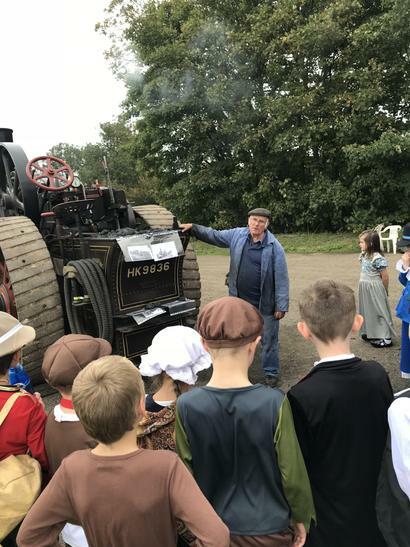 Our topic this term is ‘Victorians.’ We had a great time on our school trip to Colne Valley Railway. 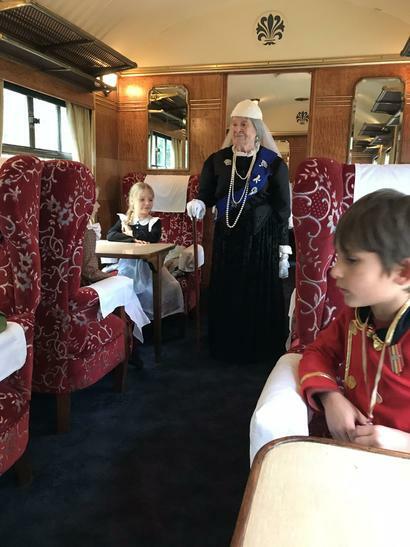 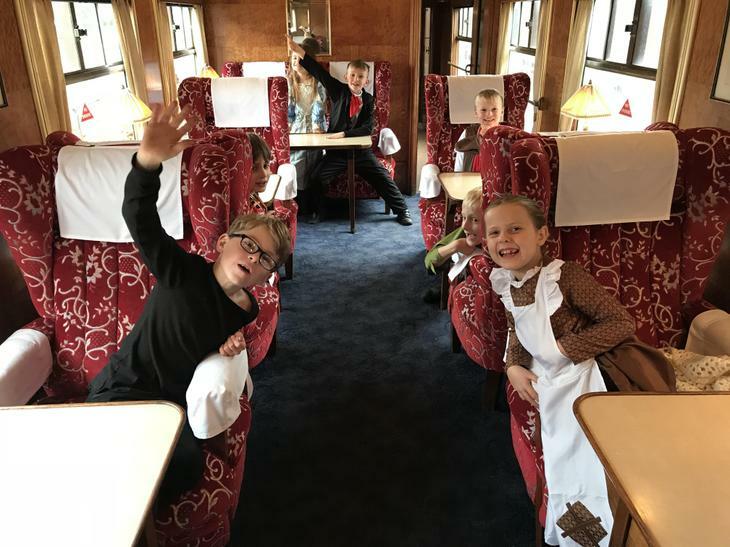 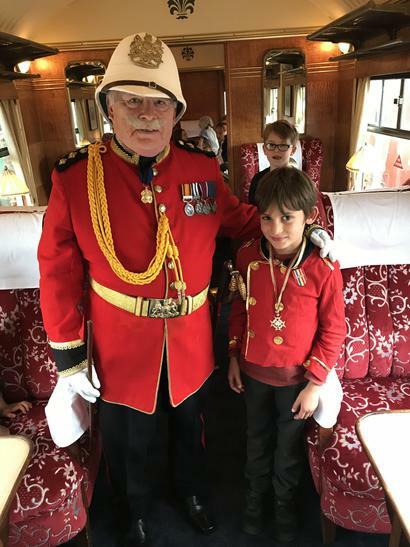 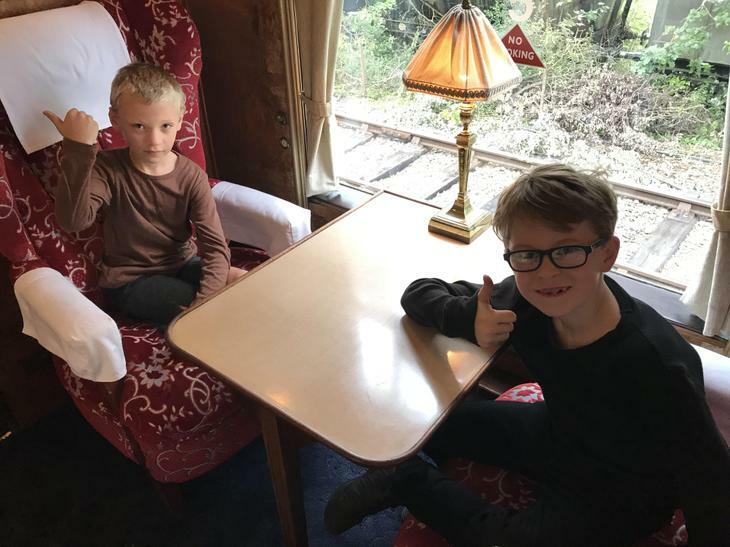 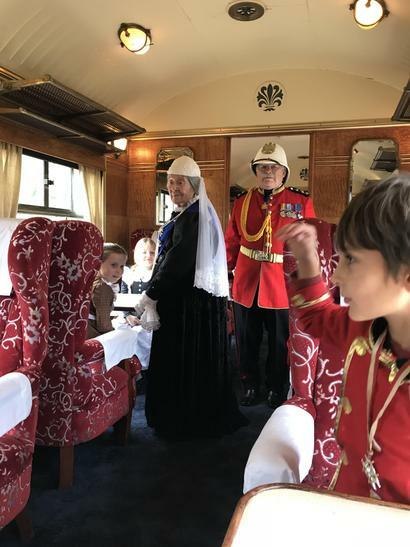 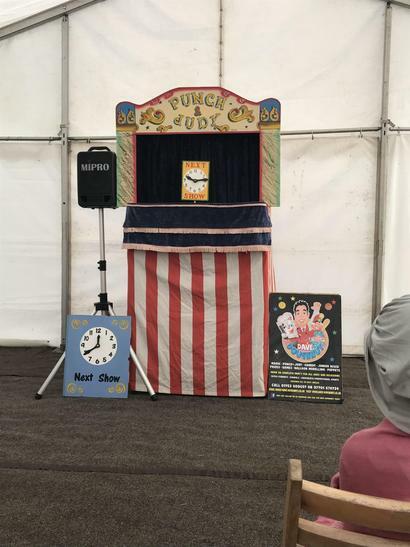 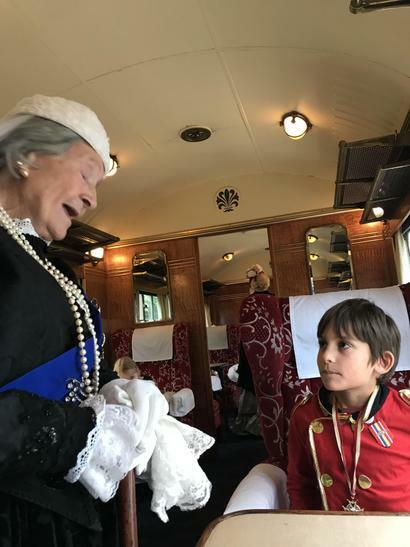 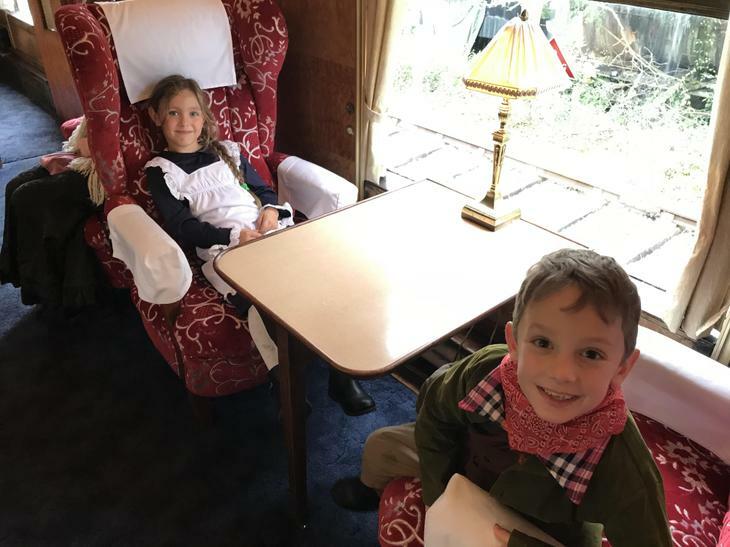 We got to watch a Punch and Judy show, ride on a steam train and even meet Queen Victoria herself! 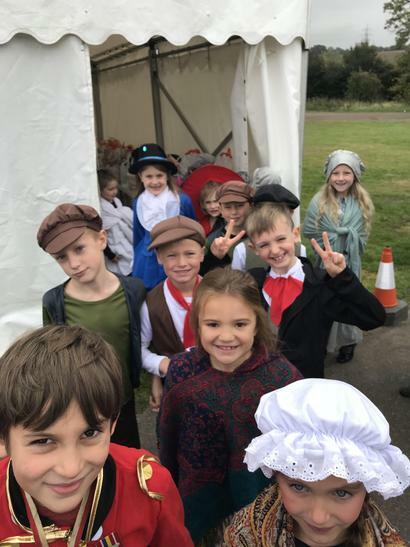 We think we looked fabulous all dressed up in our Victorian costumes too! 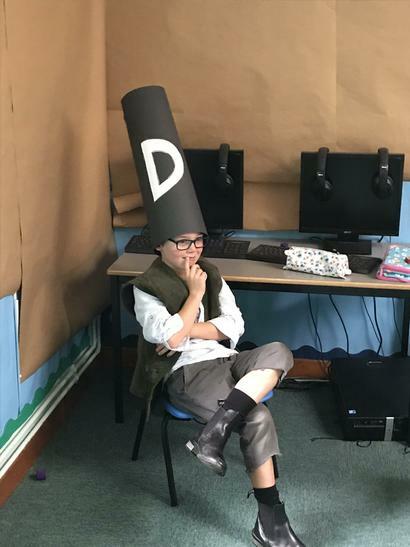 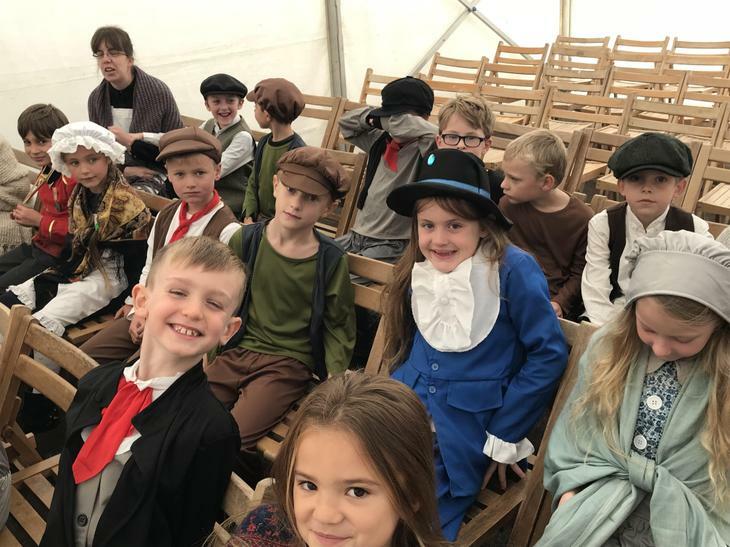 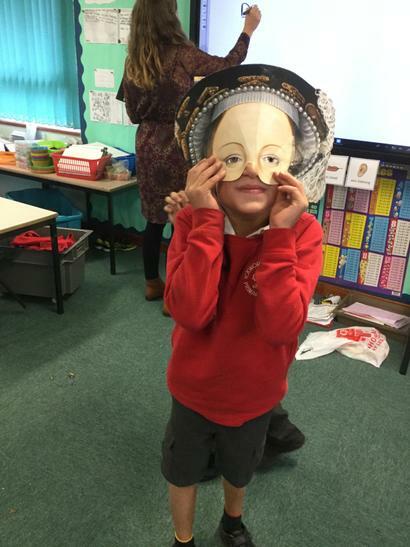 When we got back to school, we got to continue wearing our costumes for the rest of the week and had lots of different Victorian style lessons. 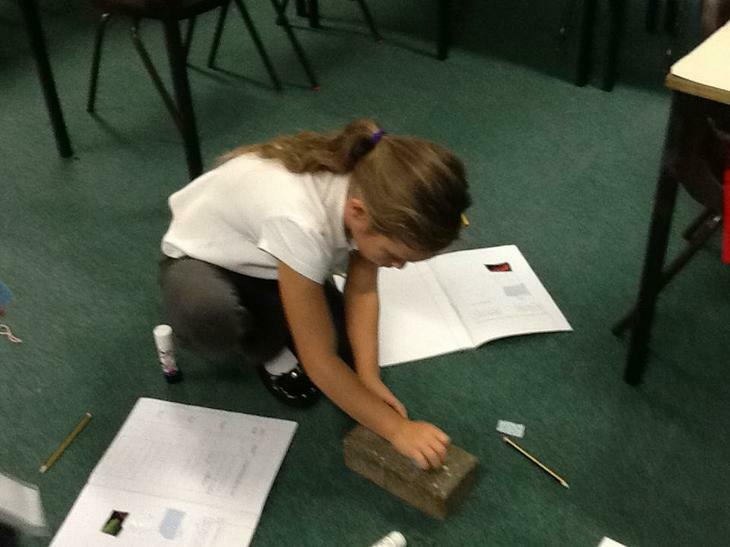 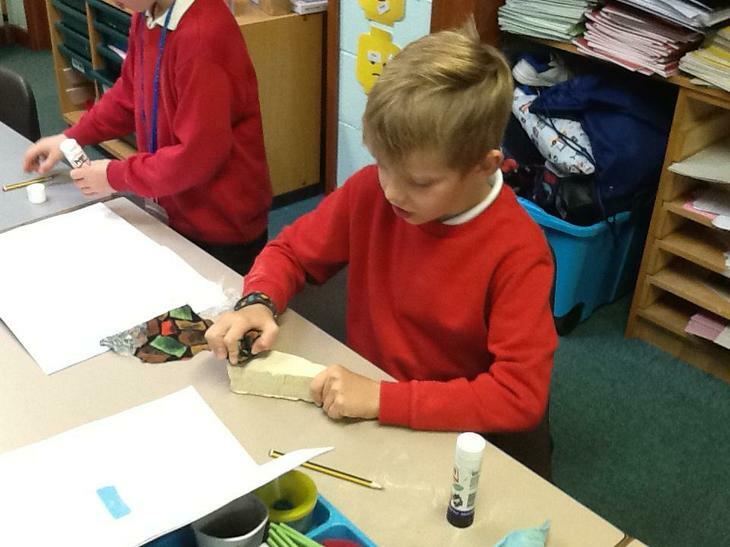 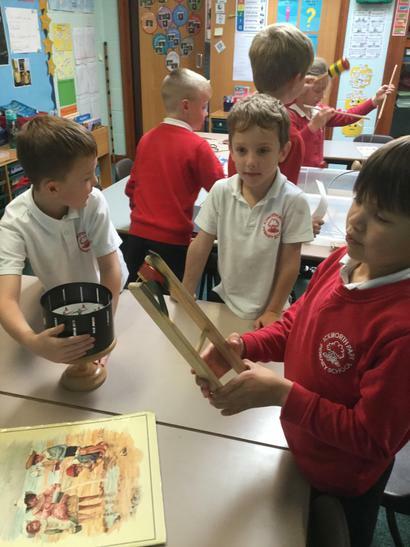 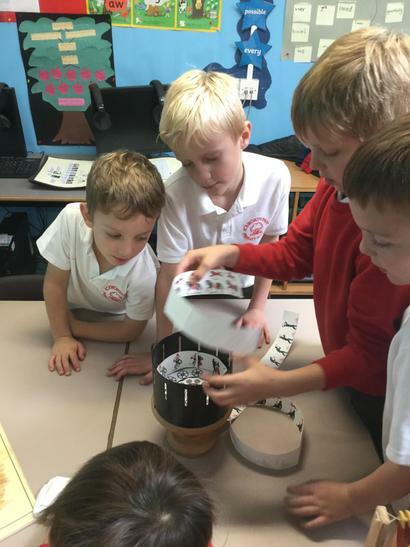 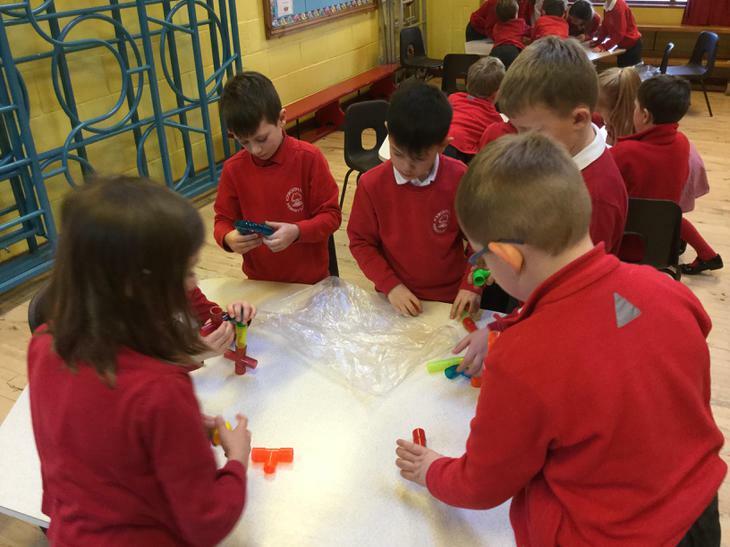 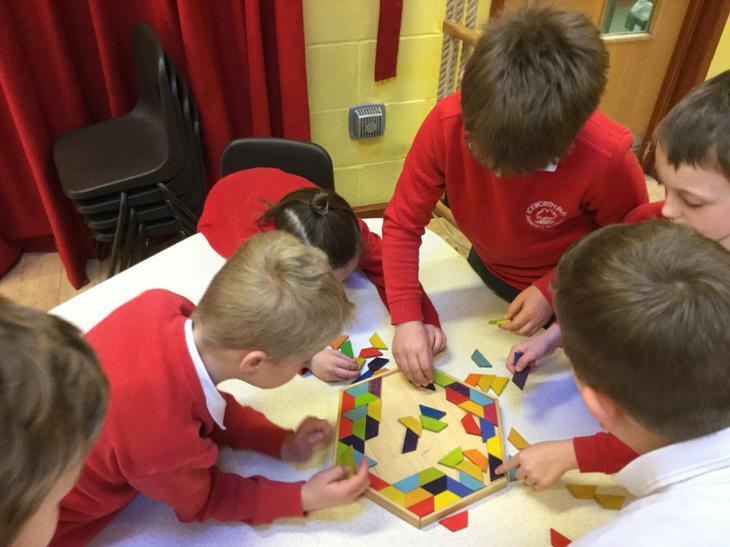 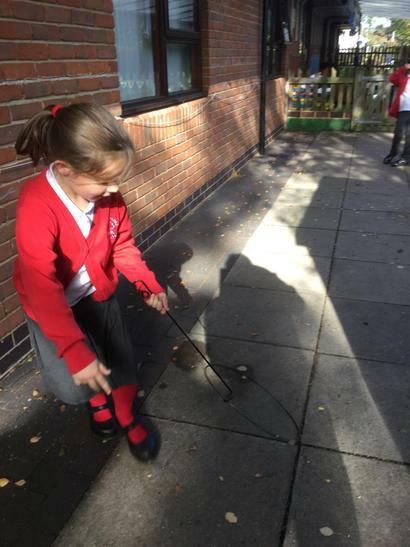 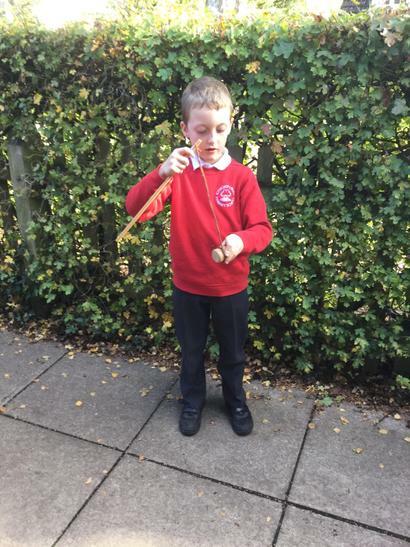 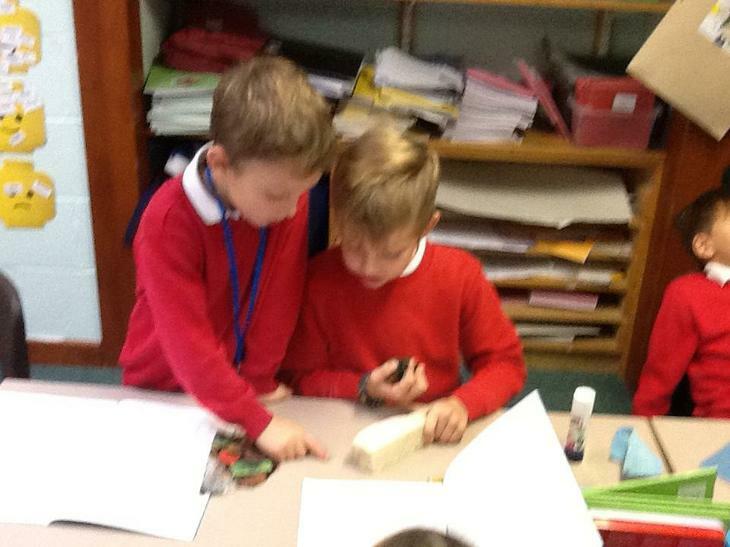 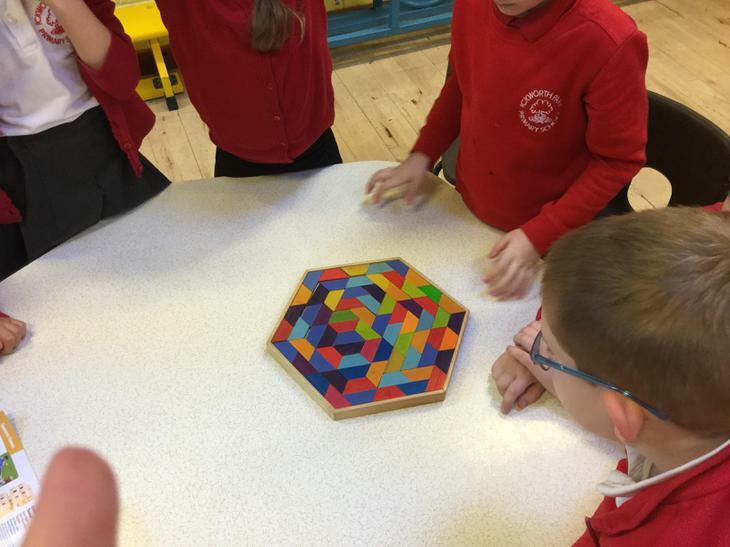 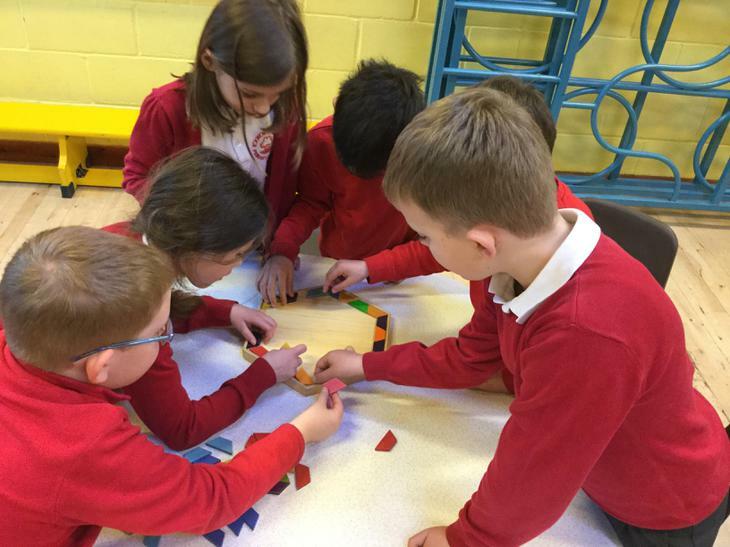 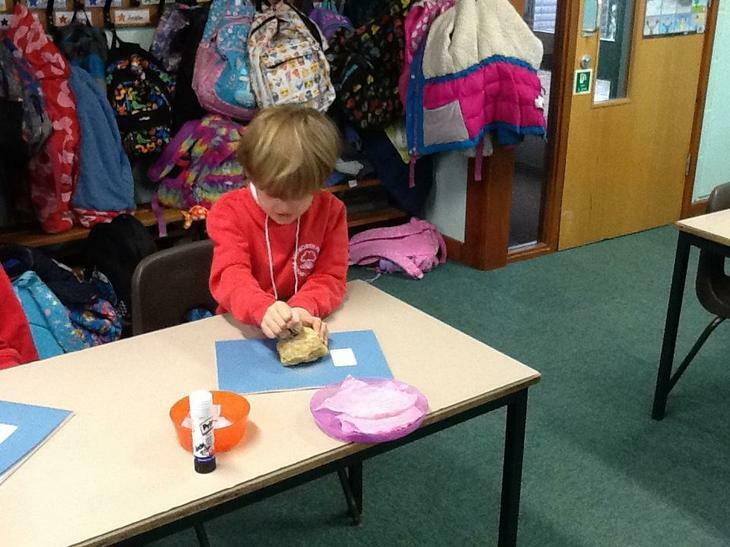 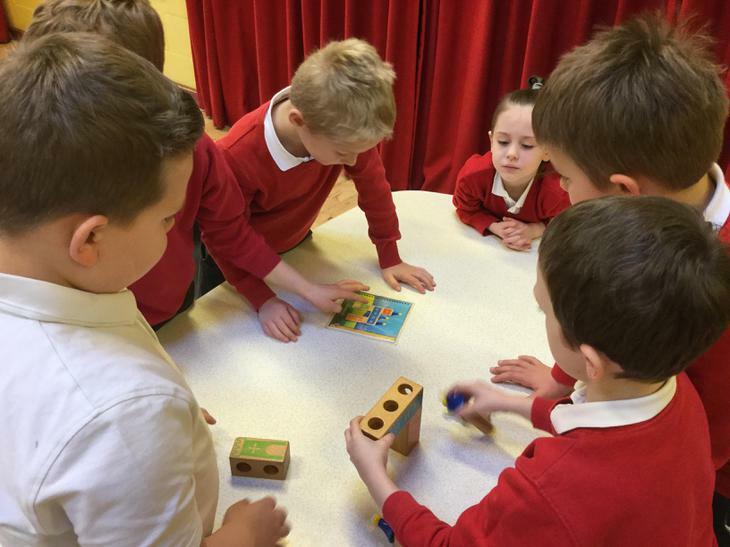 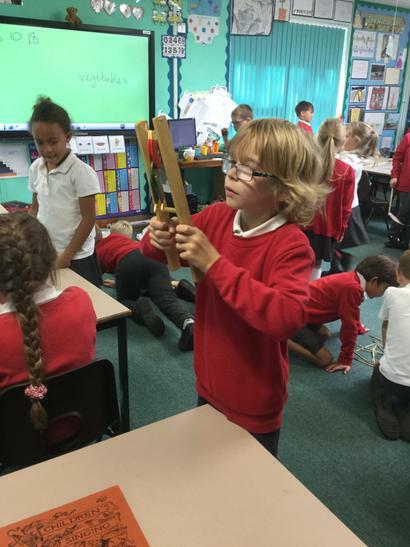 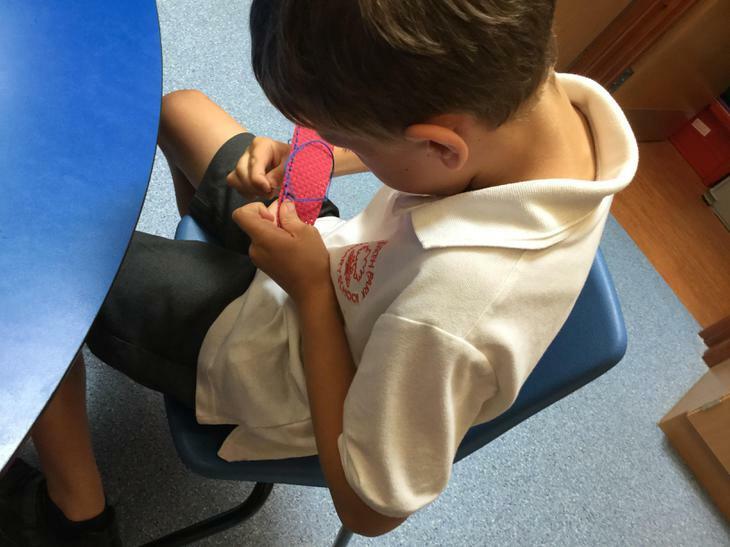 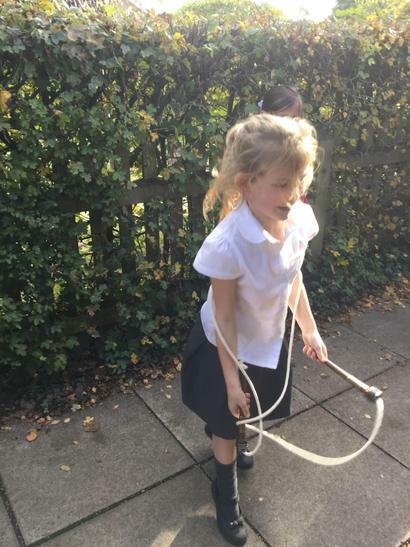 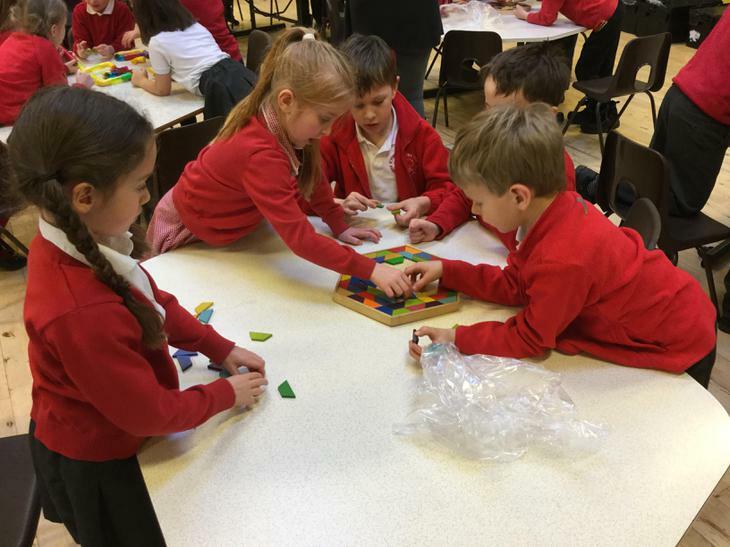 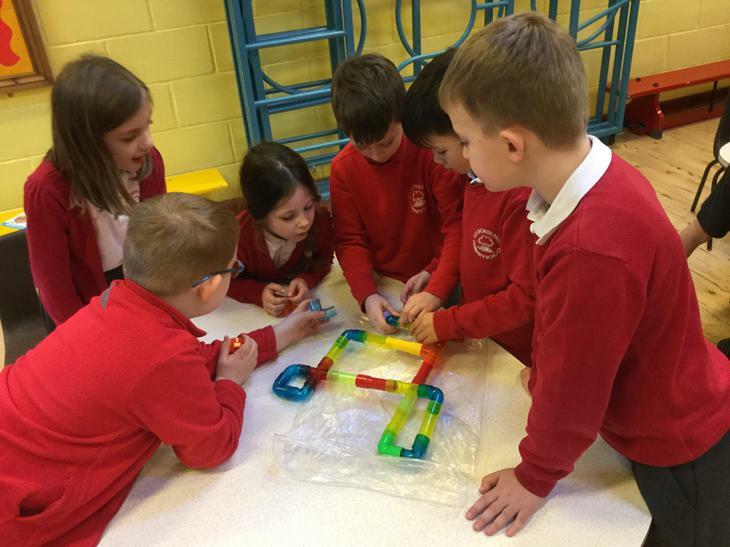 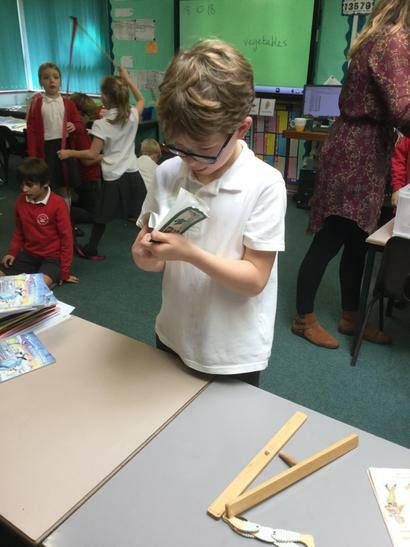 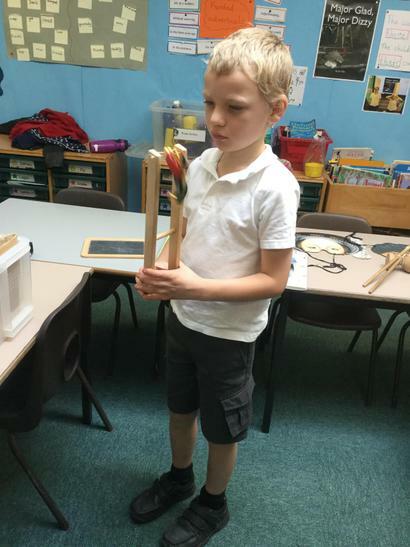 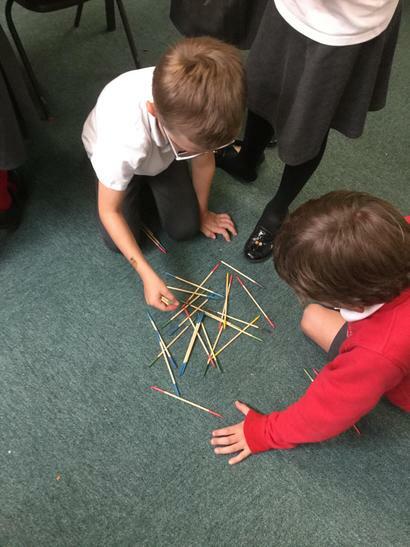 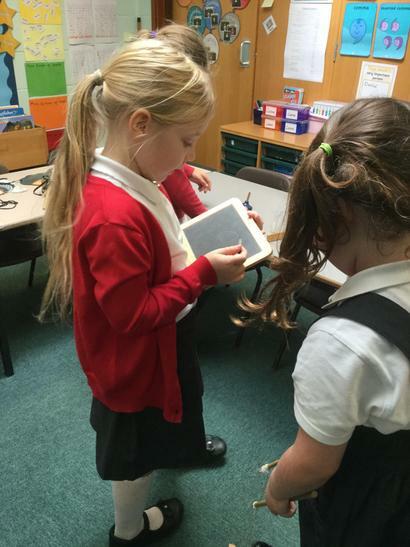 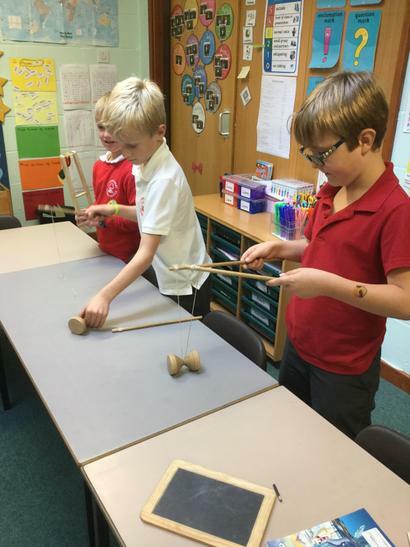 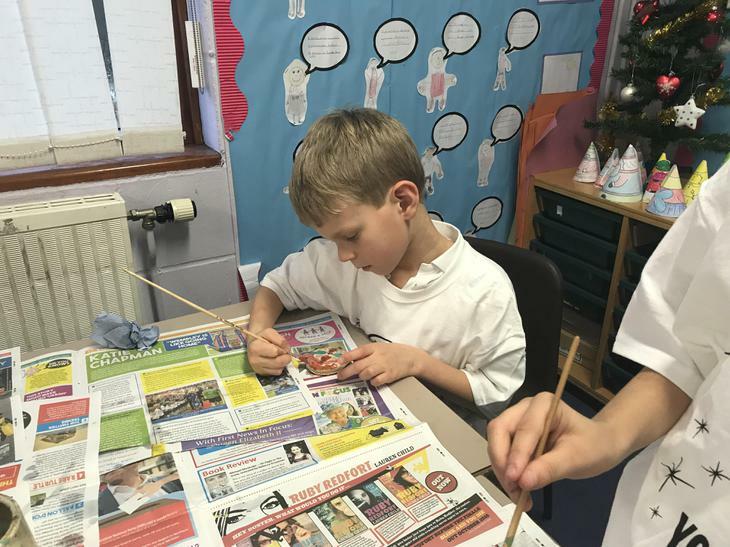 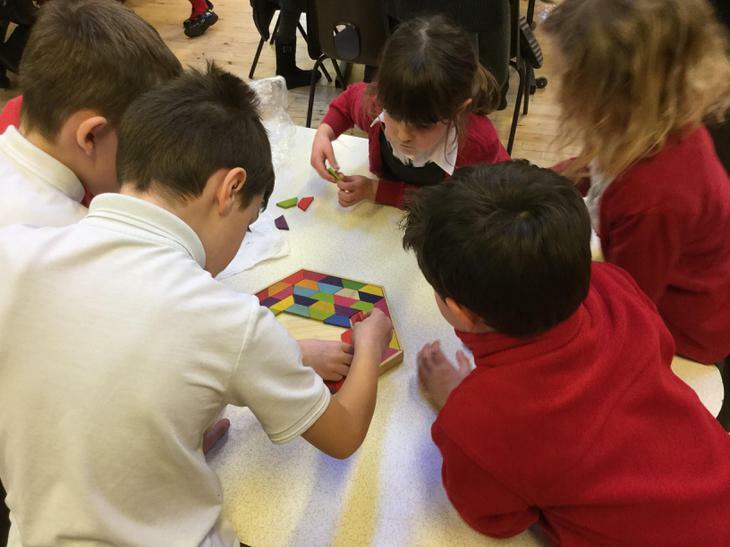 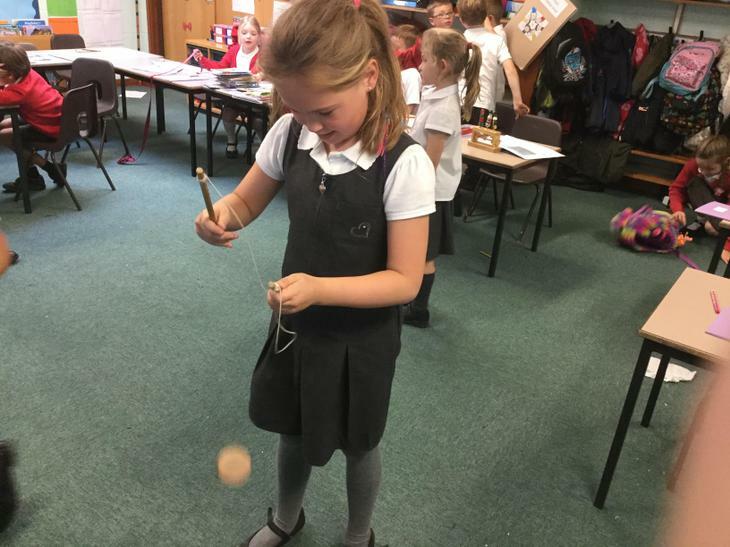 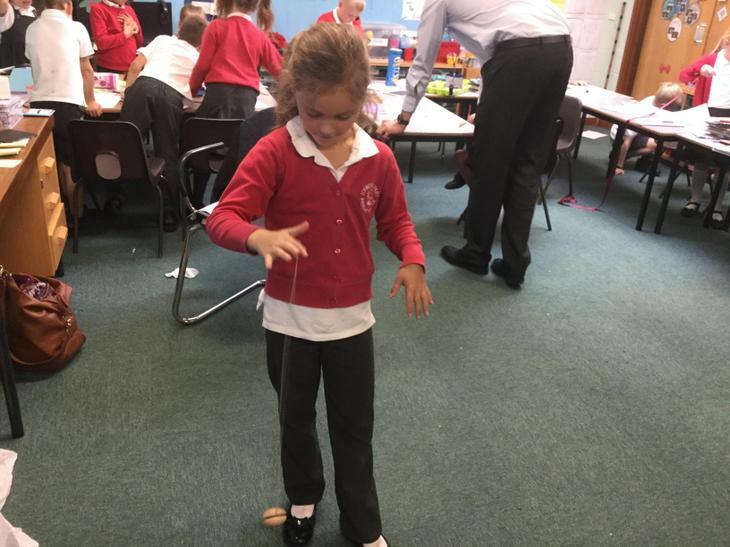 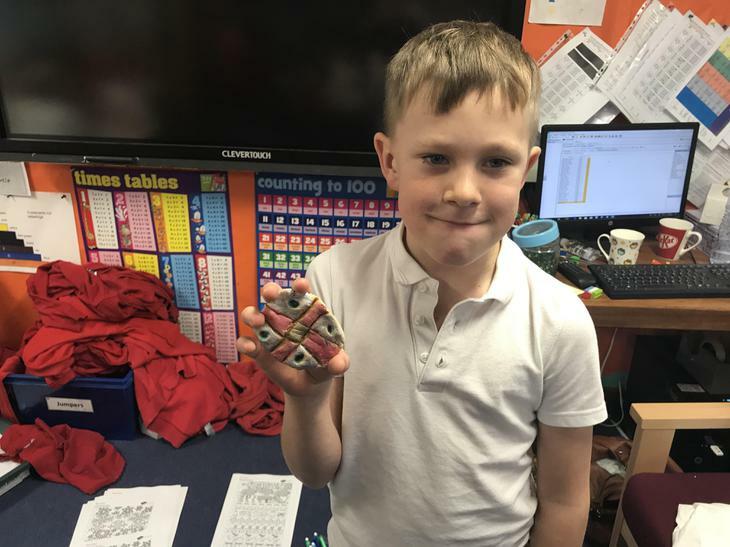 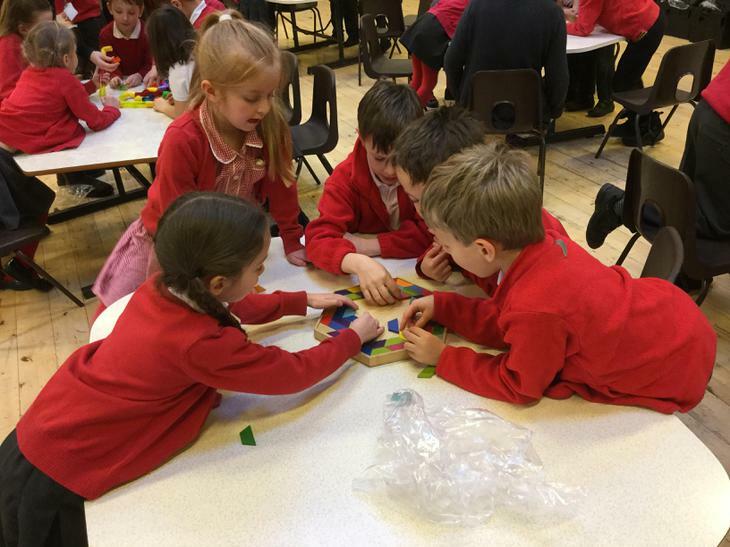 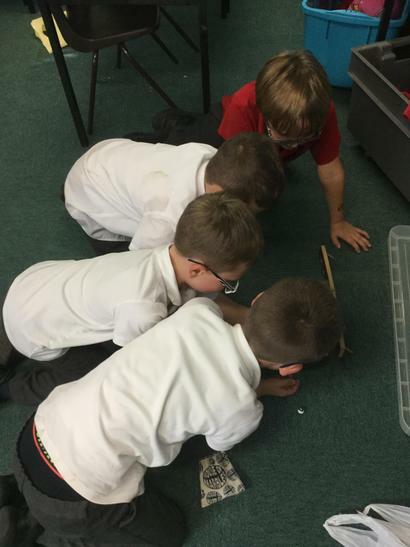 In year 2 we have been testing different materials. 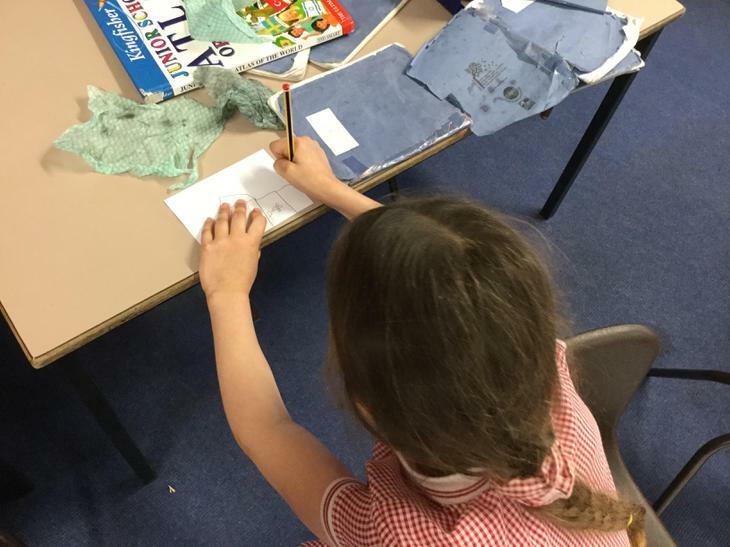 In this experiment we were testing which material would be best to make dungarees. 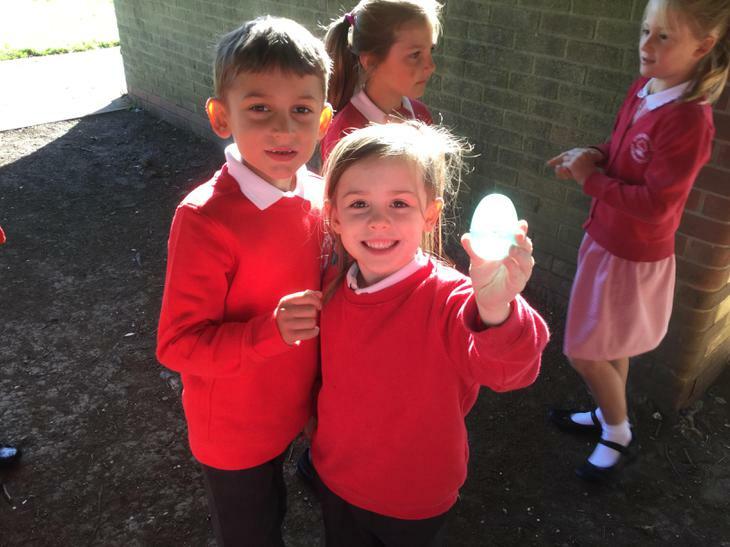 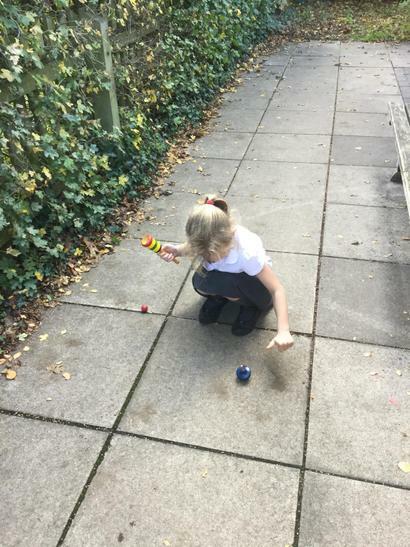 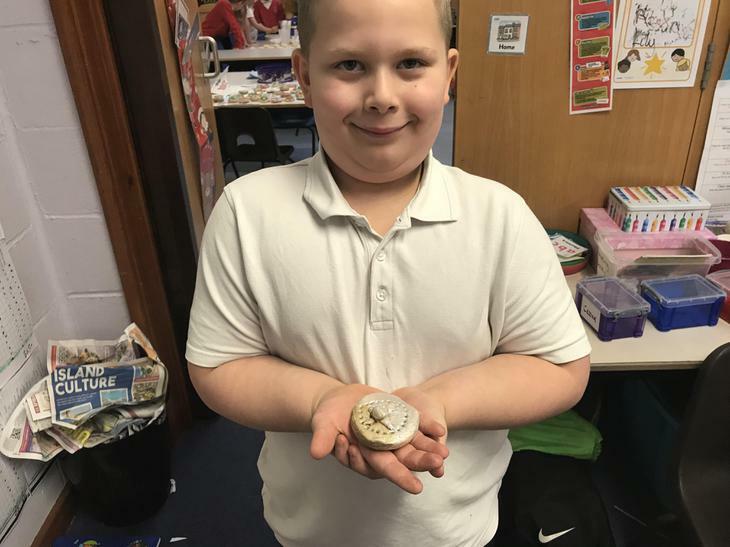 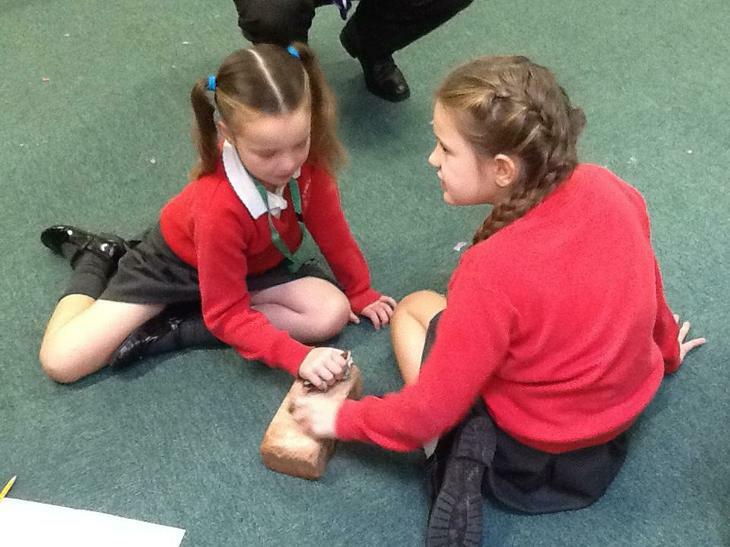 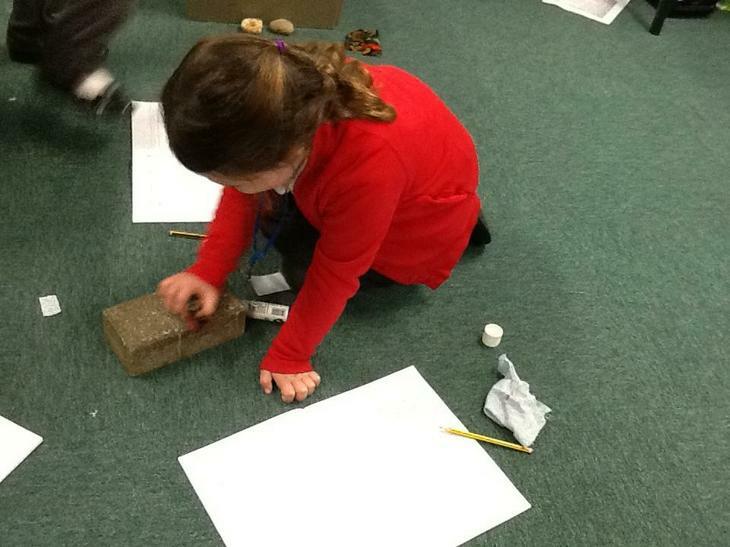 We thought about the properties of the different materials to predict which one we thought would be the best and then tested them by rubbing them onto stones and bricks to see how many rubs it took to make a hole in them. 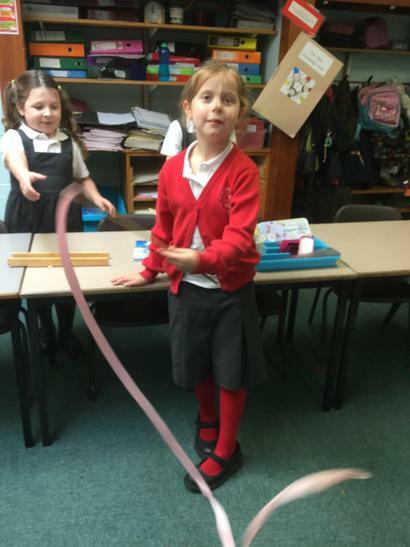 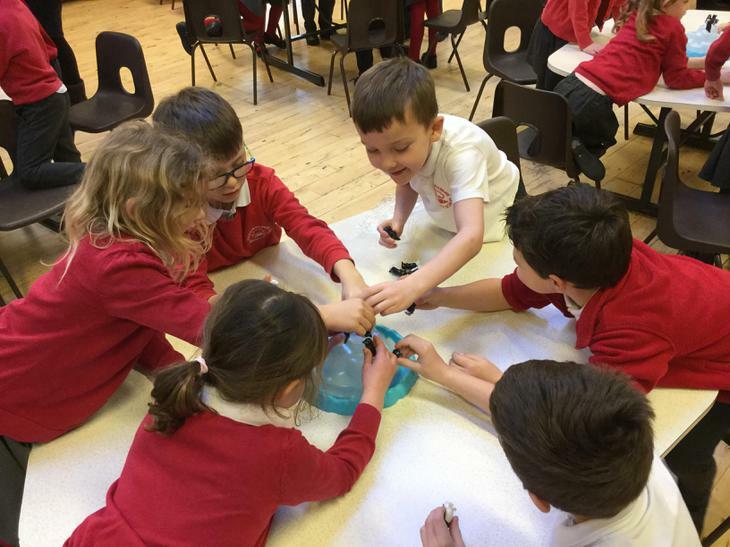 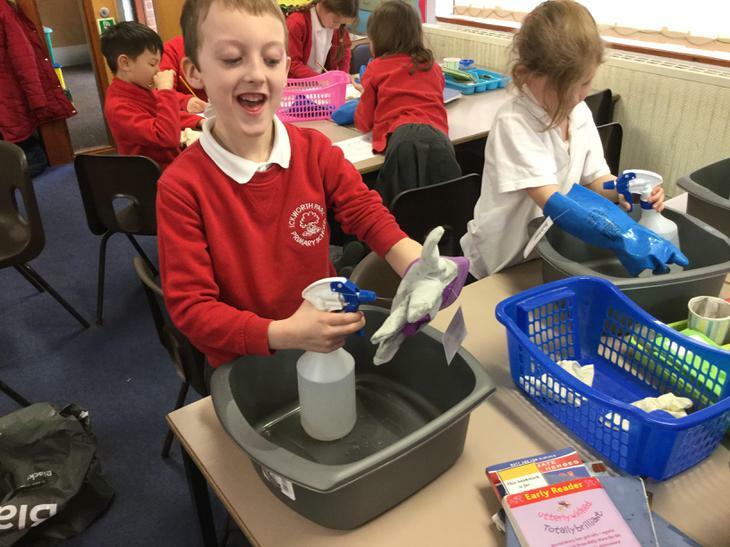 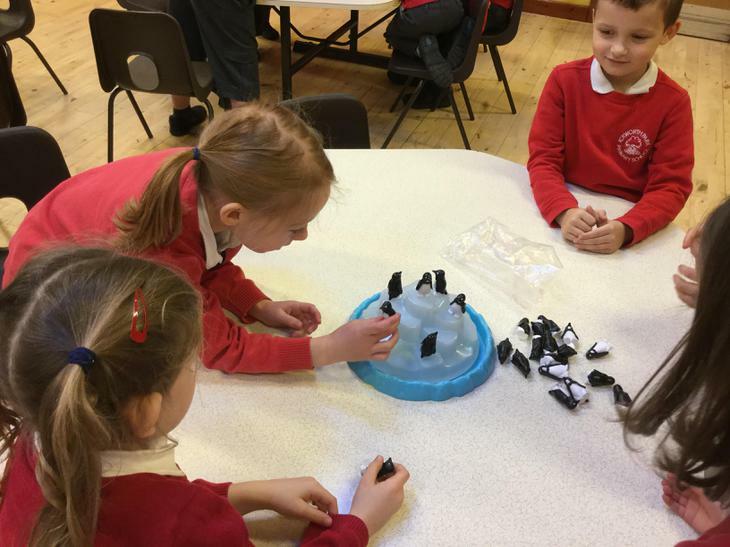 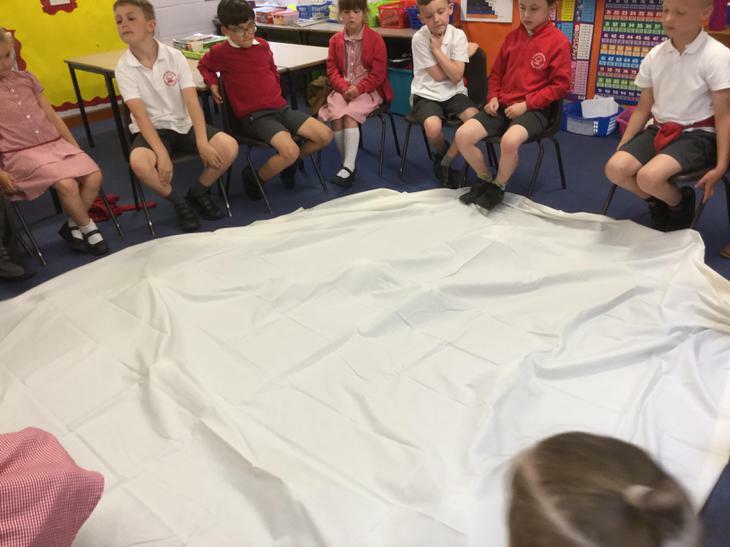 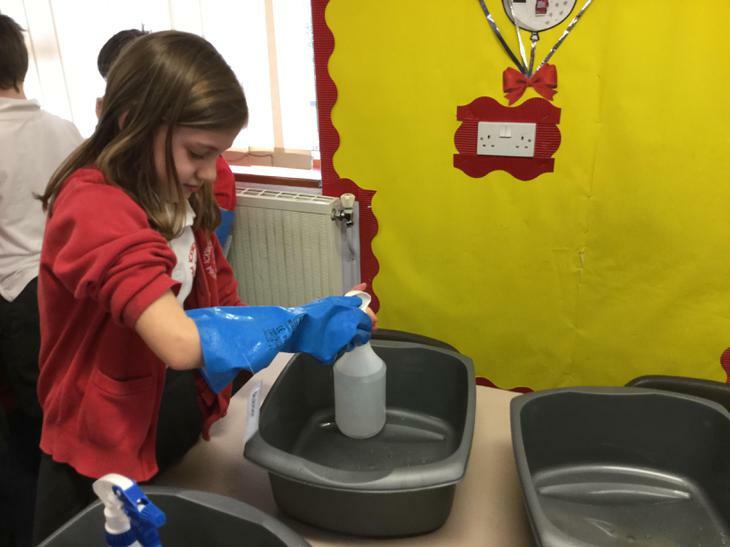 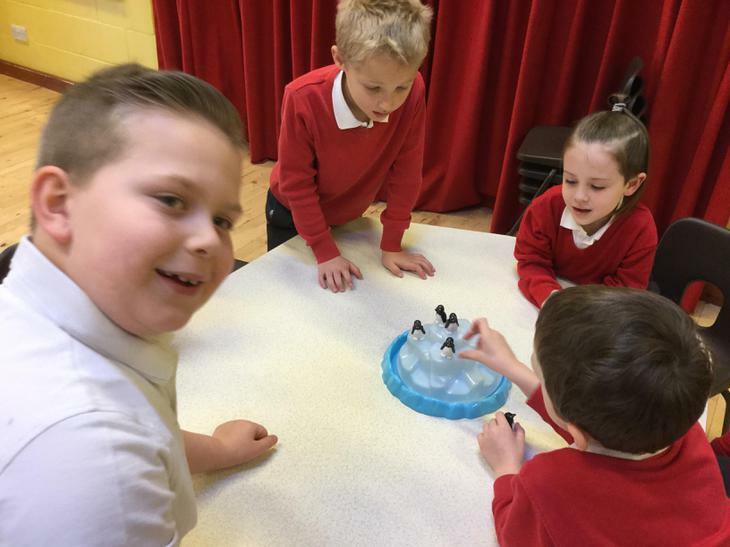 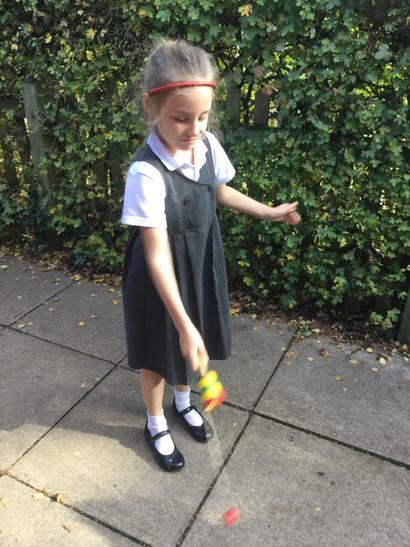 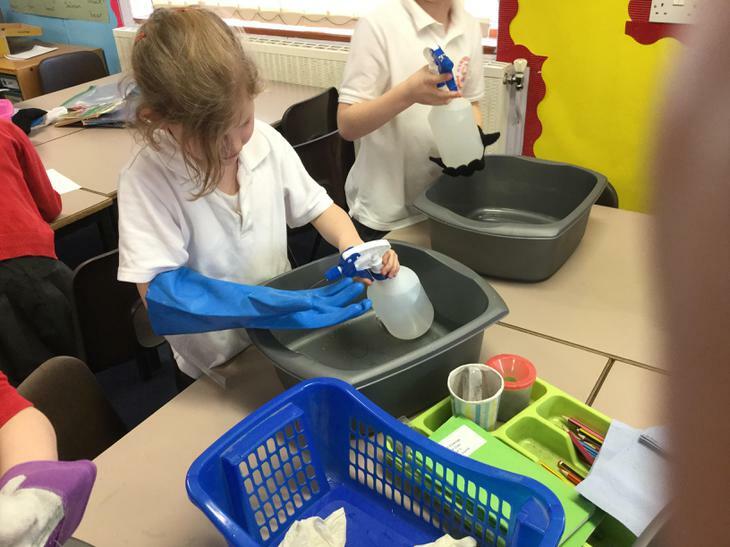 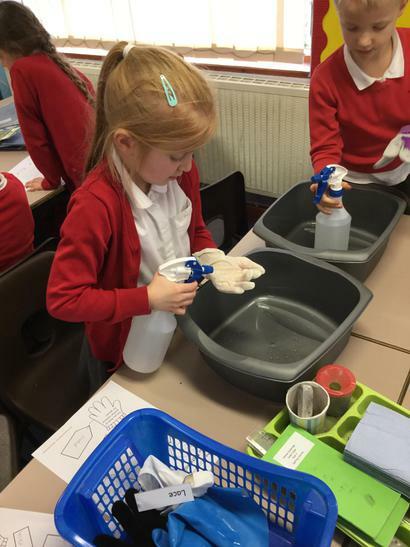 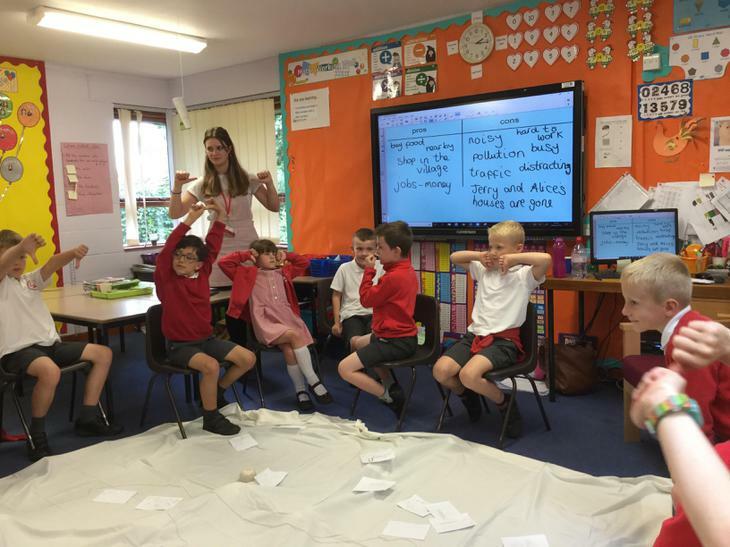 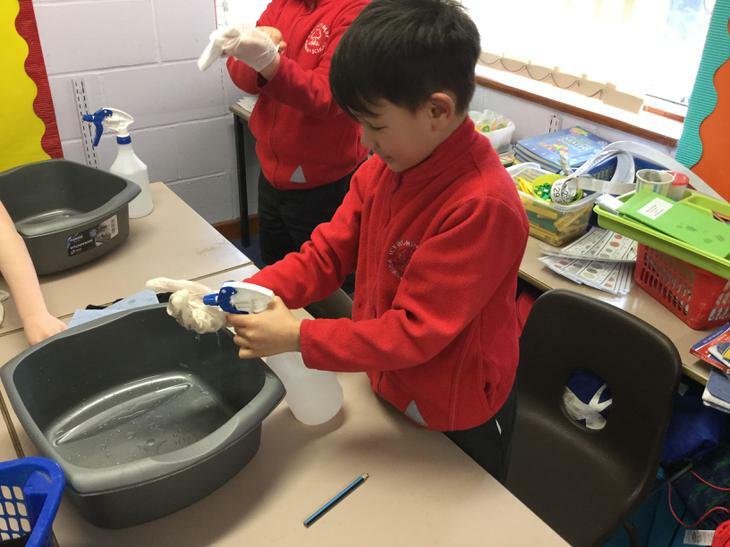 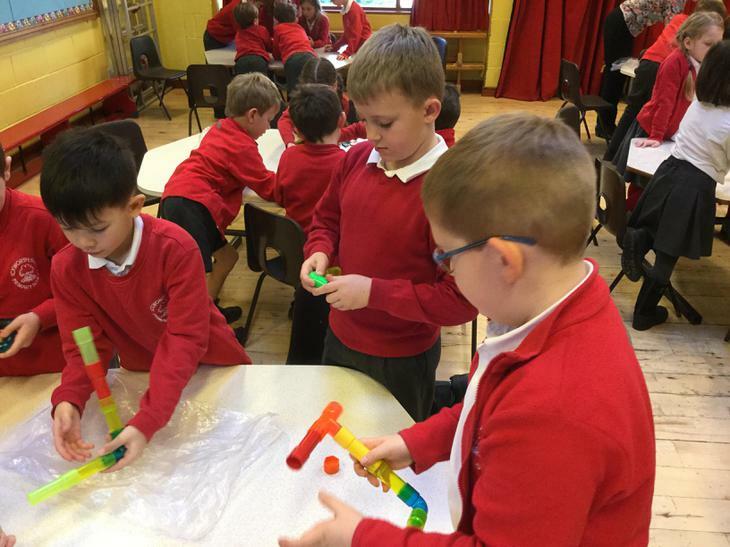 In year 3 we are learning about solids, liquids and gases. 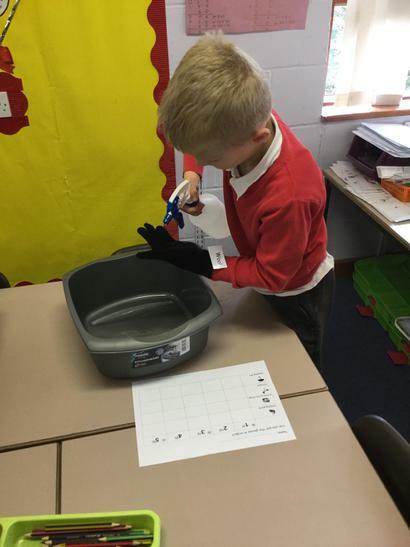 We have made up our own investigation whereby we are going to test different ice shapes to see which will melt the fastest. 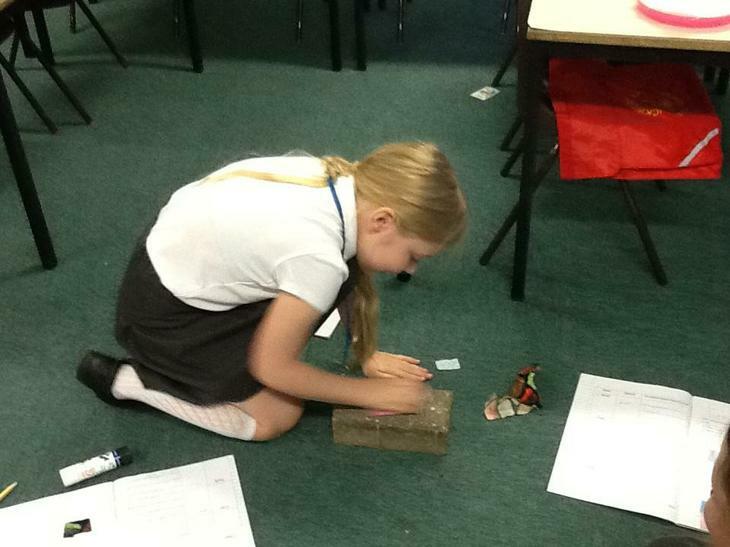 We have all made predictions and have thought carefully about the variables so that we make it a fair test. 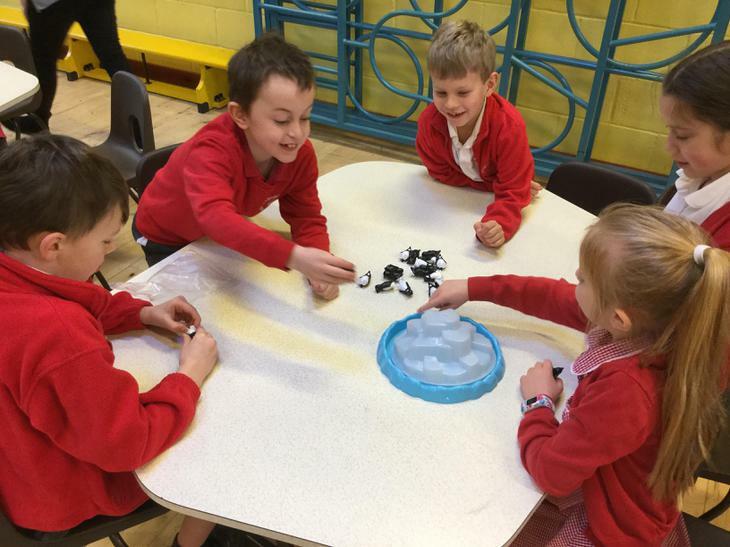 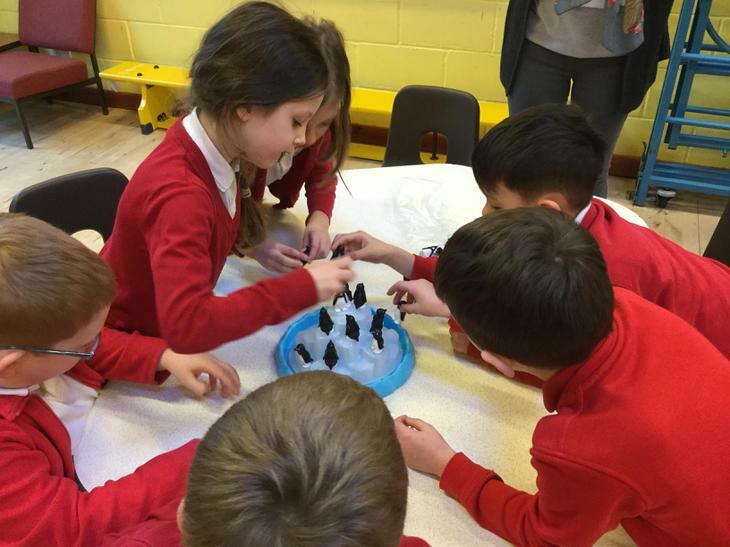 At the moment our ice shapes in the freezer but we can't wait to carry out the experiment after half term! 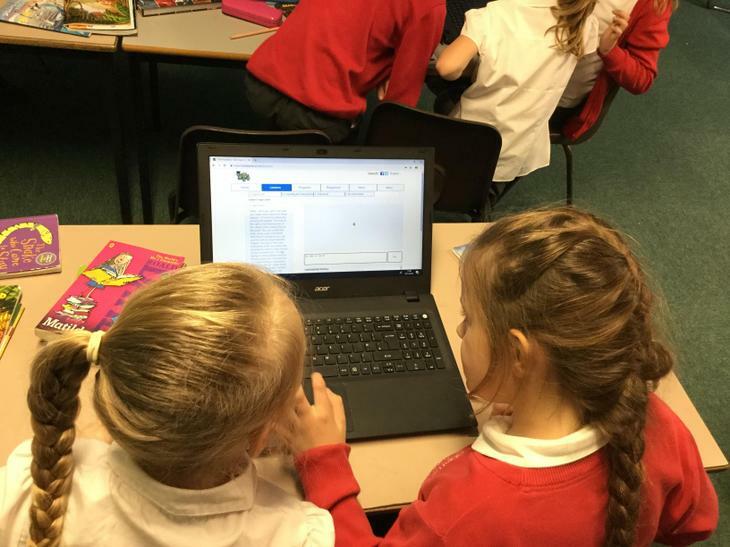 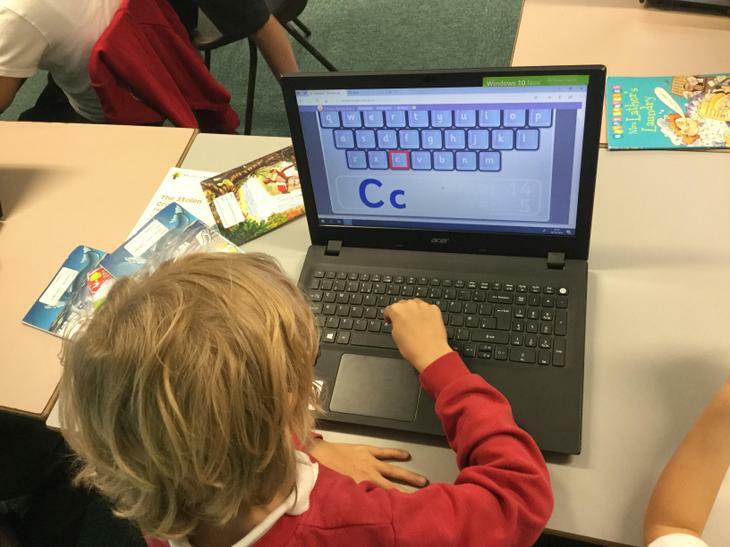 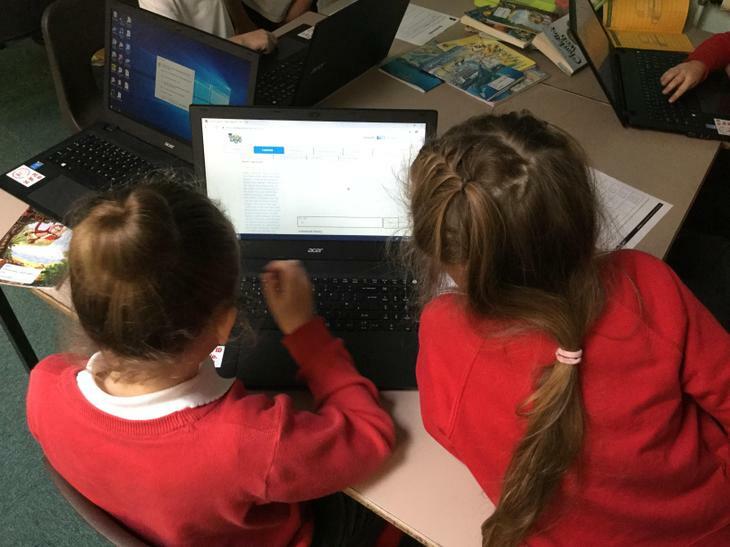 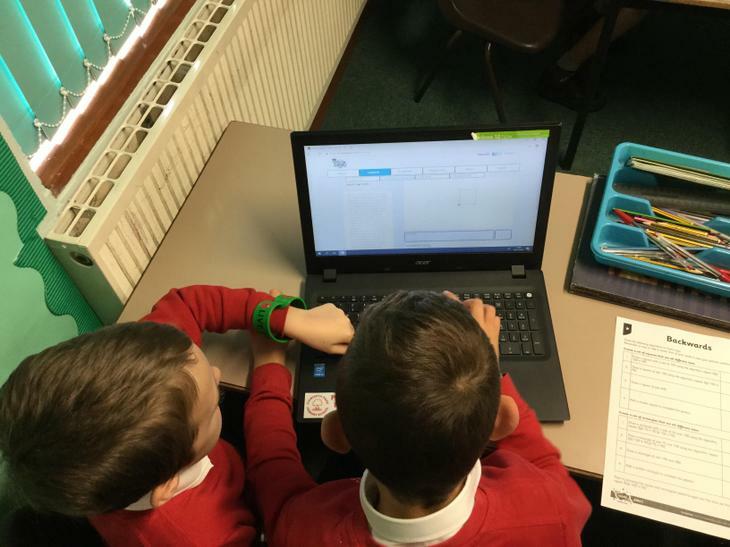 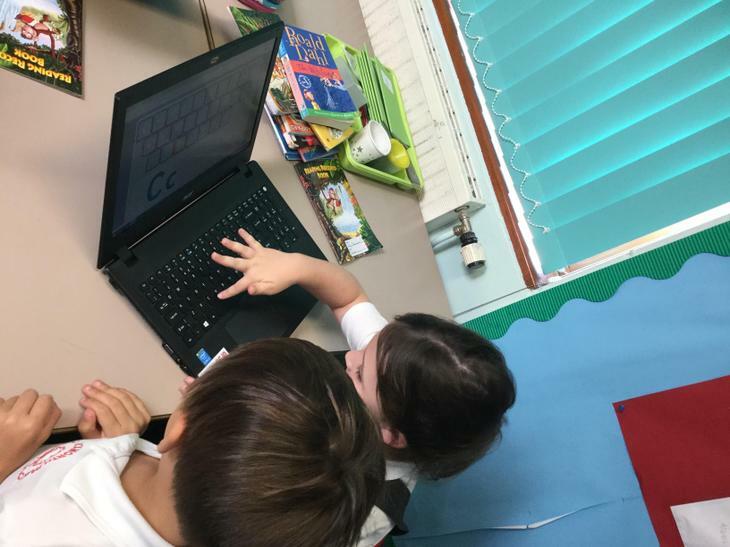 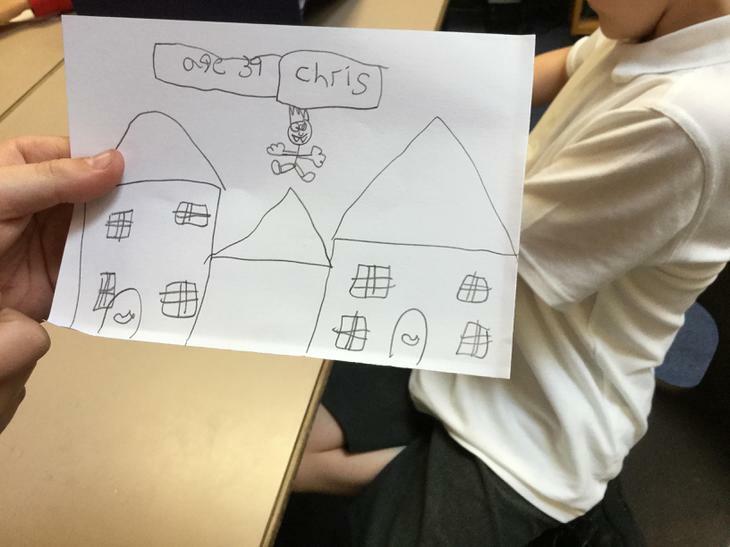 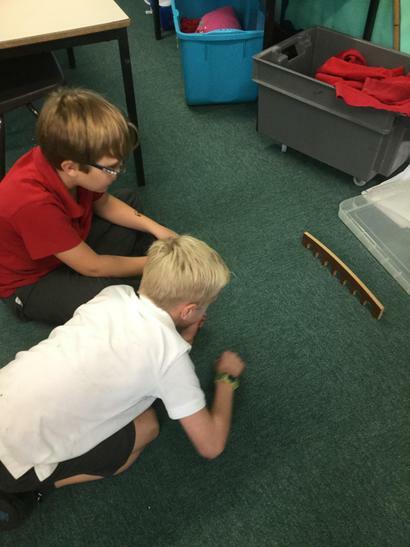 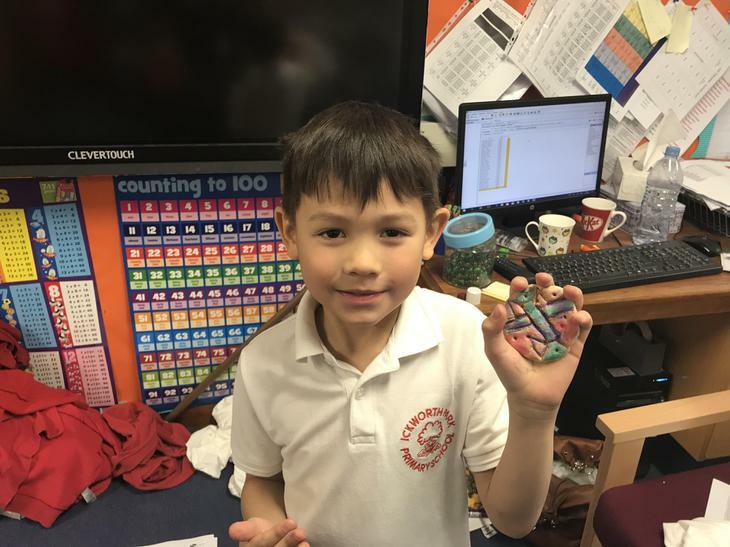 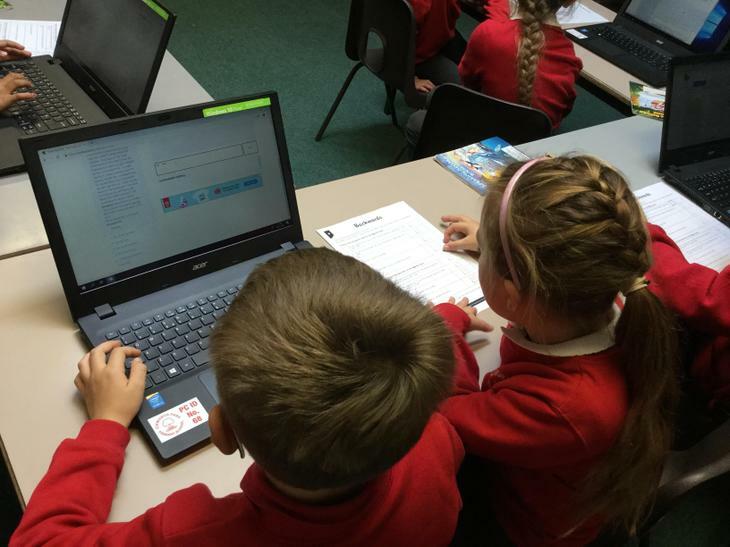 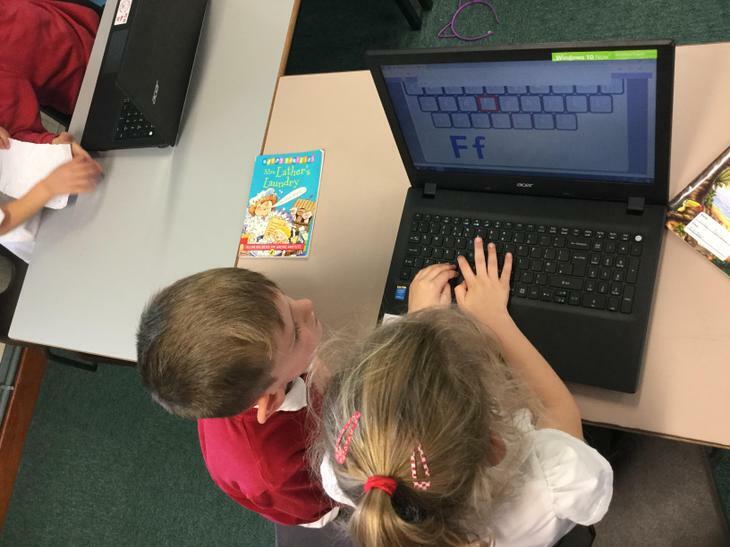 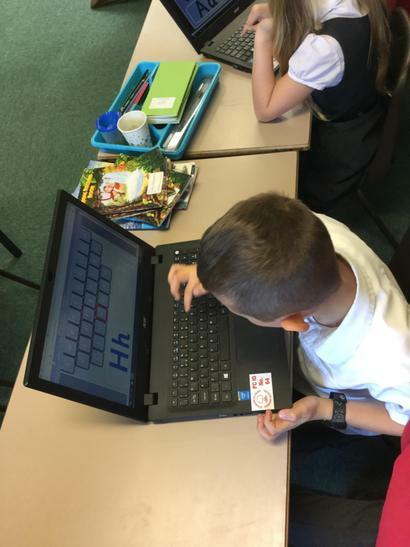 In ICT, Cedar class have been practising logging on to the computers using their own username and password, learning keyboard skills and having a competition to see who can locate the letters quickest. 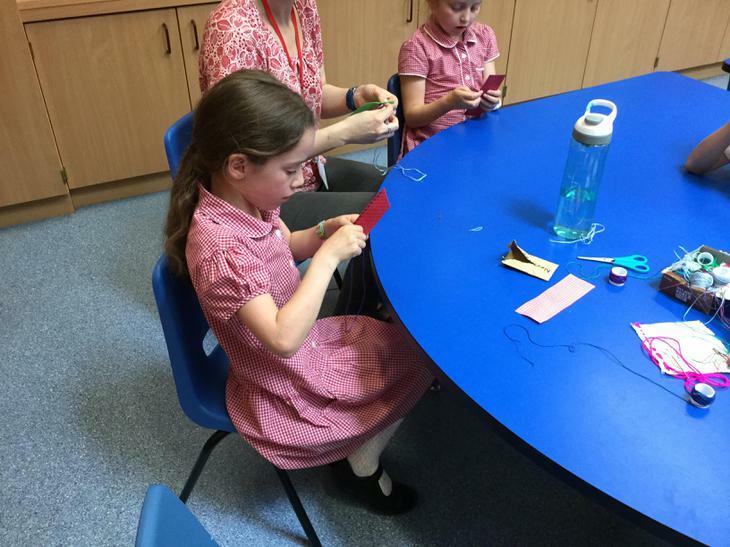 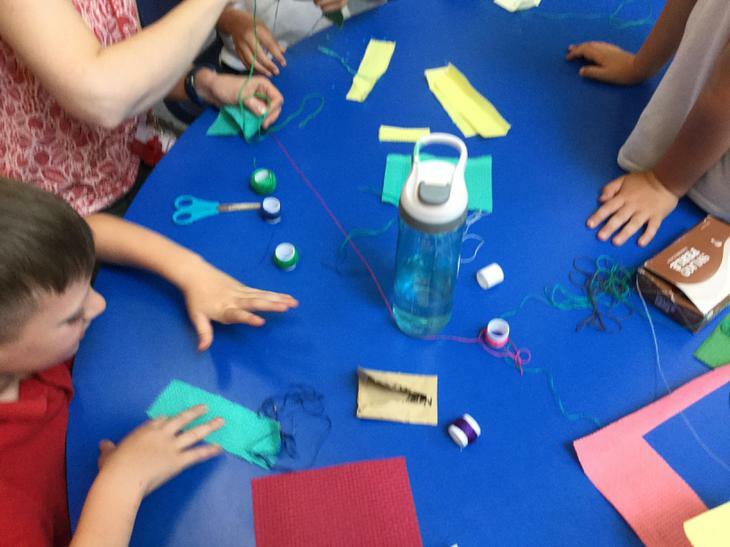 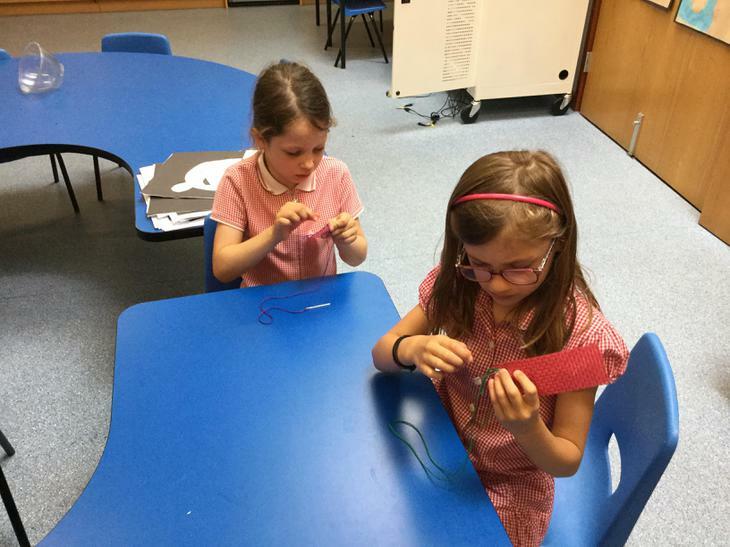 We have been practising our sewing skills by making book marks. 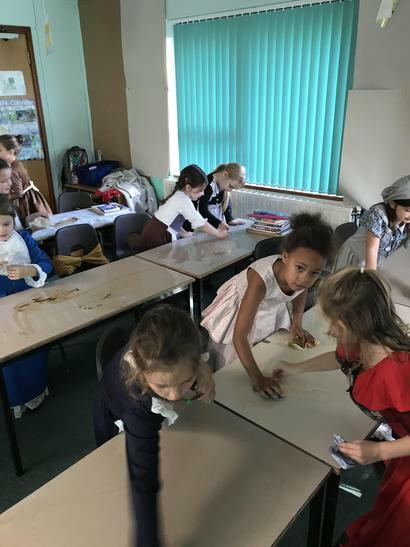 As part of our topic work this term, we have built our own version of Horringer village and made up characters that live there. 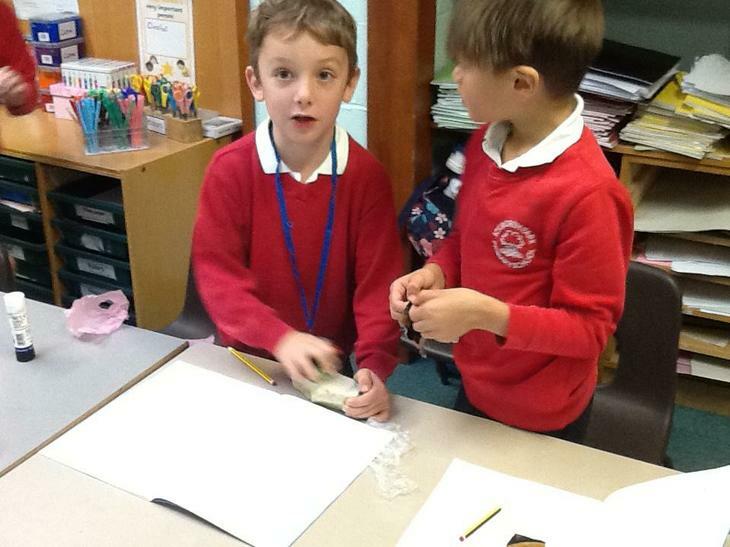 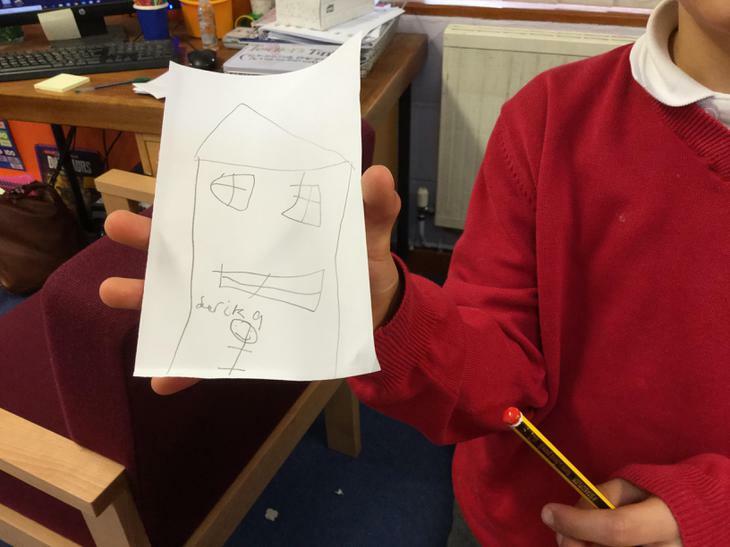 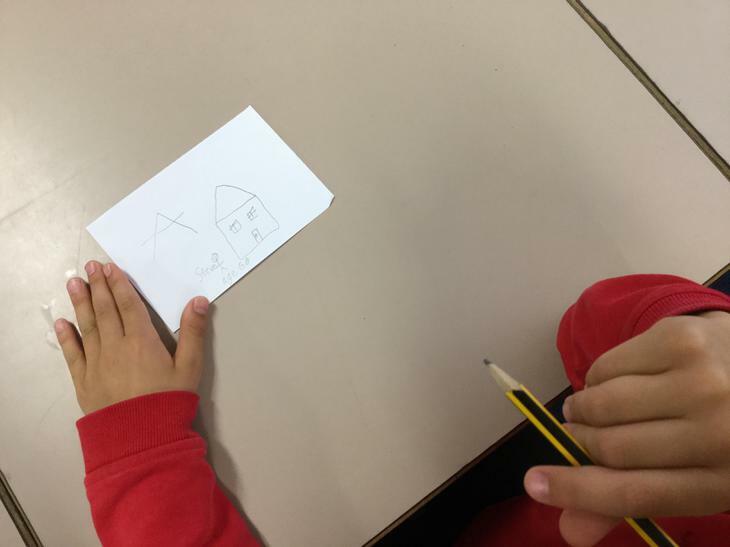 We have thought about what would happen if a supermarket was suddenly built near our school. 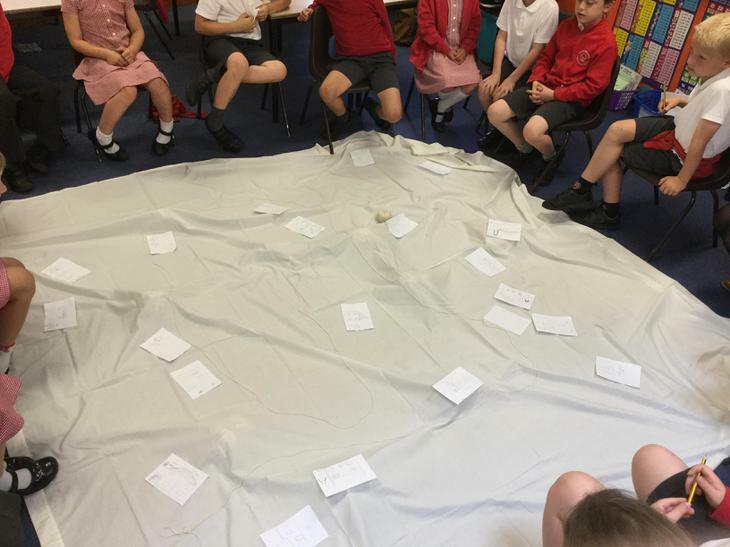 We thought of lots of pros and cons but most of us thought it would be a bad idea. 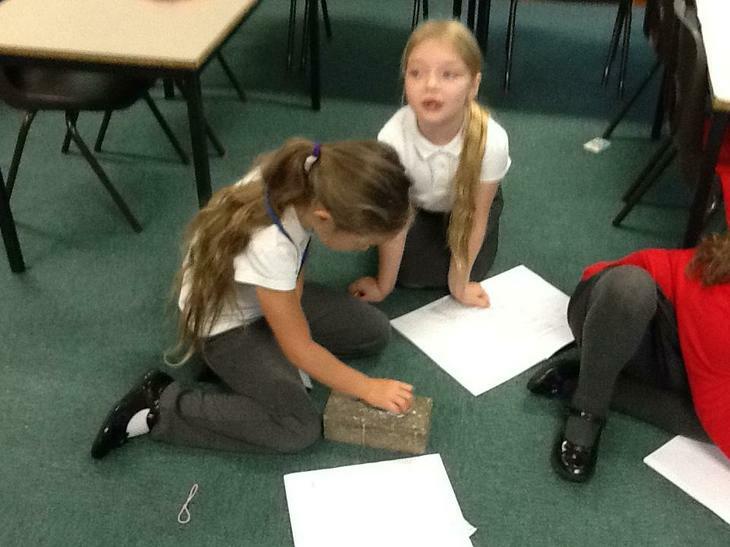 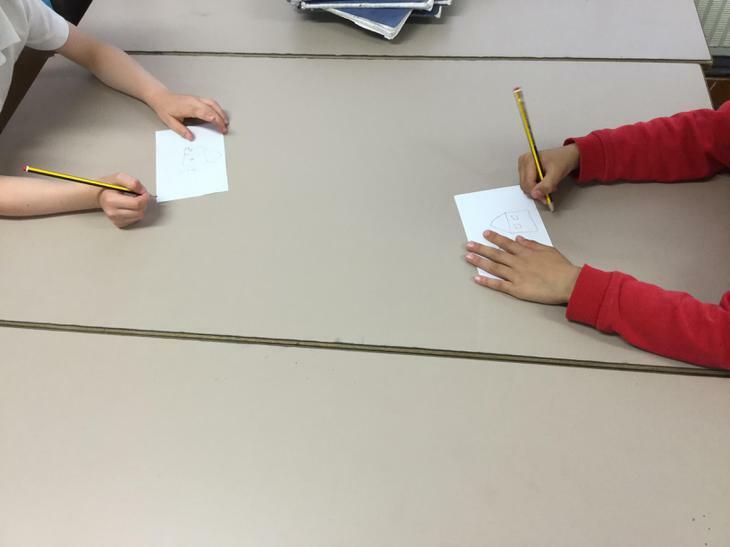 We wrote letters to the council to tell them what we thought and why we would or wouldn’t like the idea. 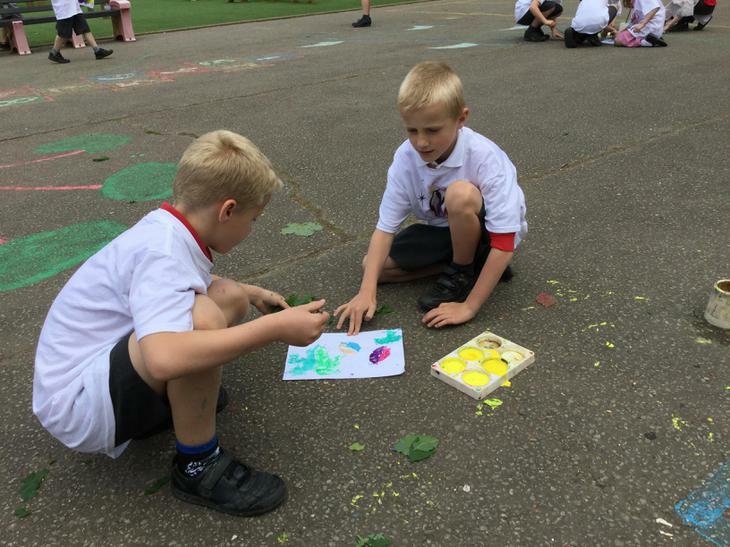 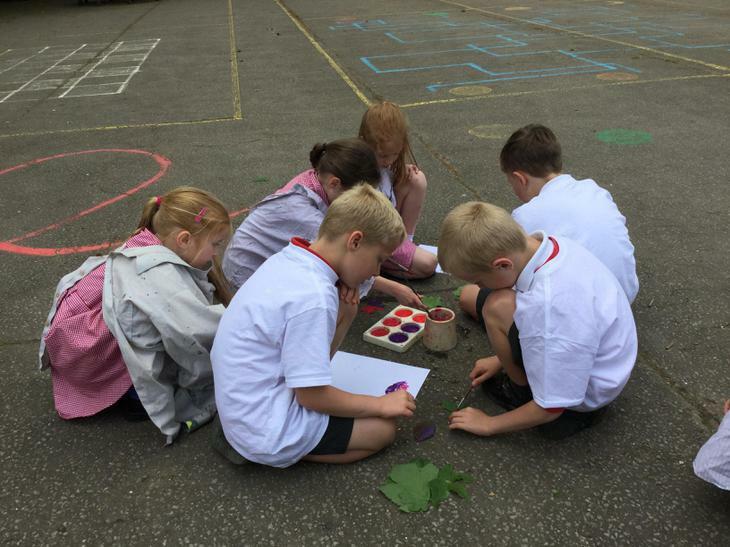 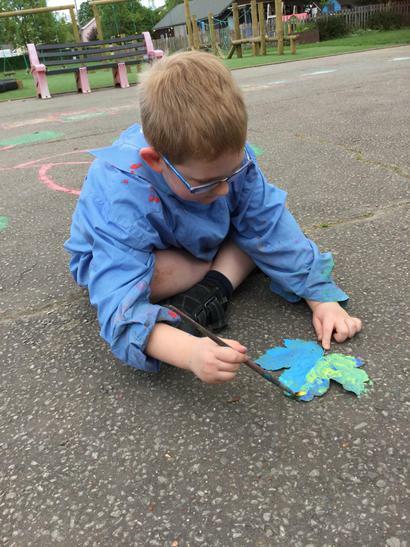 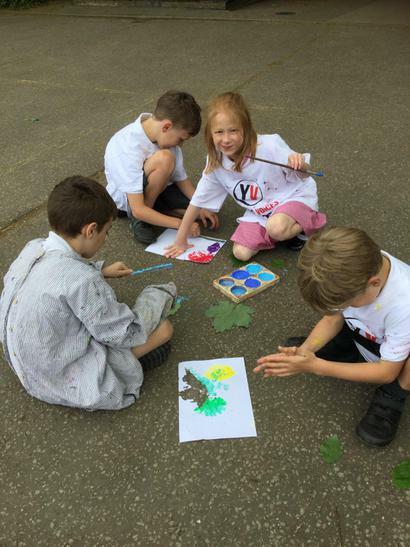 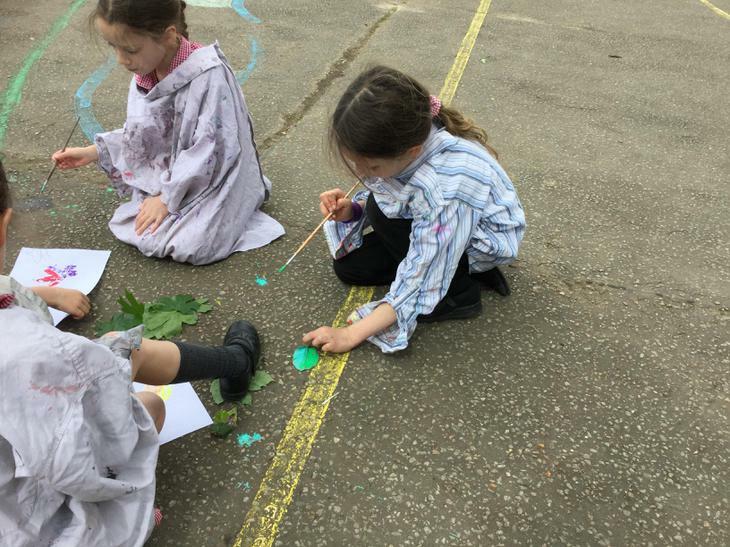 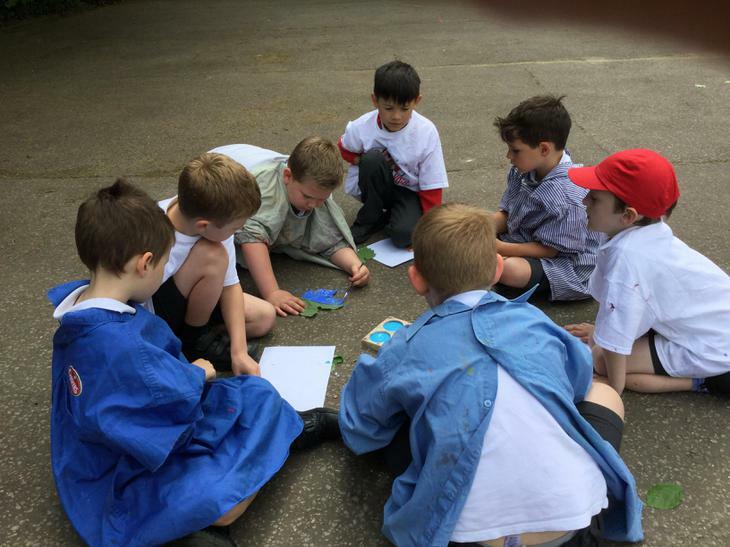 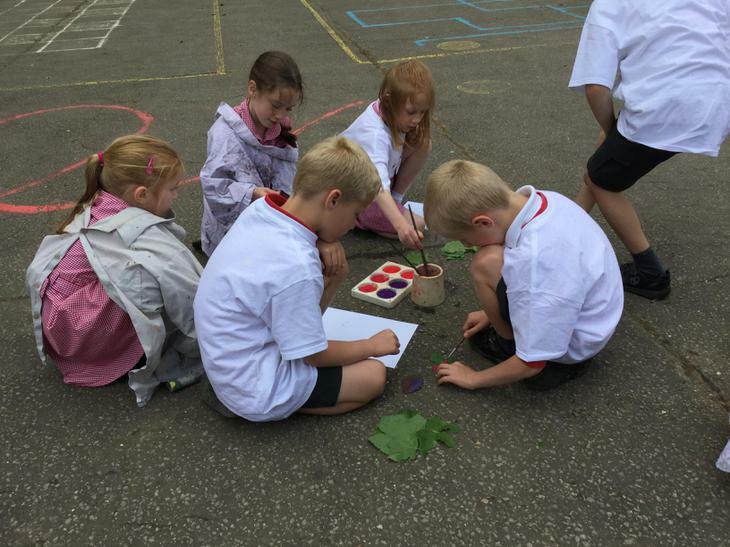 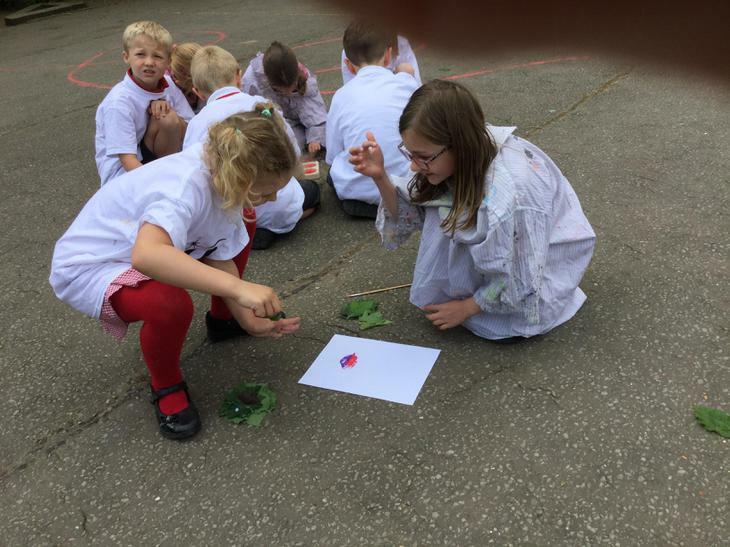 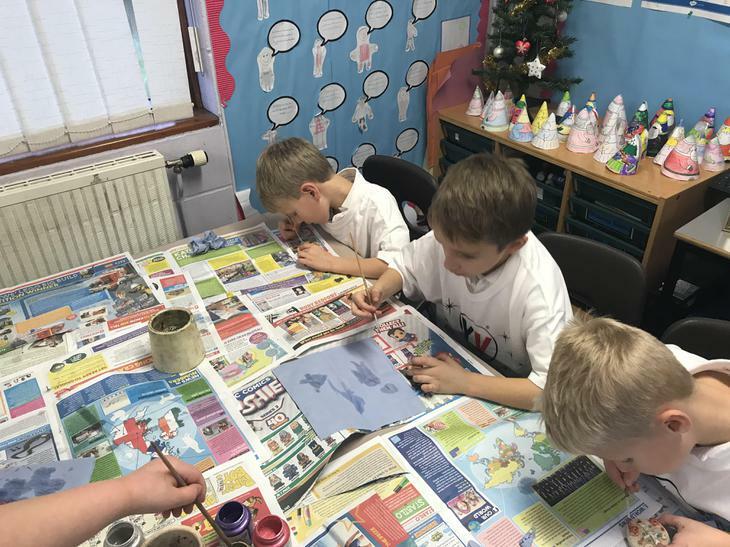 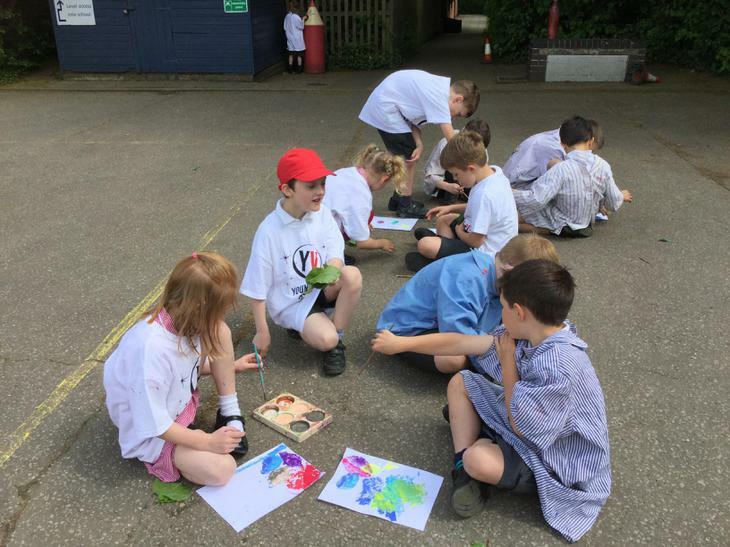 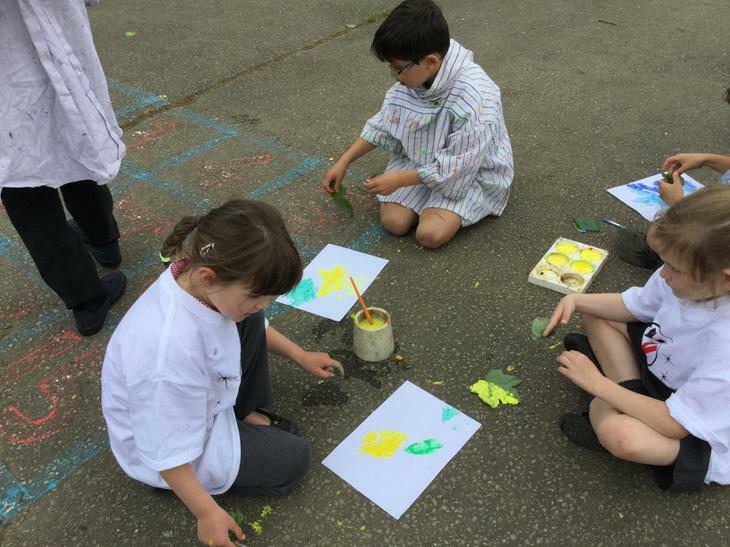 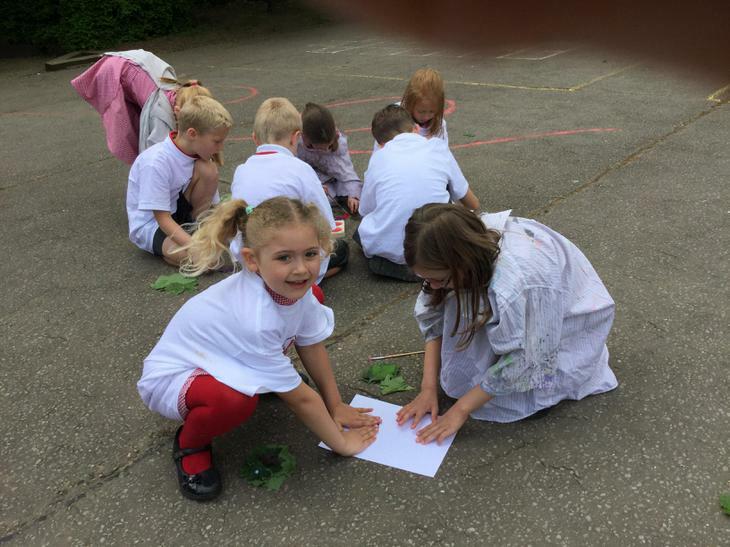 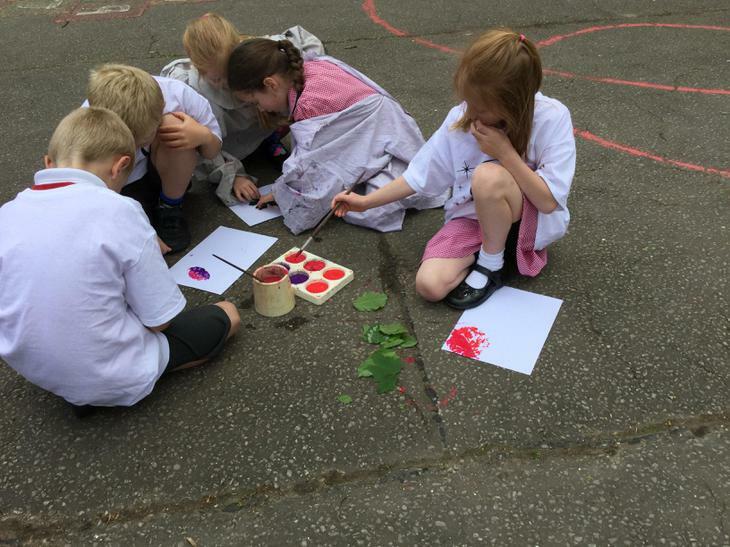 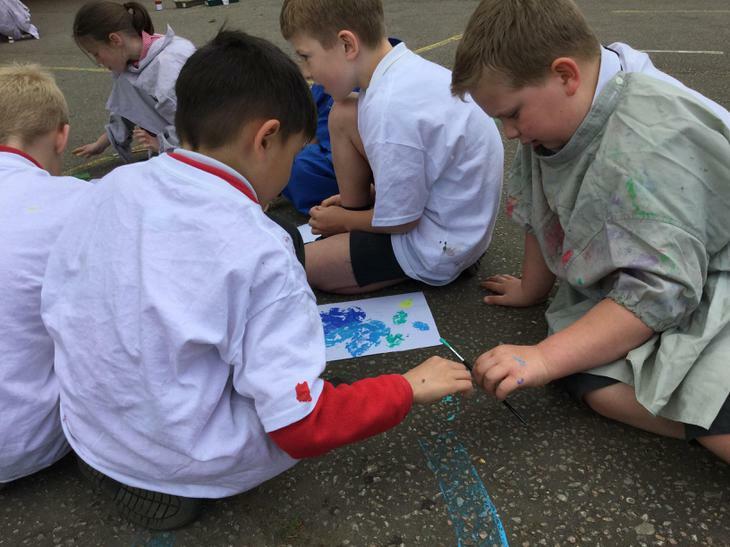 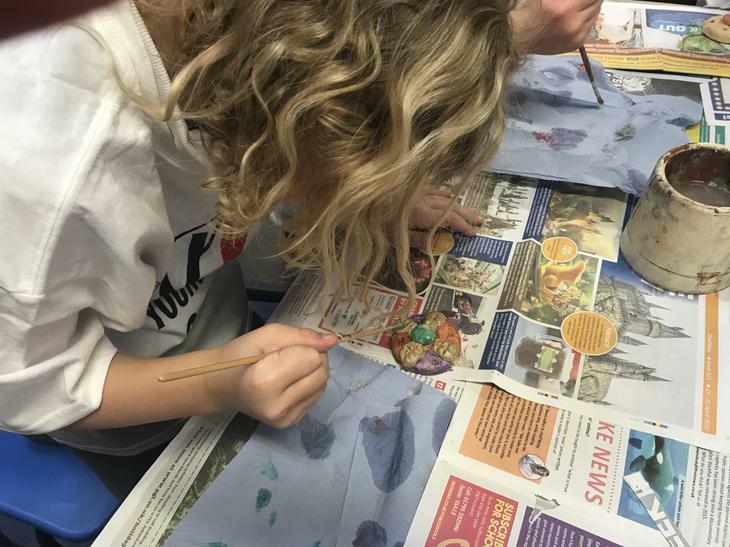 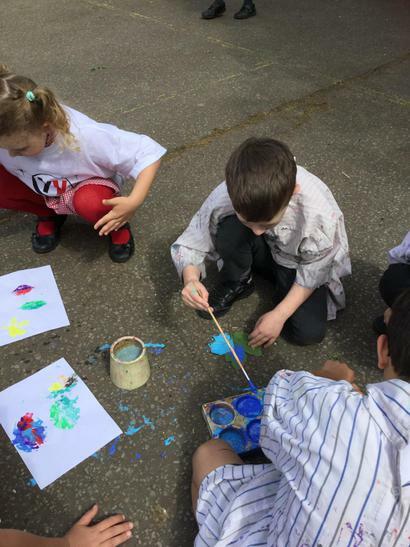 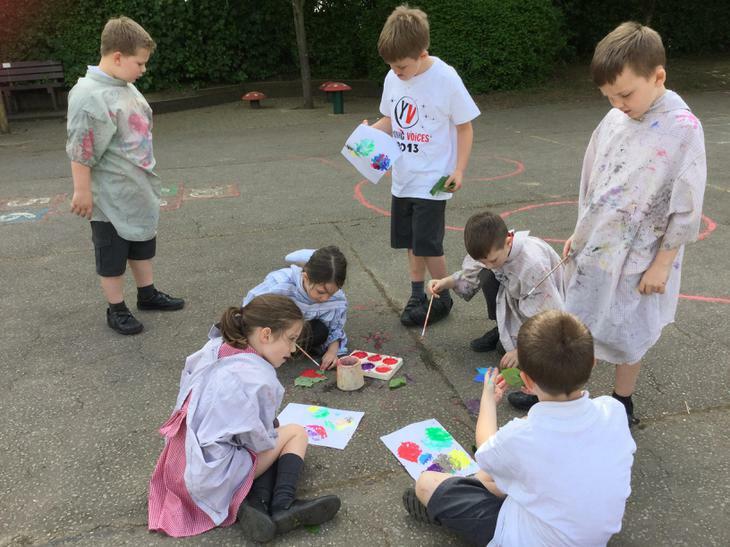 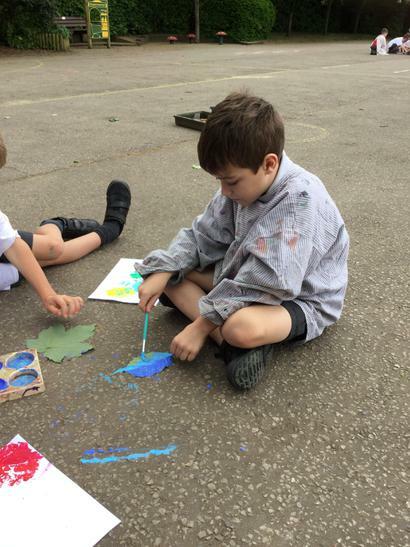 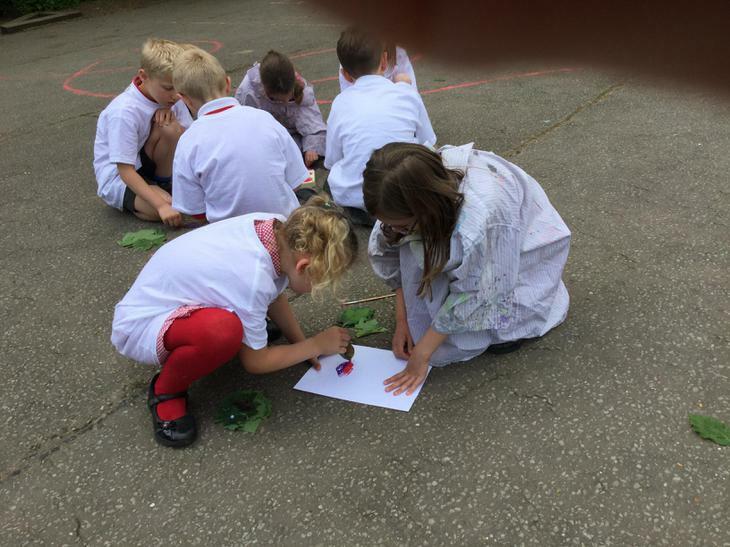 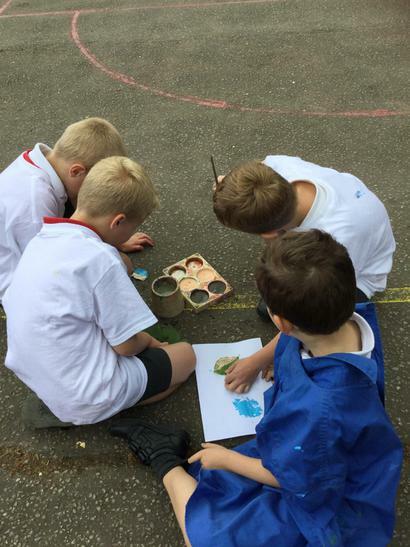 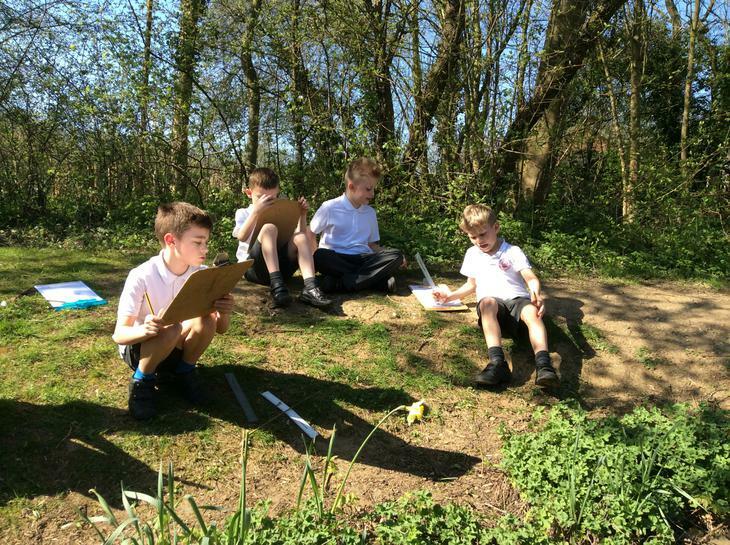 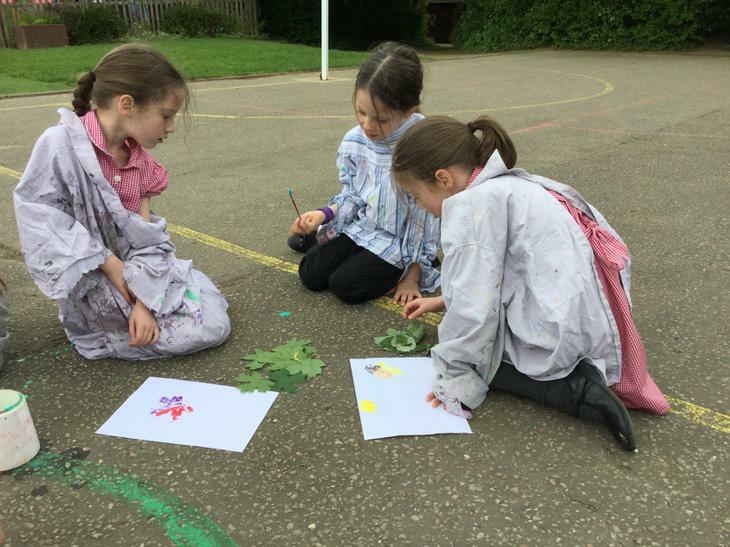 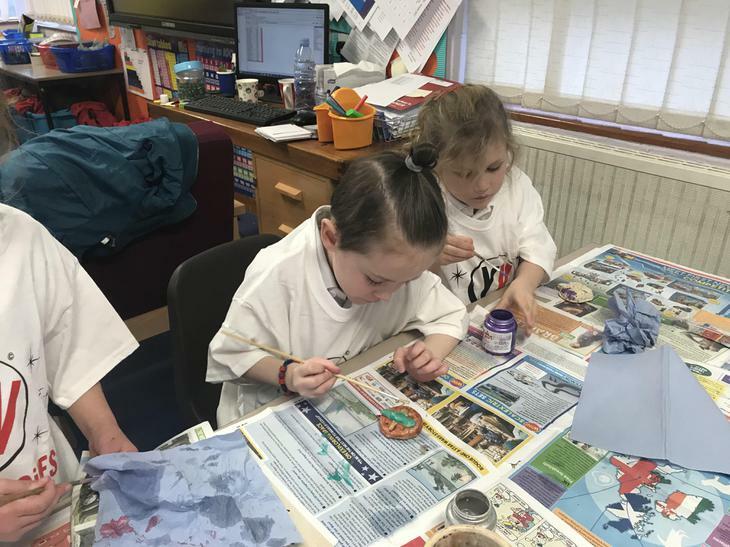 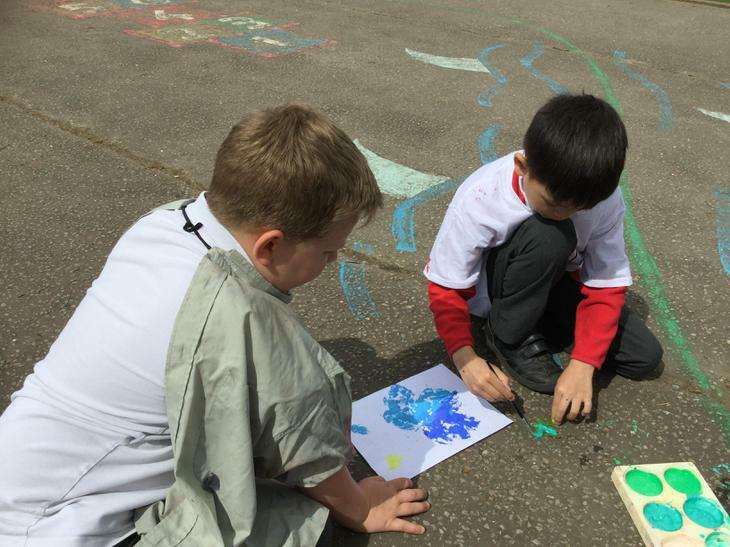 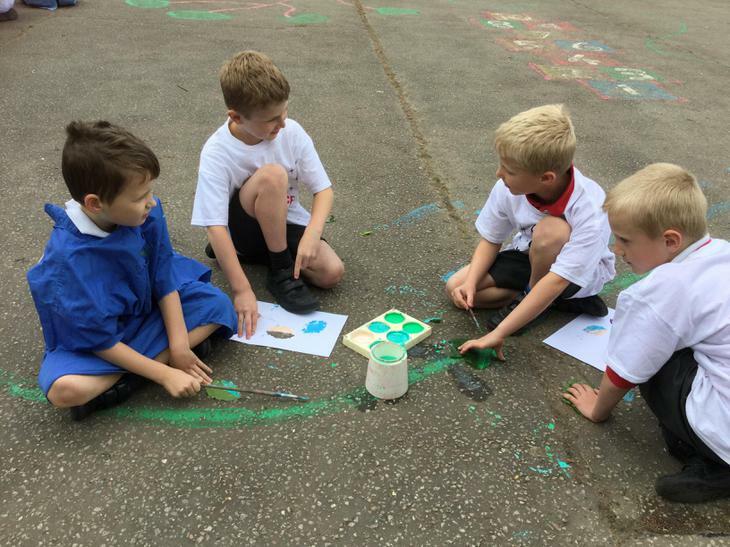 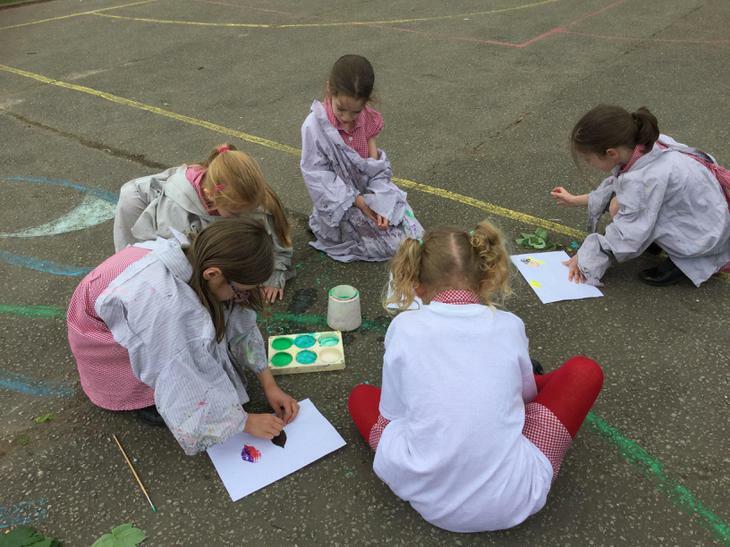 For art this term we are learning about different ways of printing, so today we went outside to paint leaves and print them onto paper. 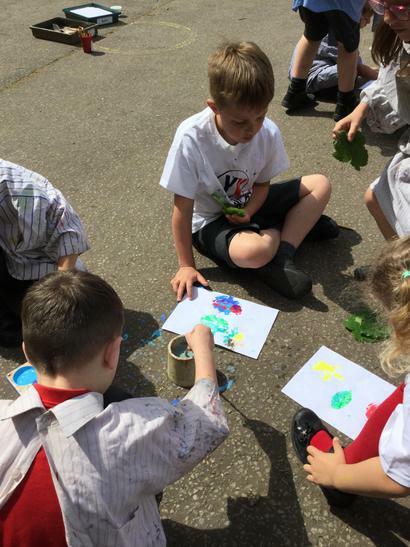 We worked in partners and used lots of bright colours to represent spring. 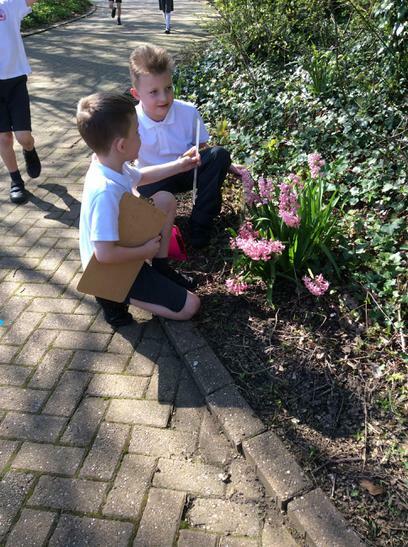 For science this term we are going to be comparing lots of different plants and finding out how they grow. 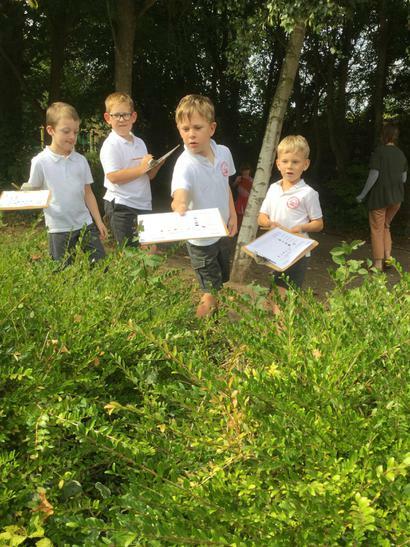 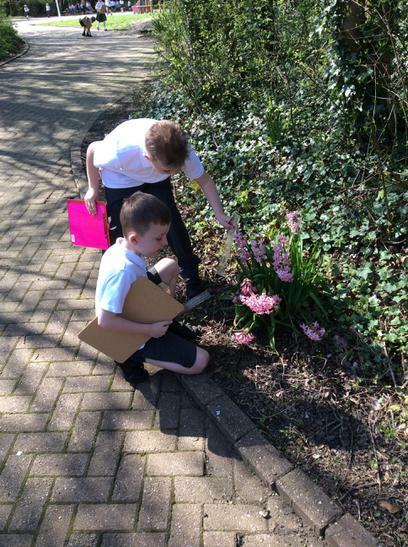 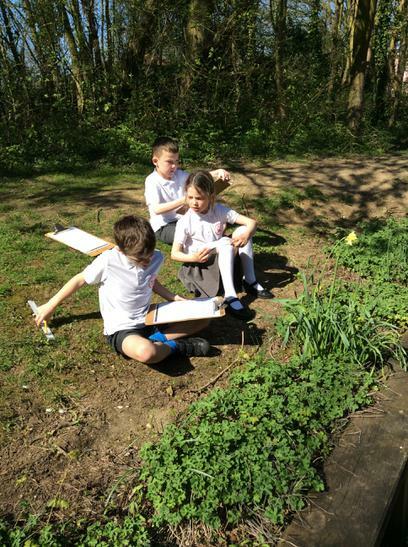 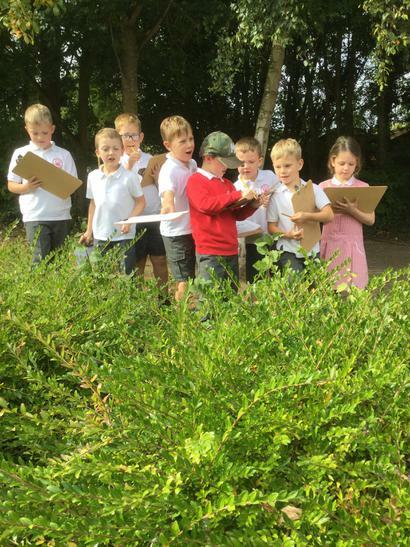 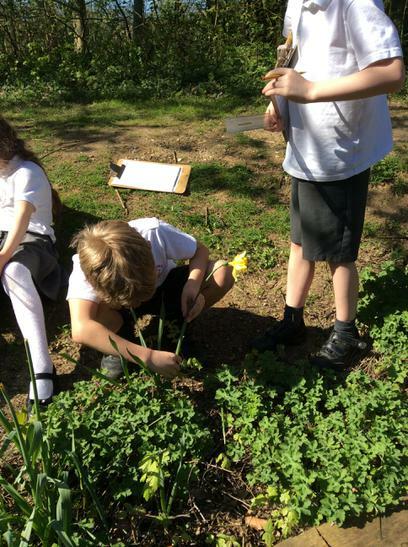 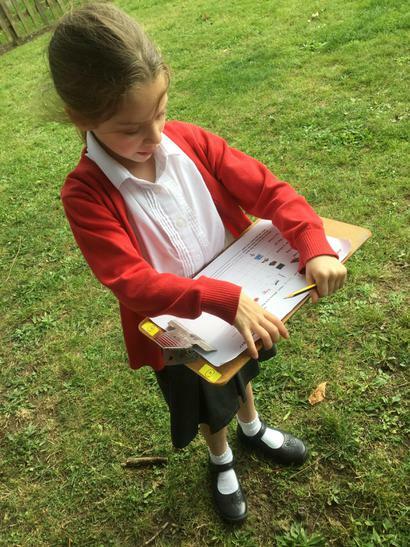 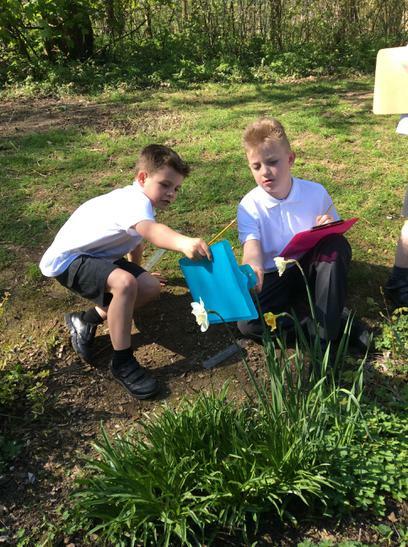 We had lots of fun looking for different plants on our school field and finding out about the different parts of them. 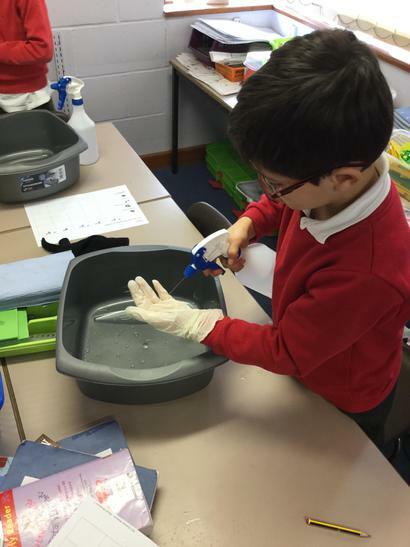 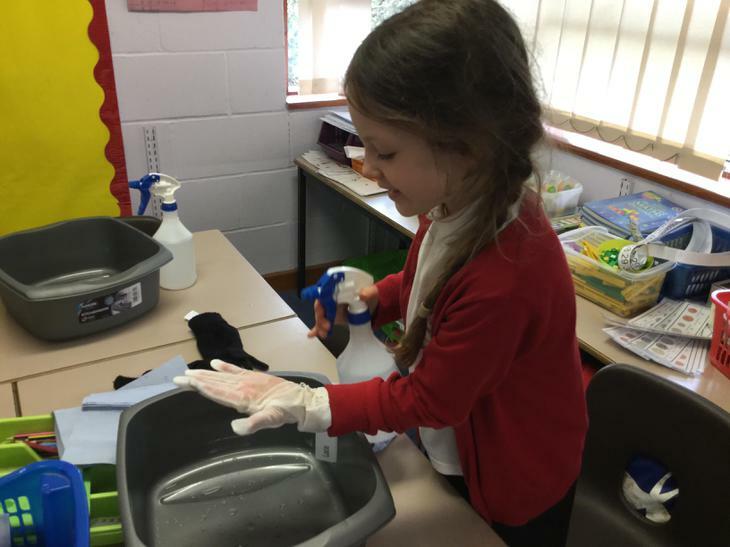 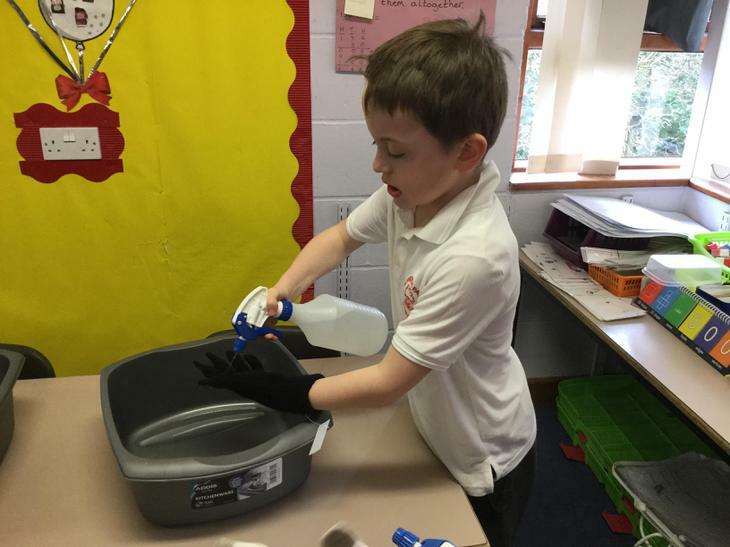 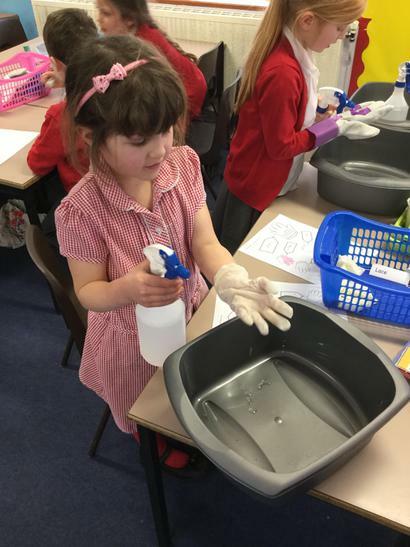 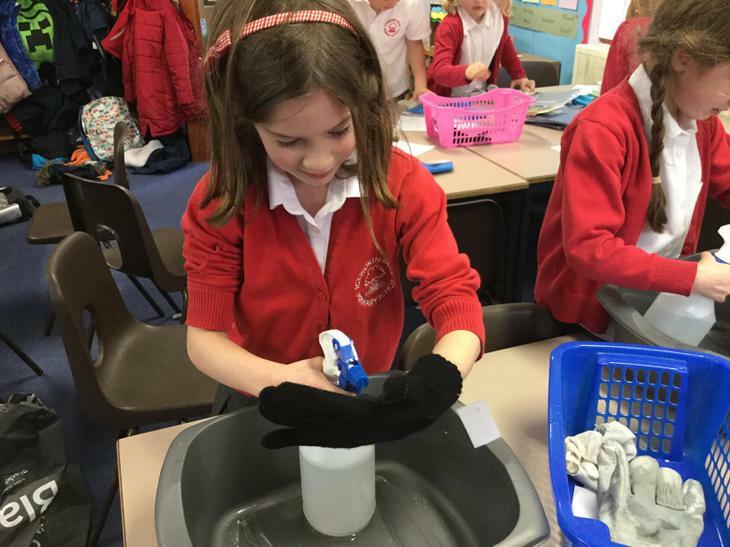 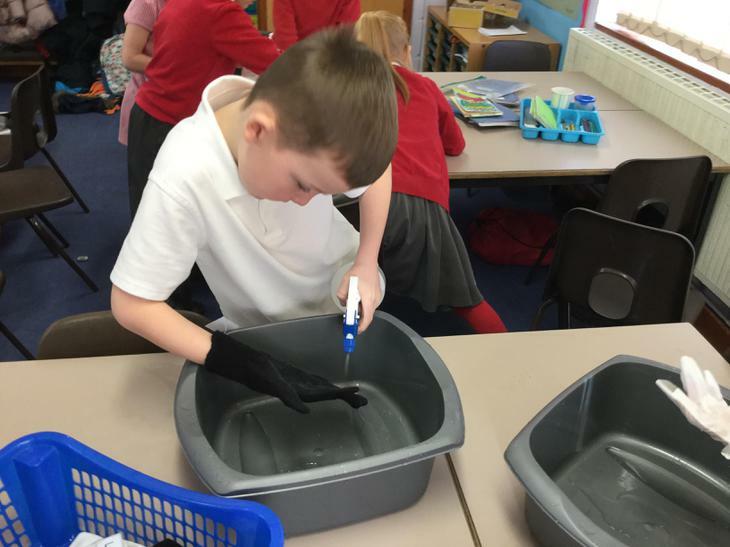 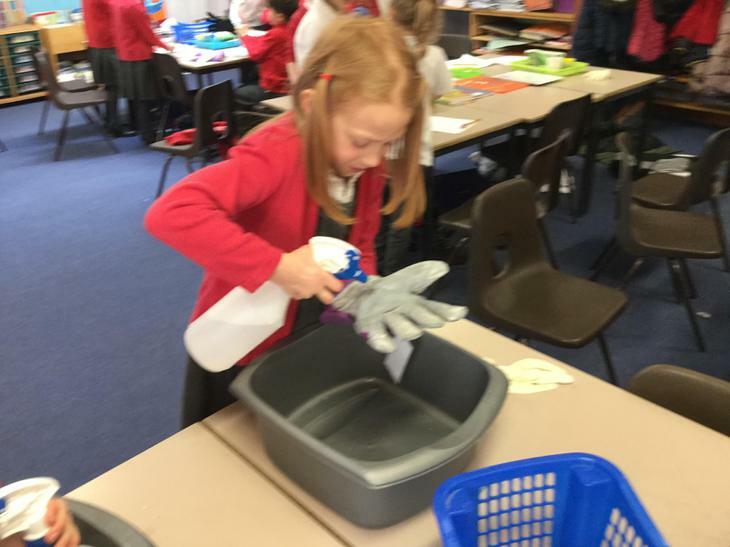 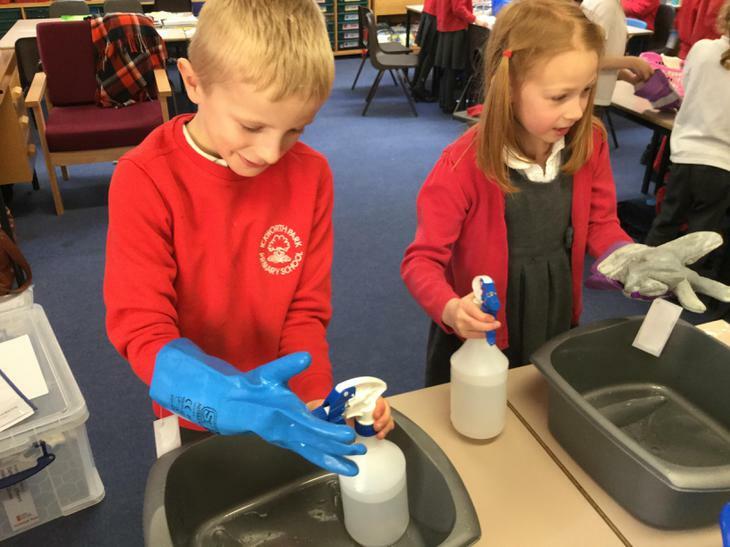 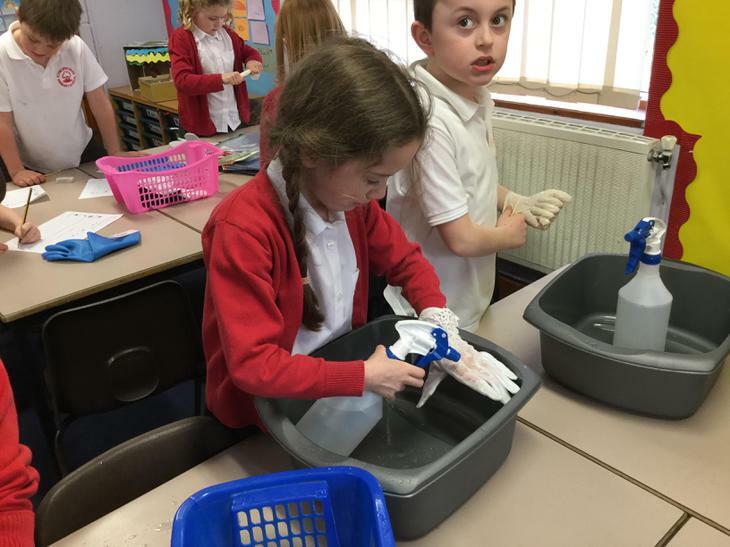 We have been testing different types of gloves to see which material is best for different things. 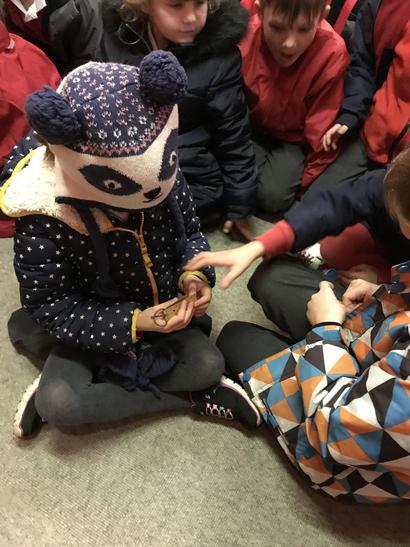 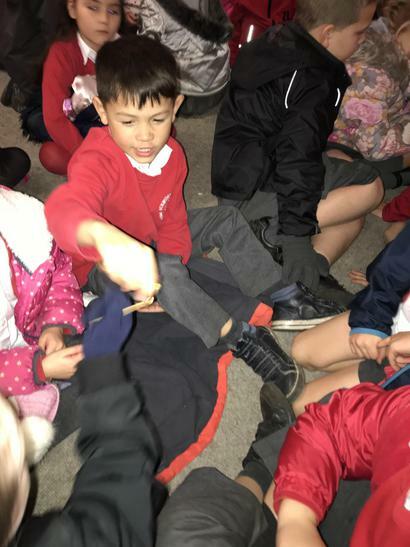 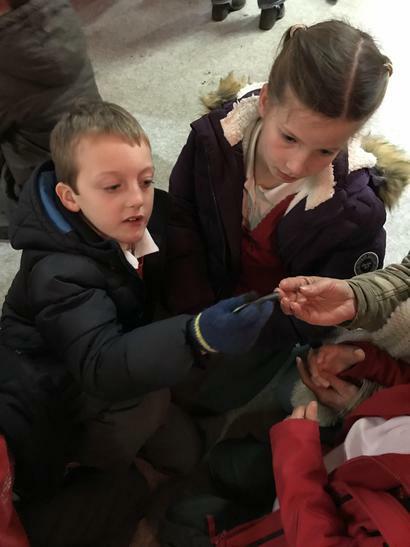 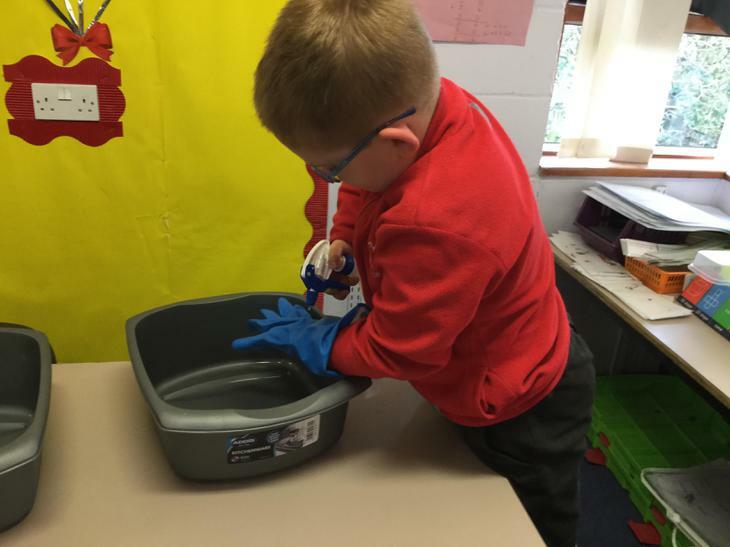 We have been experimenting to see which gloves keep you warm, which are the strongest, which are waterproof and which are best for picking up tiny things. 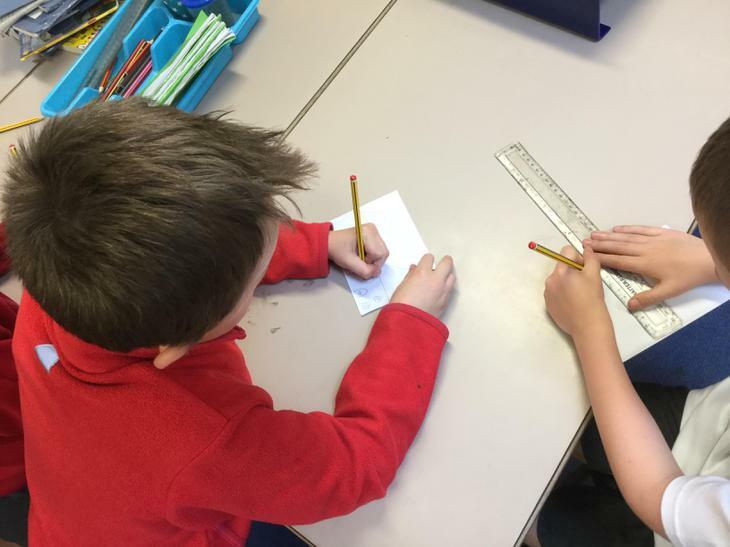 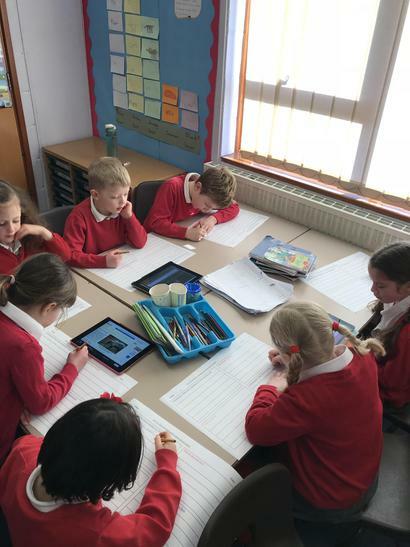 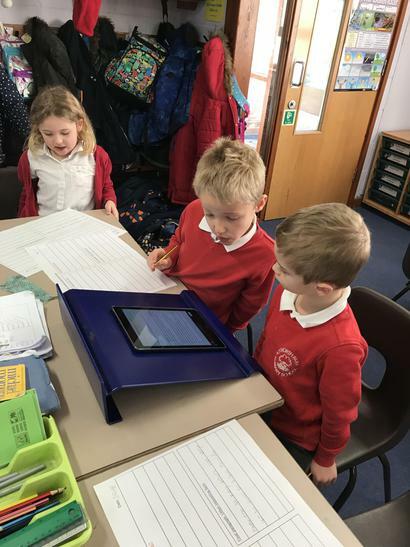 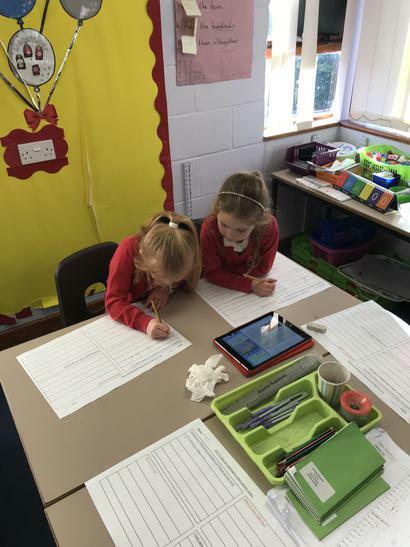 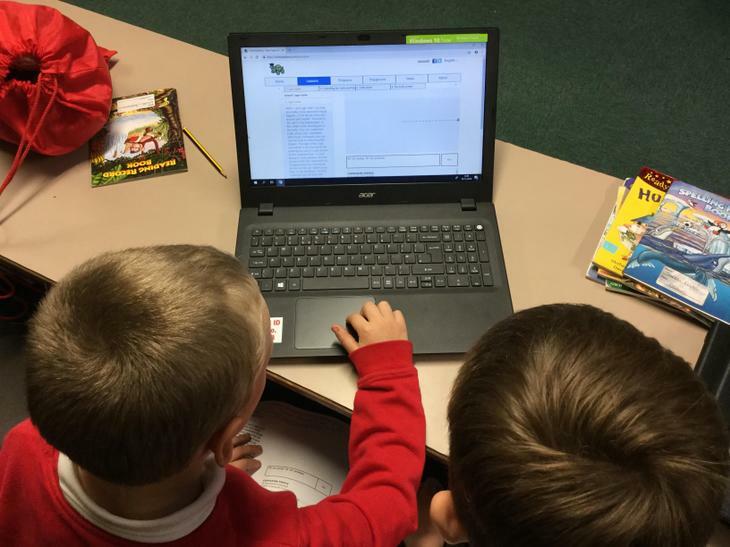 Cedar class and Beech class have been helping each other to research facts about grizzly bears as part of our Alaska topic. 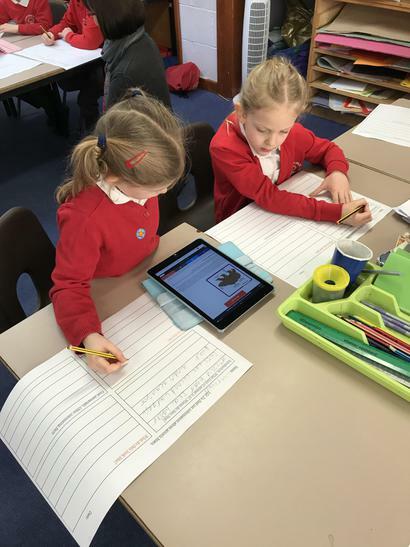 We used QR codes and the iPads to get our research from different websites. 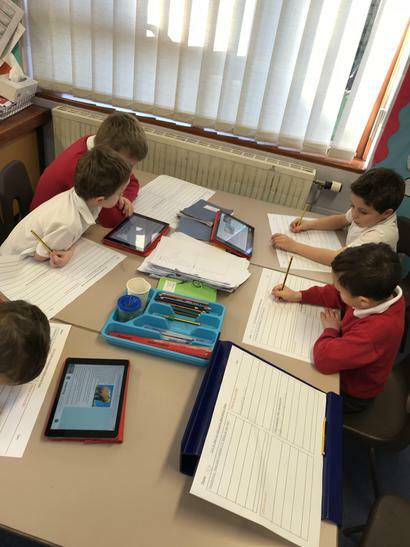 We are going to use our facts to do some super non fiction writing! 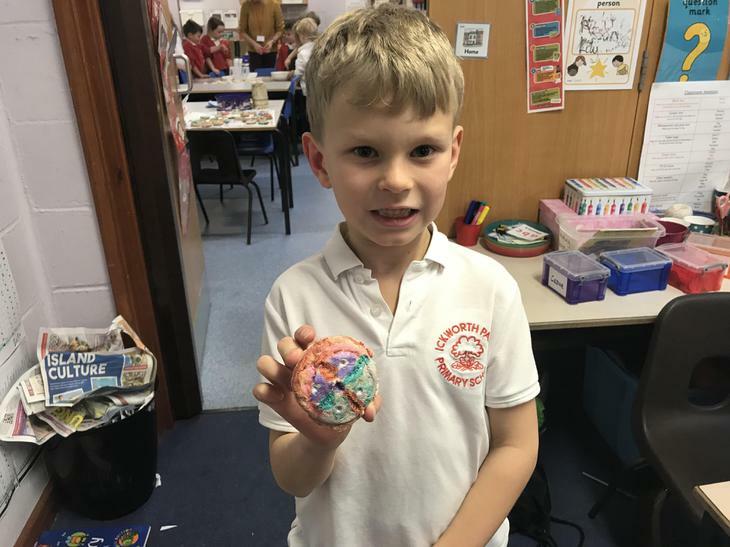 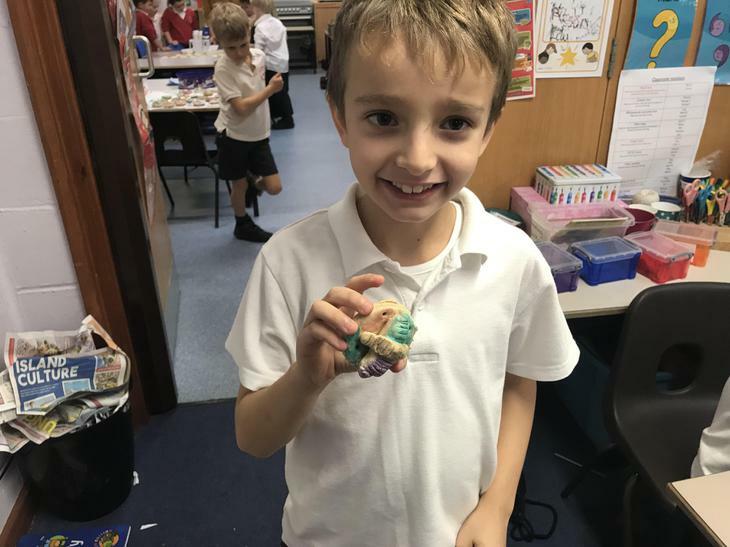 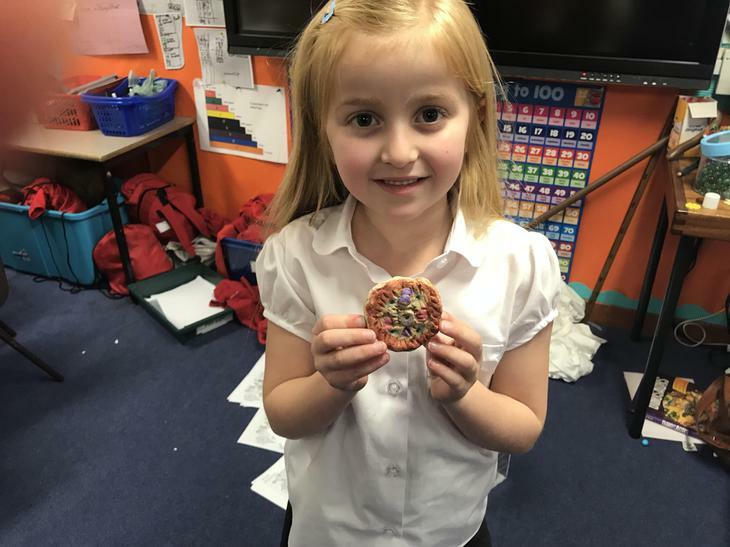 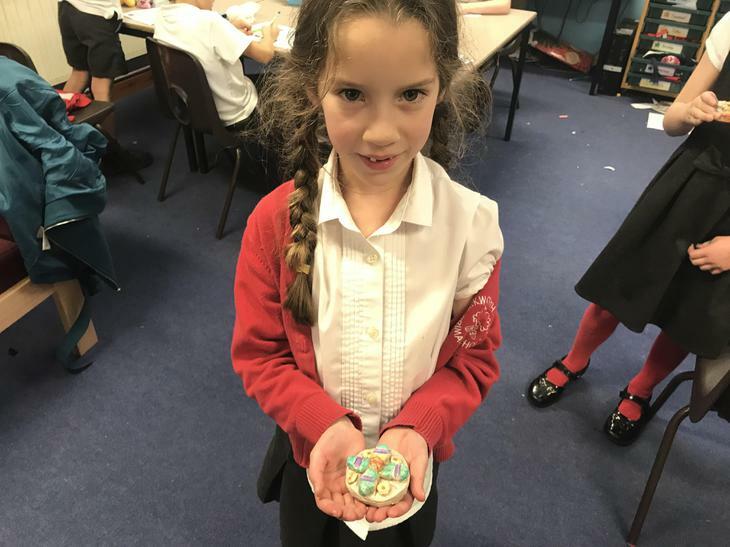 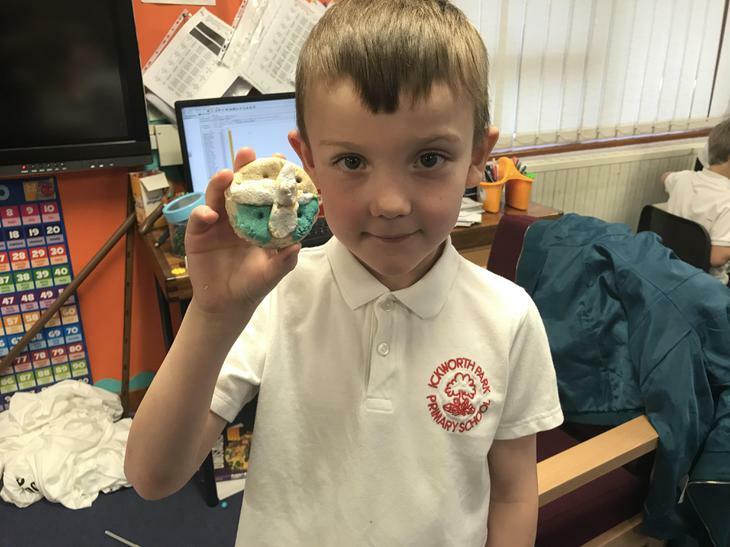 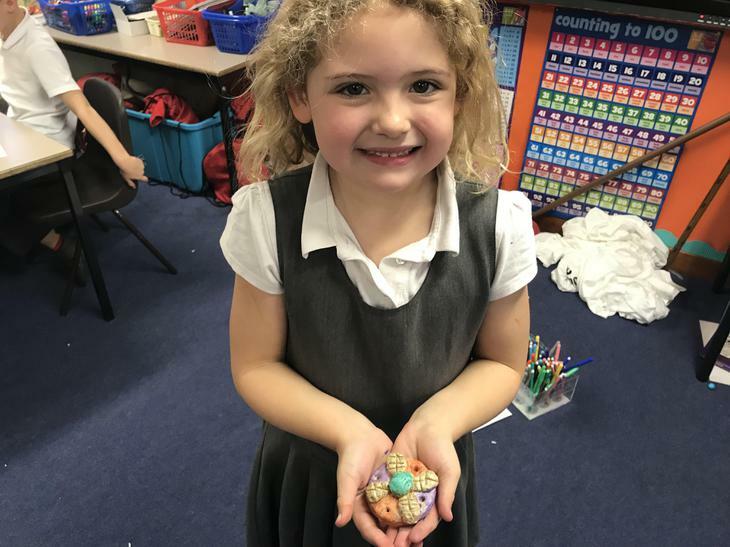 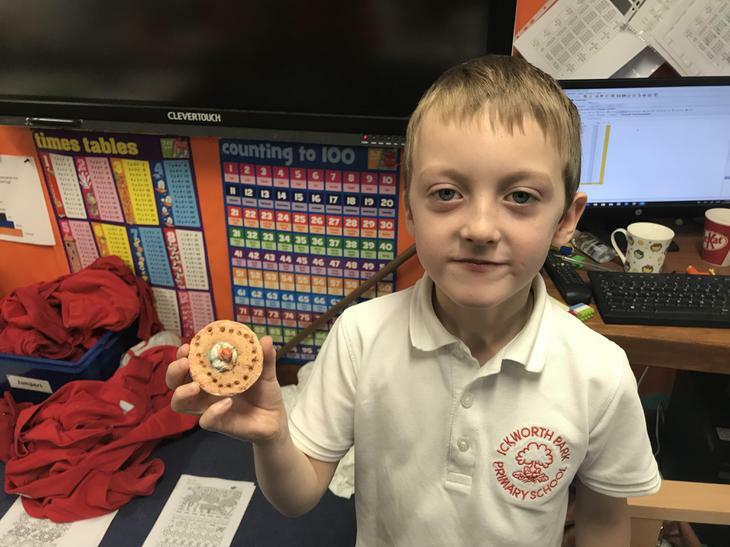 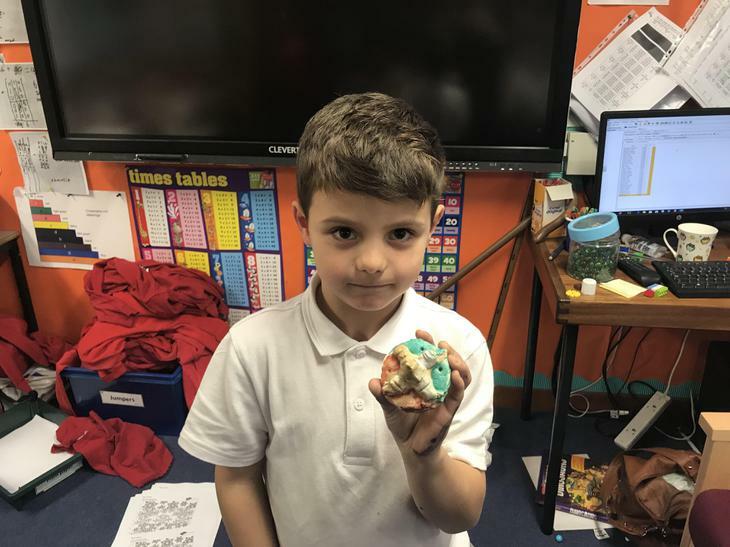 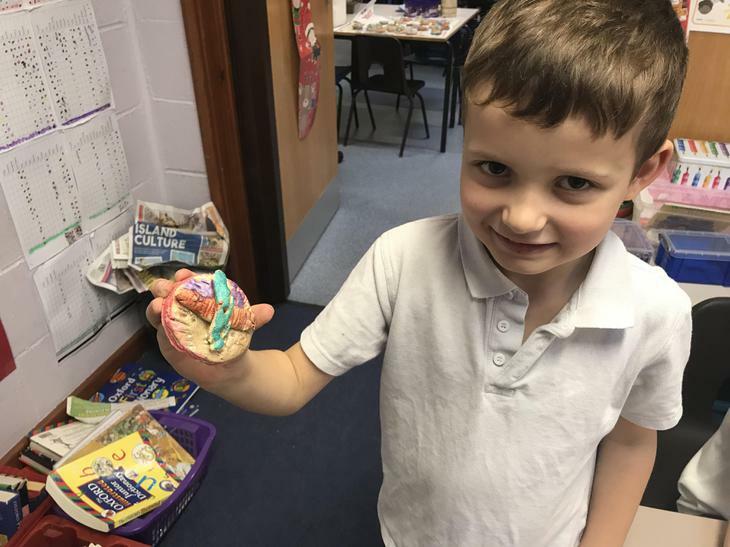 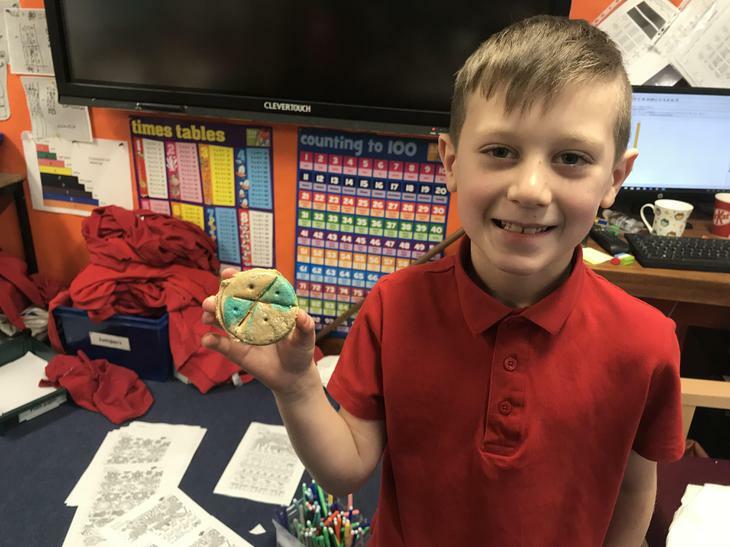 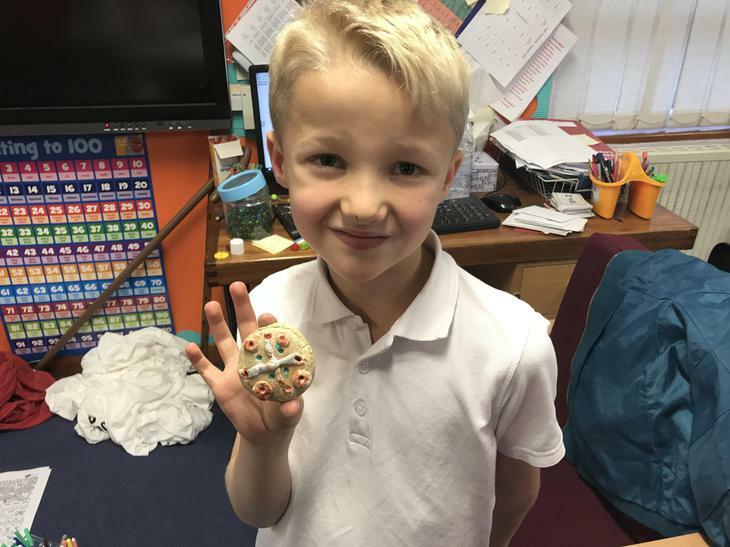 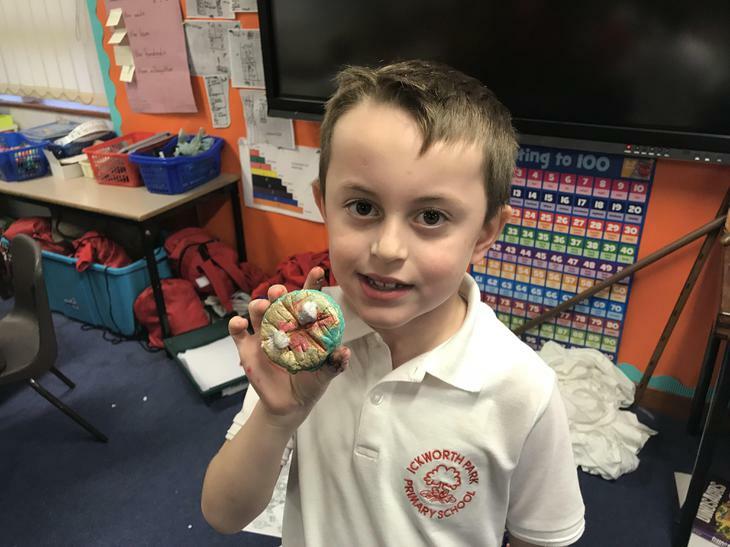 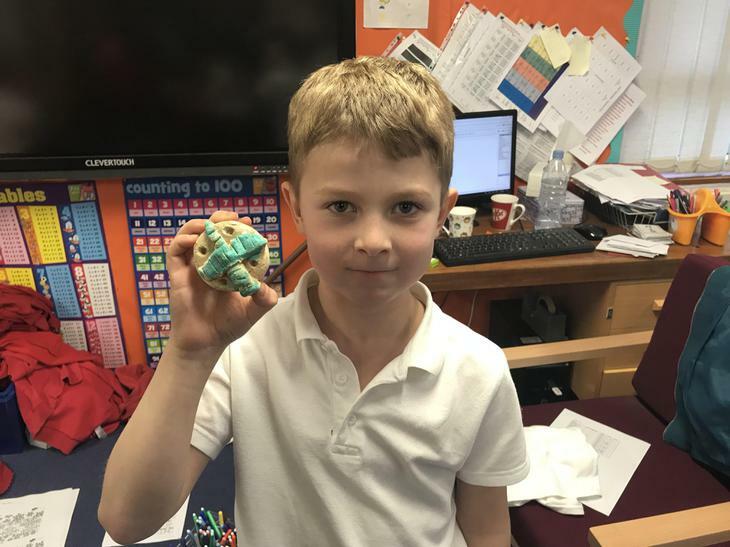 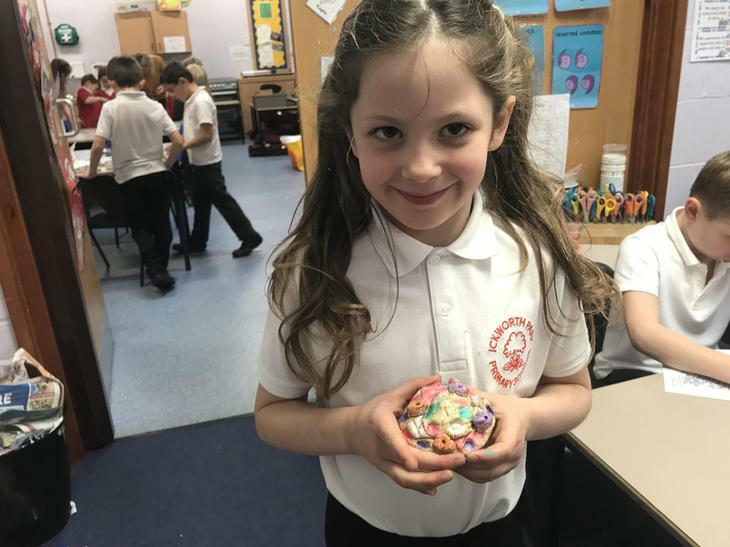 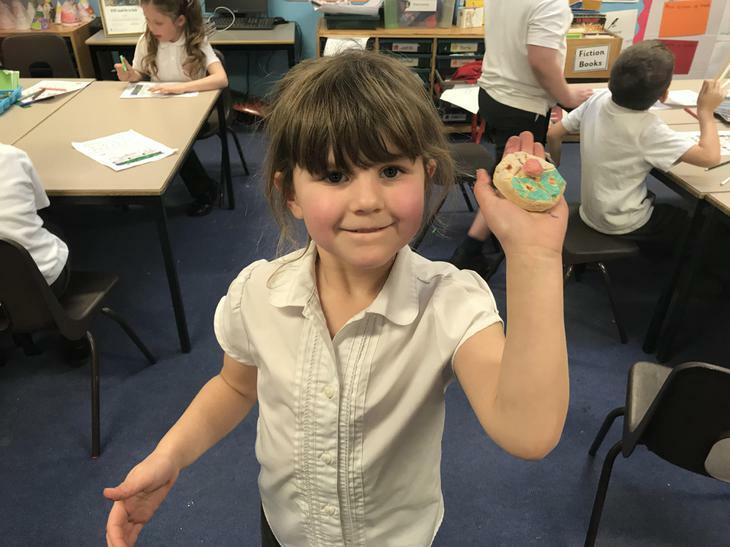 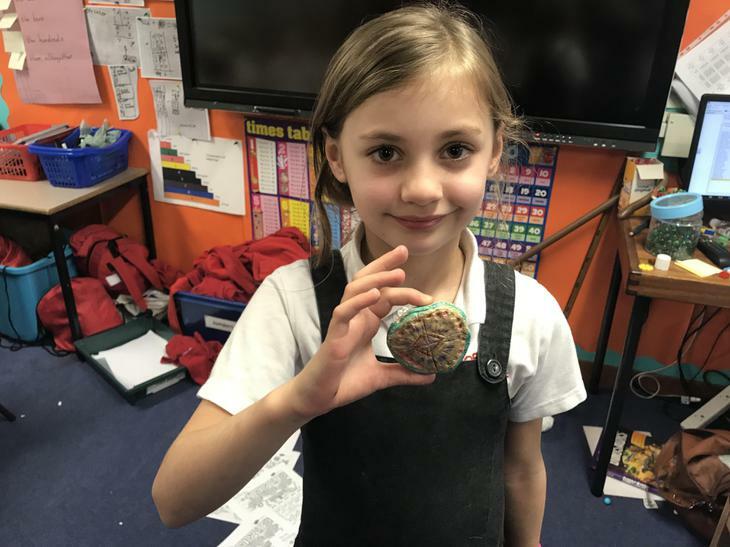 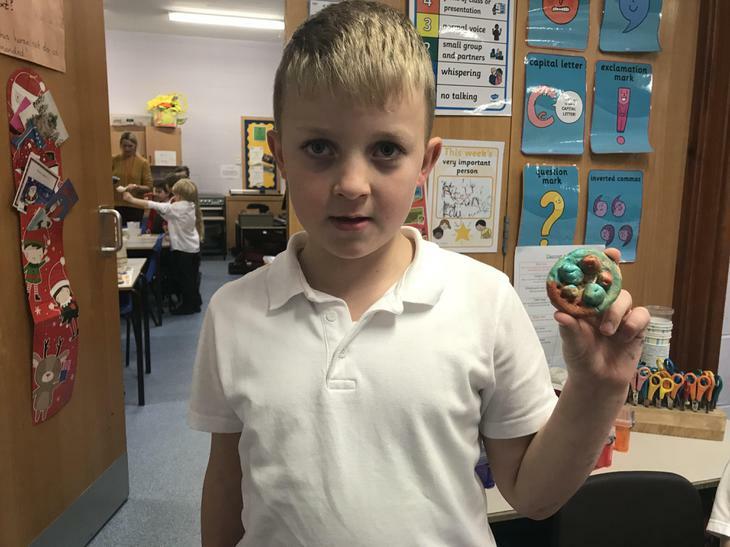 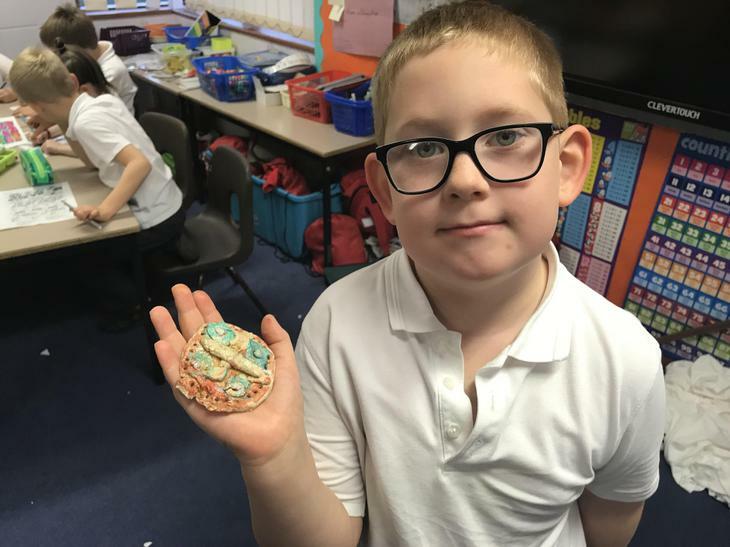 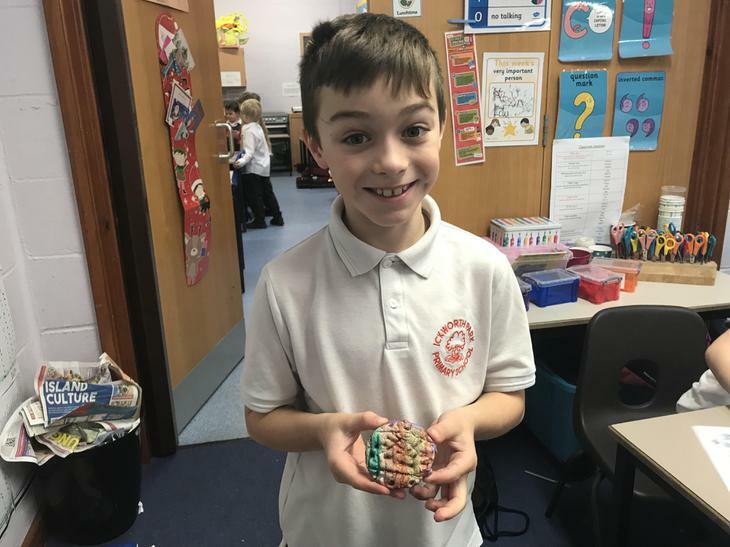 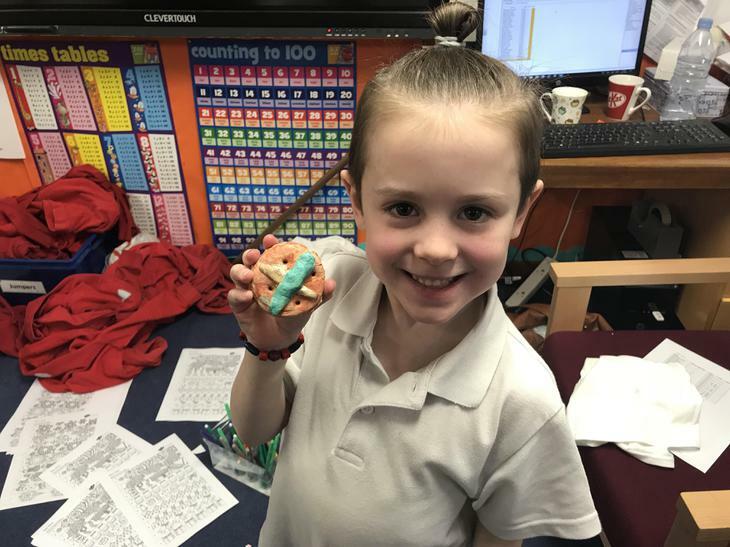 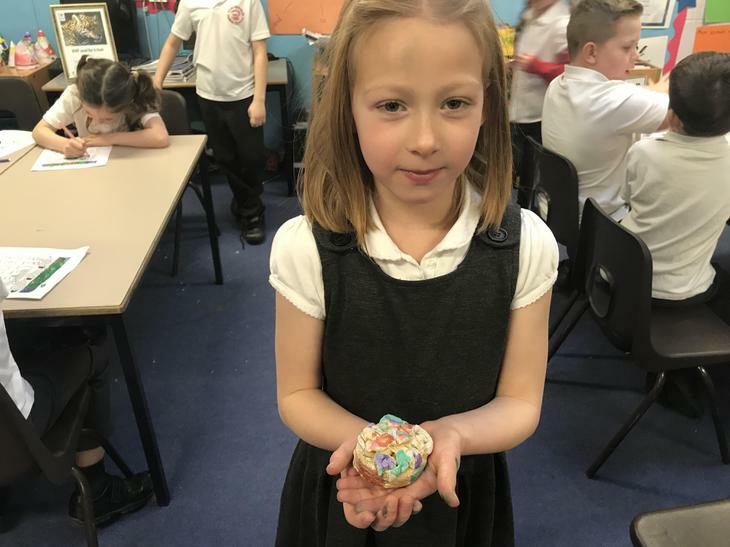 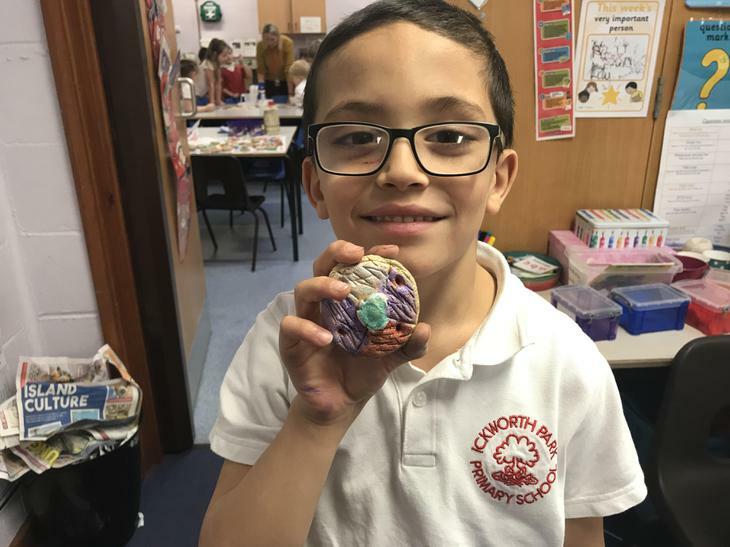 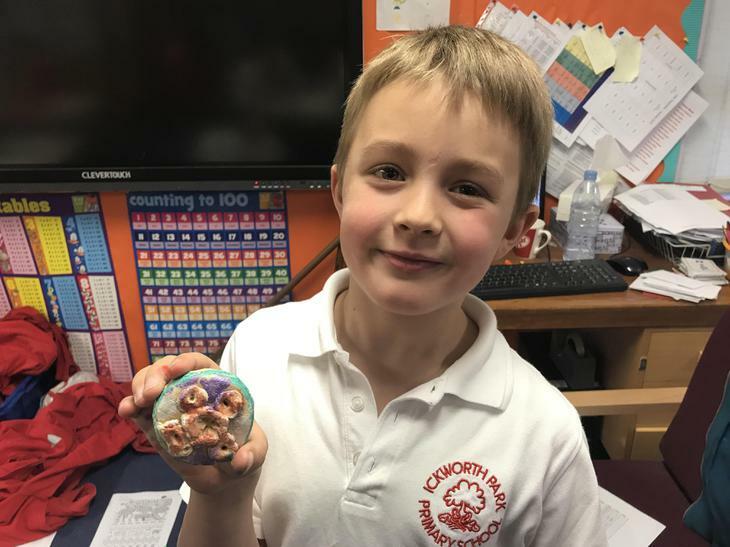 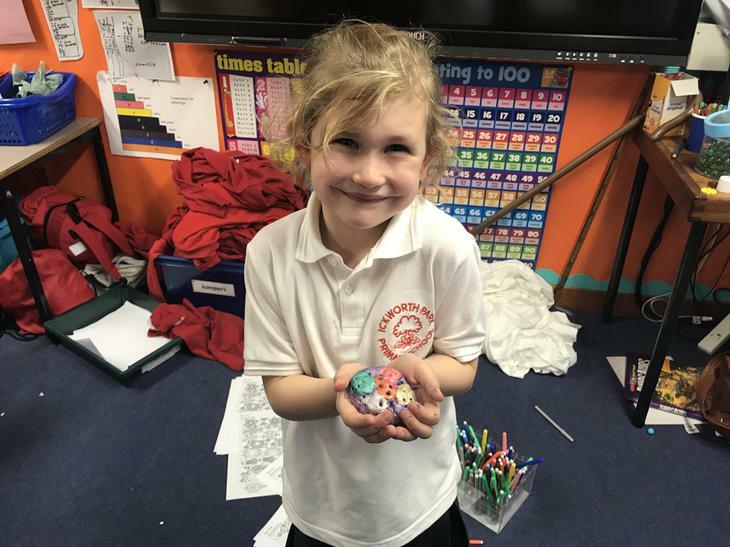 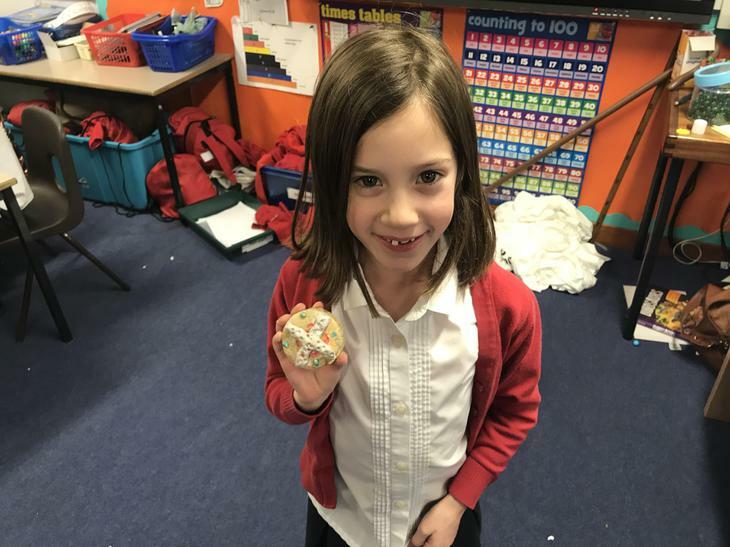 We have made some fantastic Anglo Saxon Brooches out of salt dough. 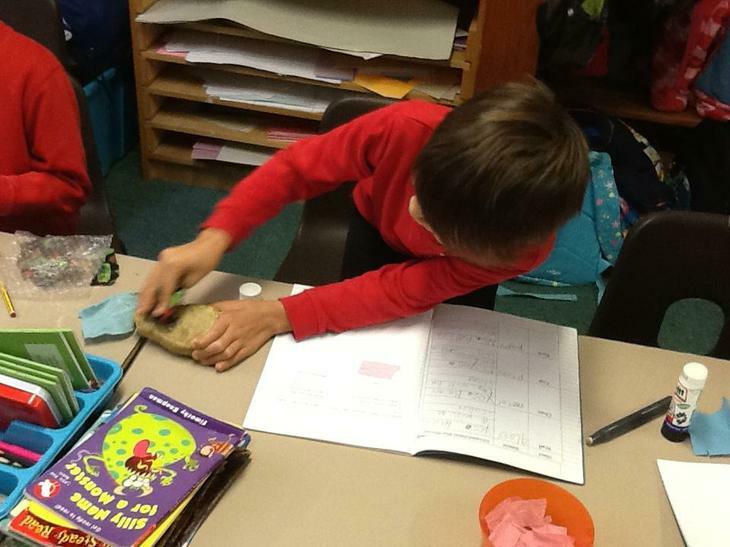 We had lots of fun kneading the dough and making the patterns. 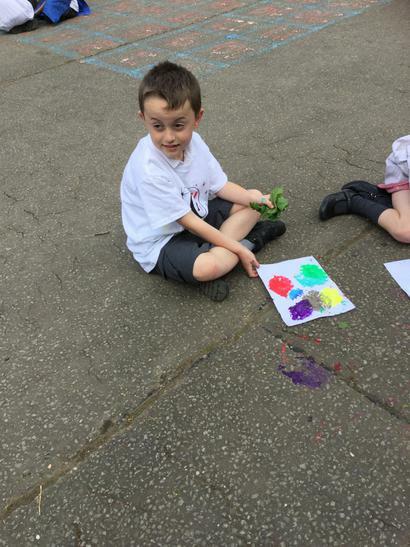 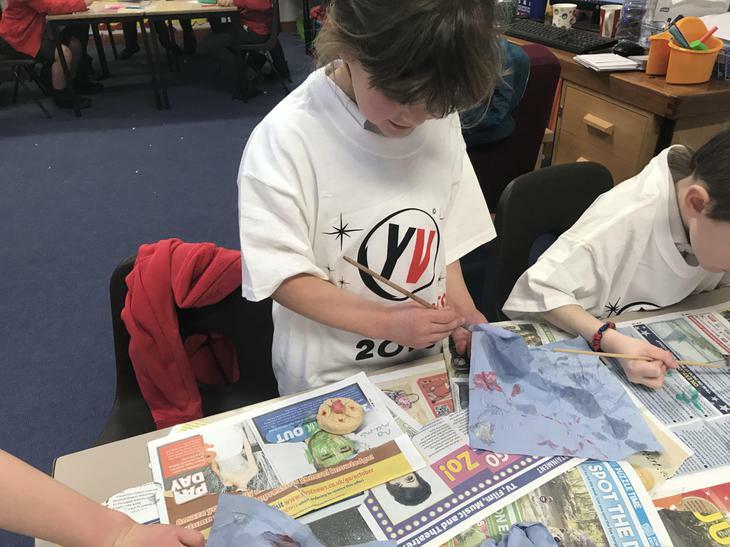 Then we had even more fun painting them! 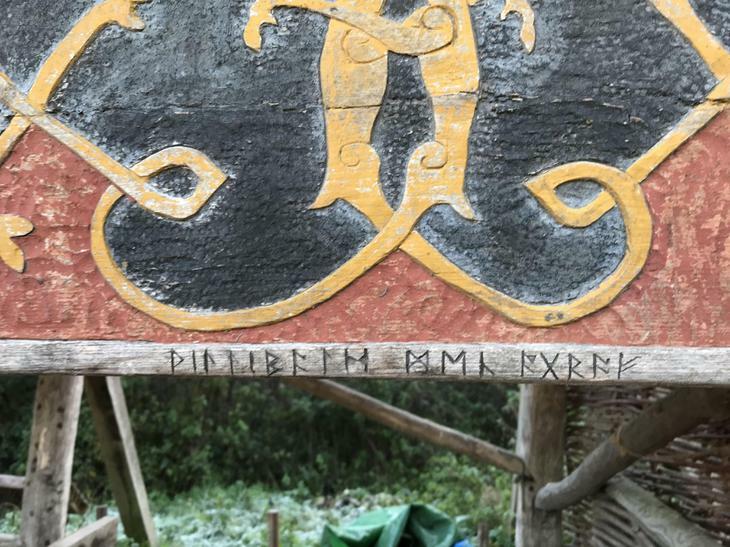 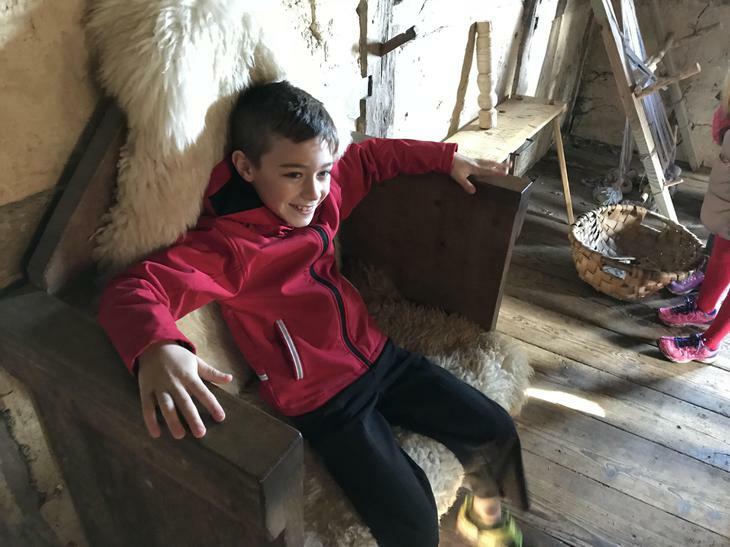 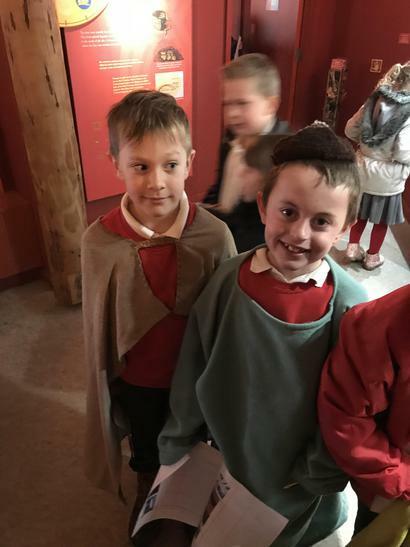 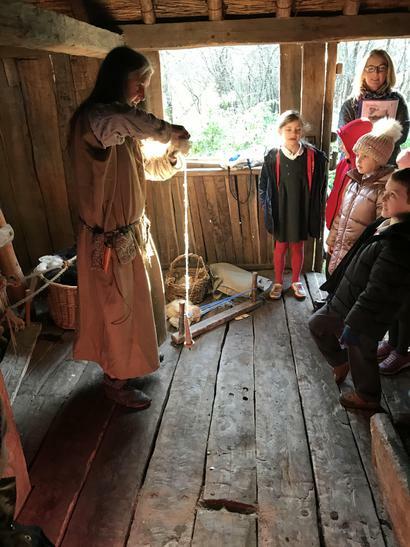 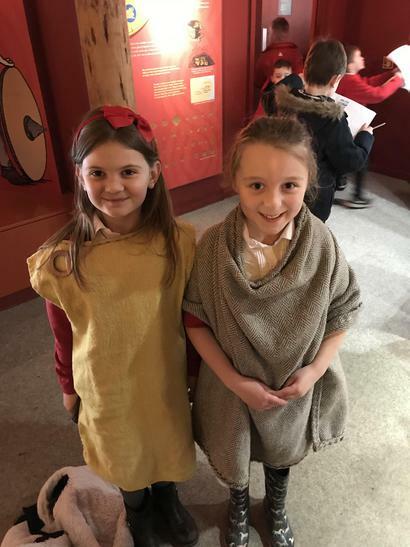 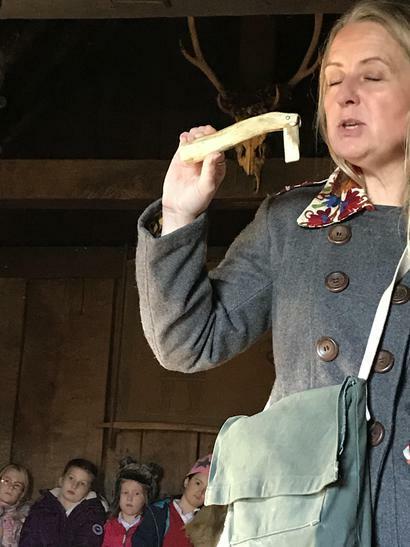 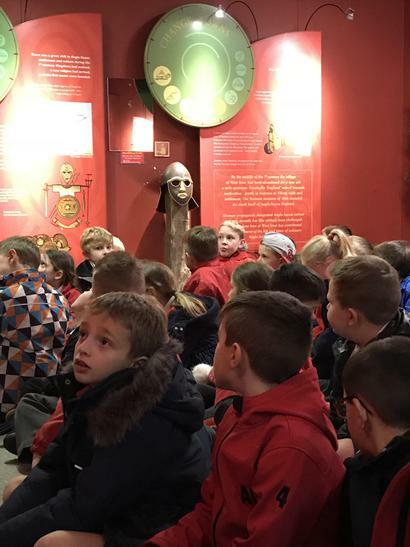 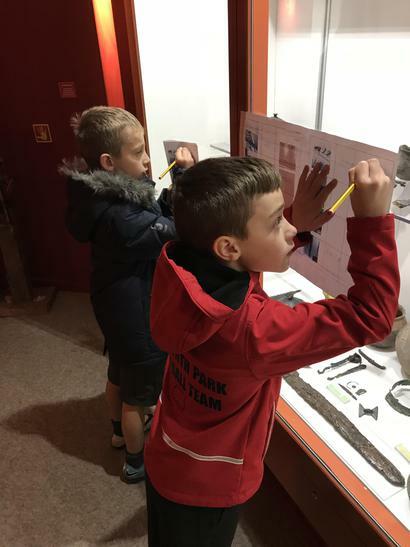 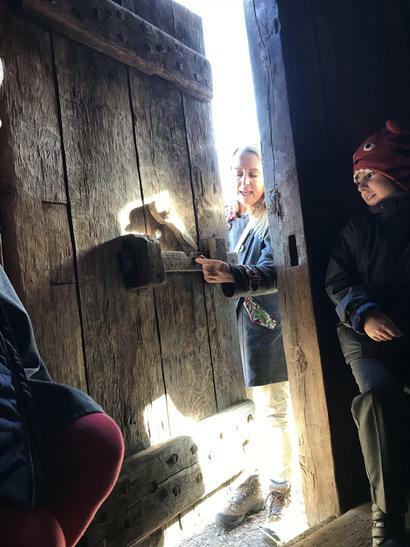 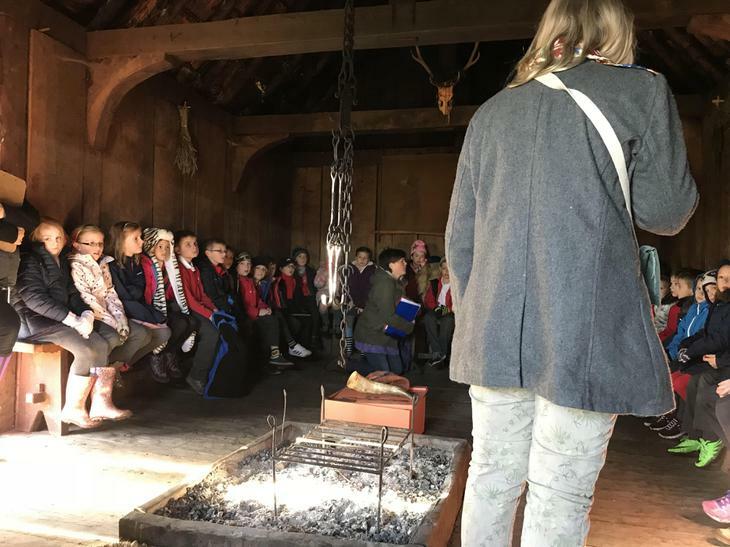 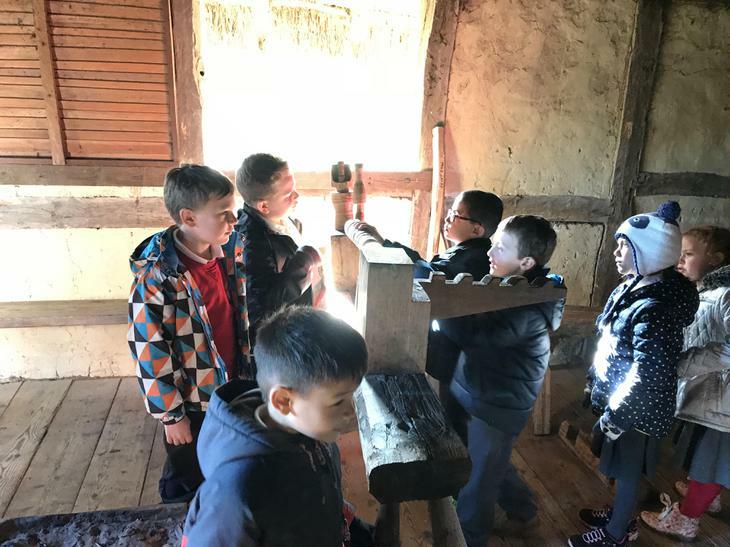 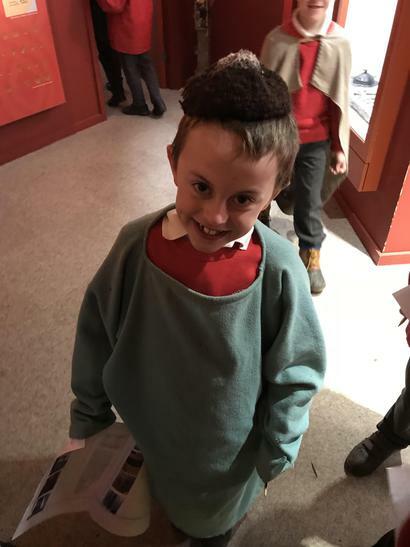 We had a great time on our school trip to West Stow Anglo Saxon Village! 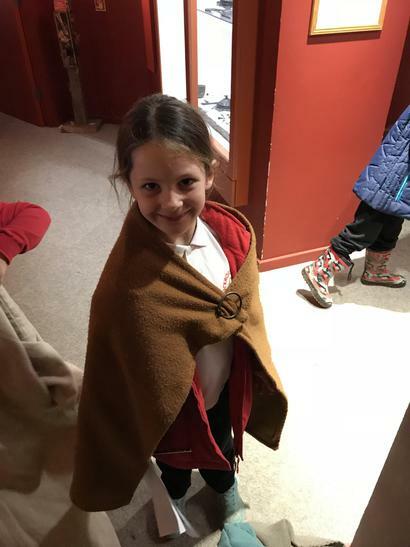 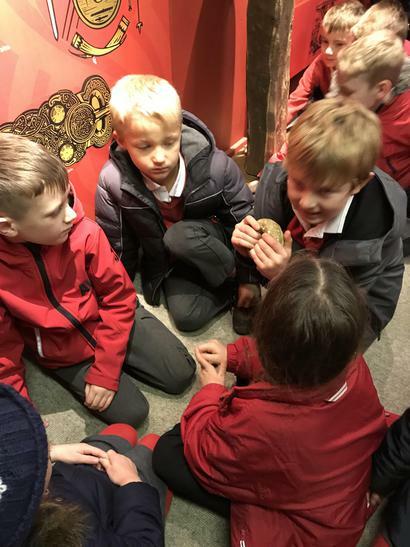 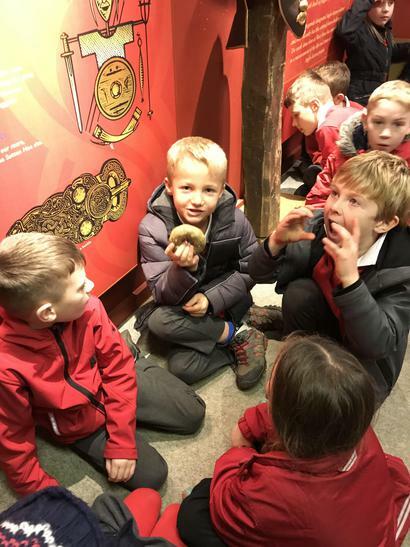 We got to explore lots of different Anglo Saxon village buildings and look in the museum at all of the artefacts. 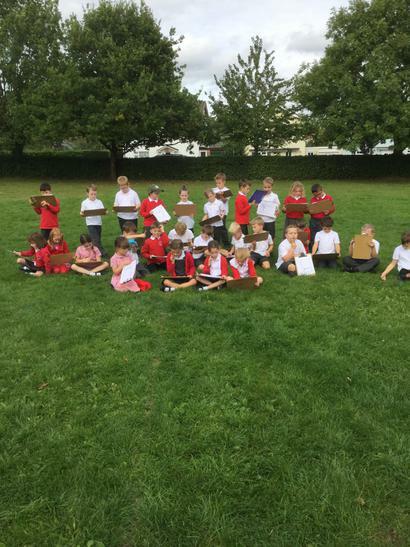 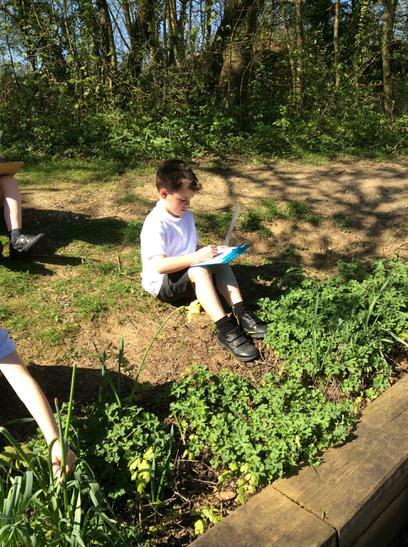 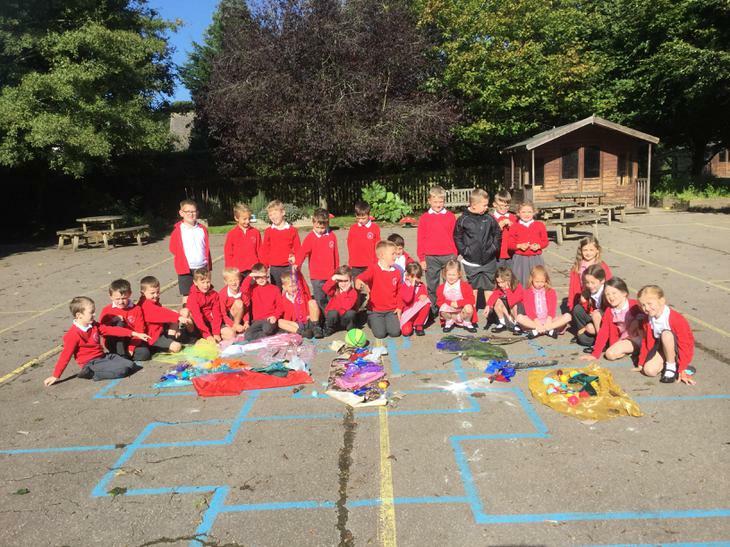 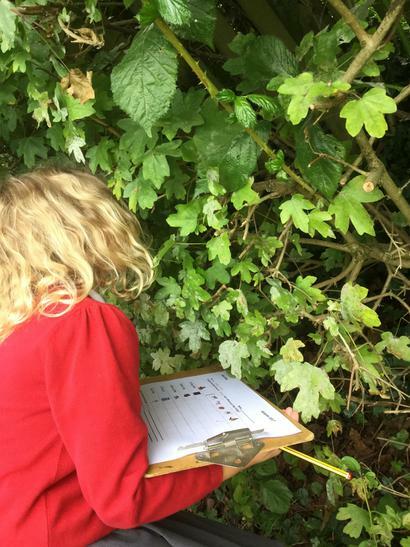 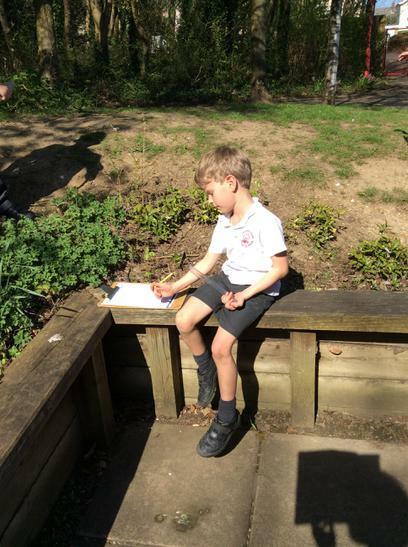 We have been learning about the changing seasons and have been exploring our school field and playground for different plants and animals. 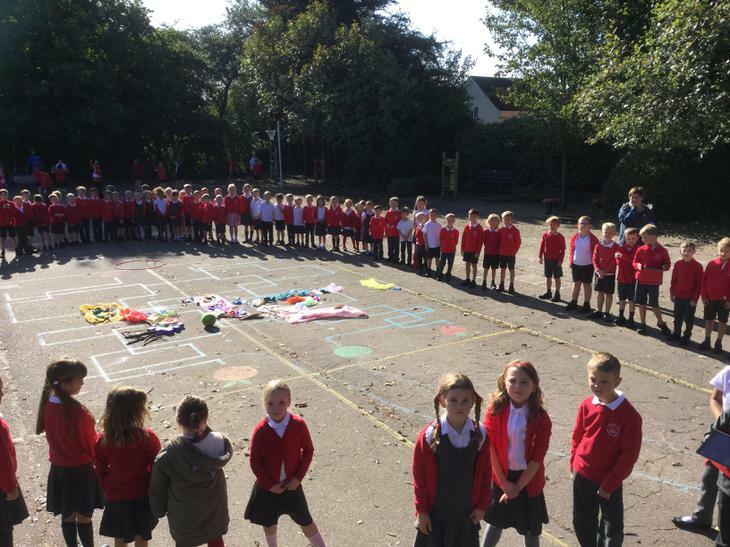 We are going to do the same in winter, spring and summer to see how our environment changes over time. 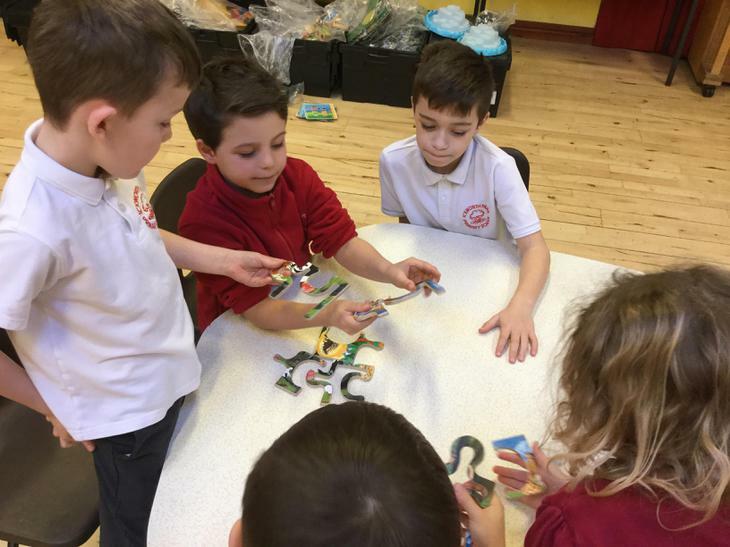 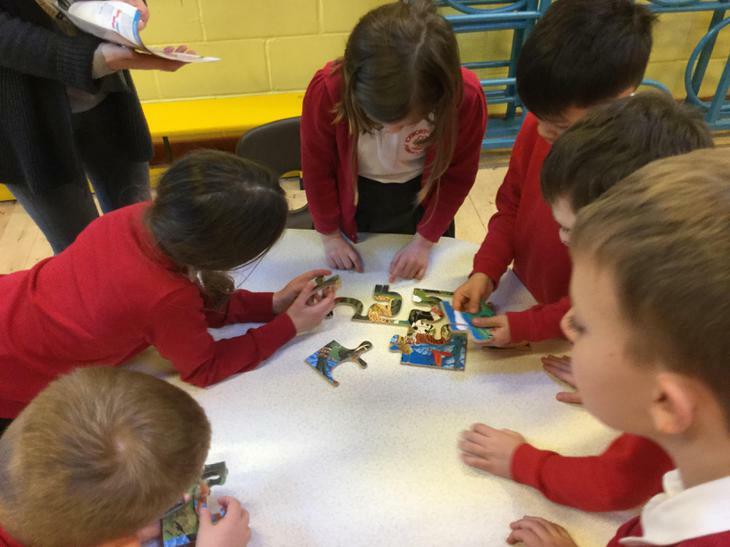 For literacy this term we are learning about Myths and Legends so we have been searching for dragons around our school! 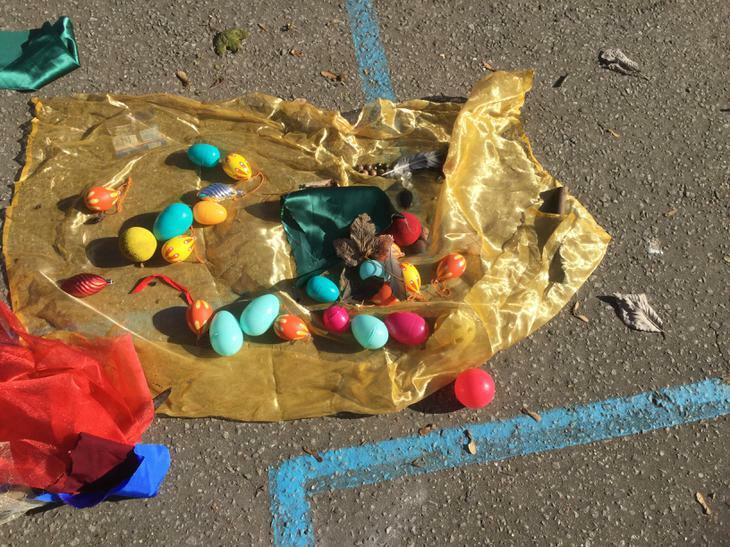 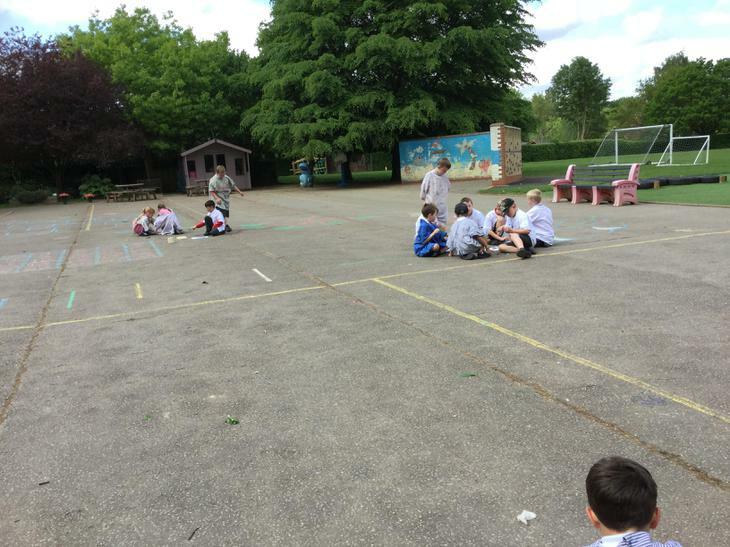 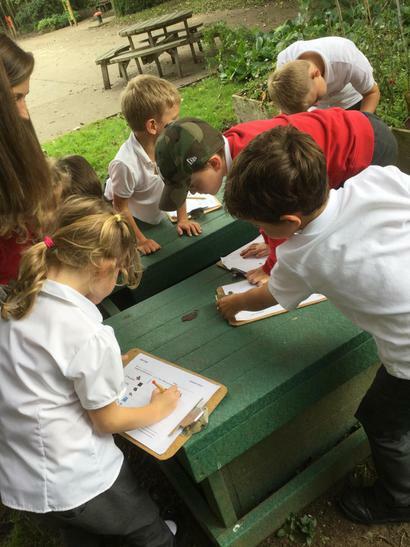 We found lots of evidence that there had been a dragon on our playground and on our school field. 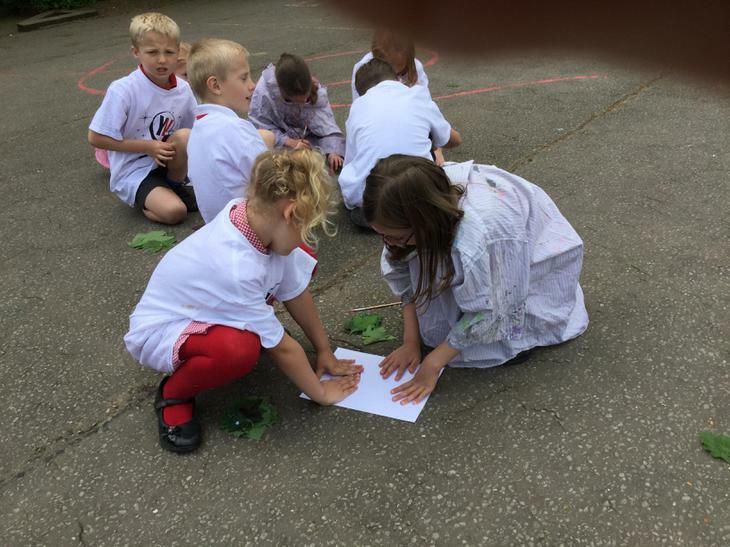 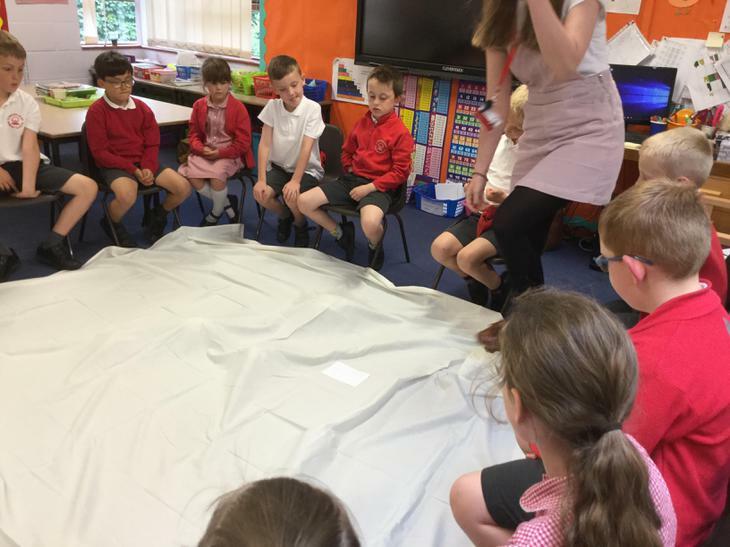 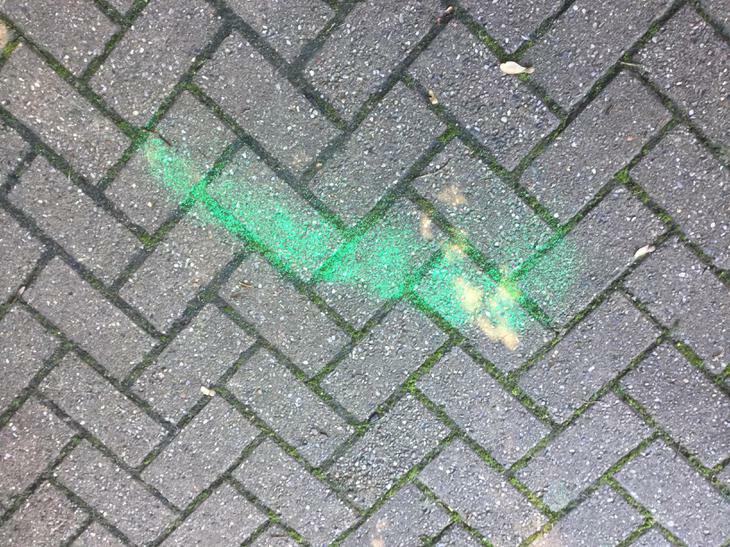 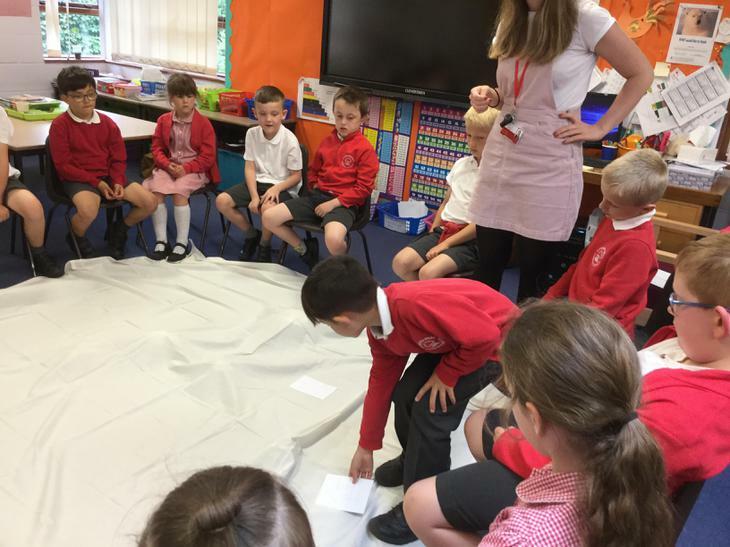 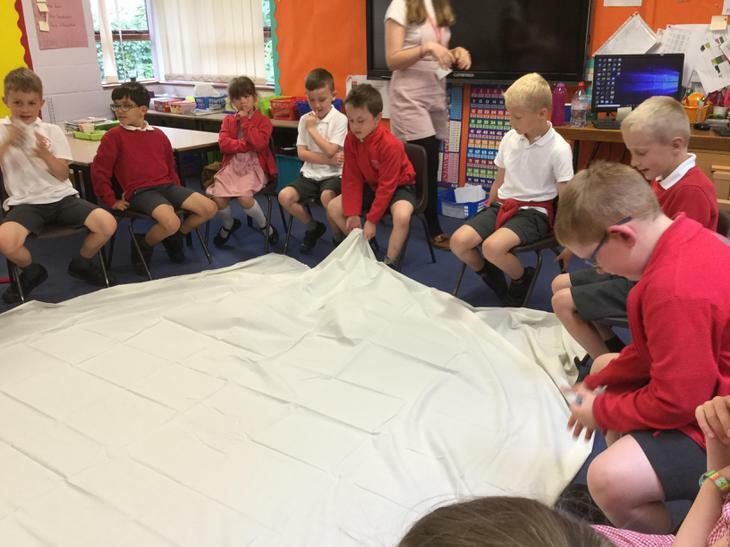 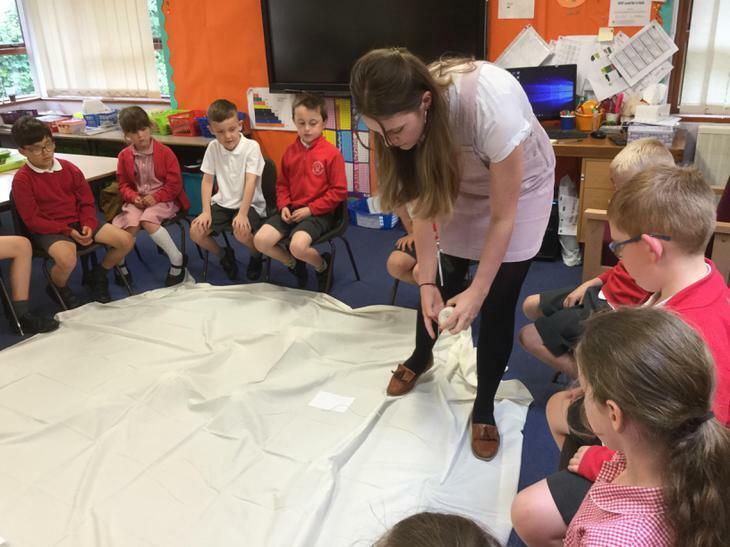 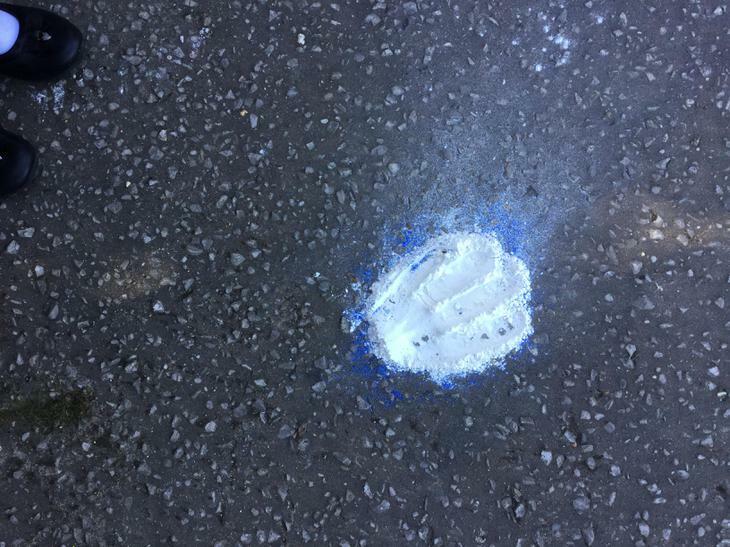 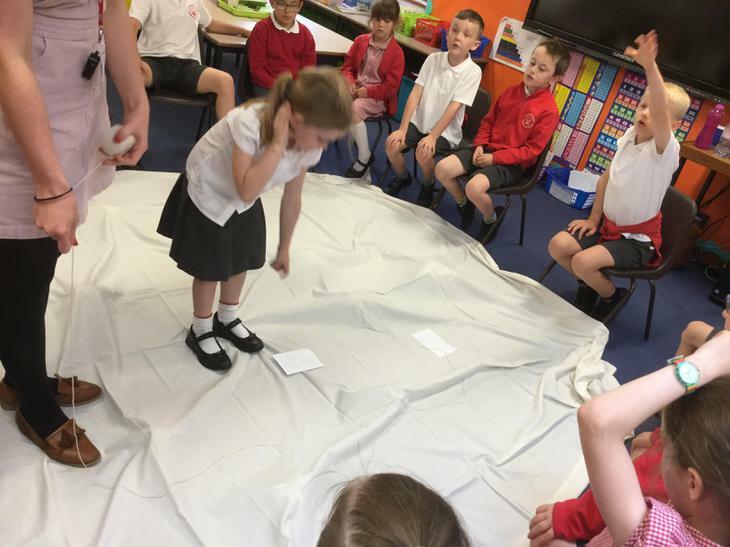 Mrs Skippins made sure that we were protected with fire proof spray and we made sure we collected as much evidence as possible. 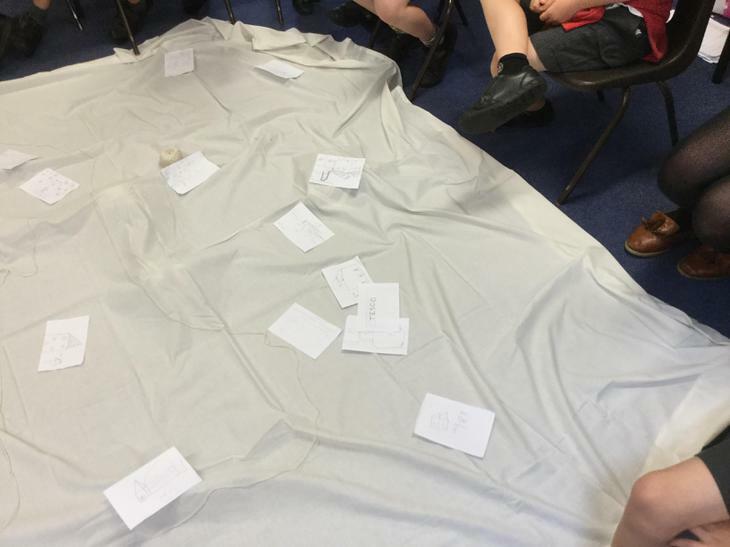 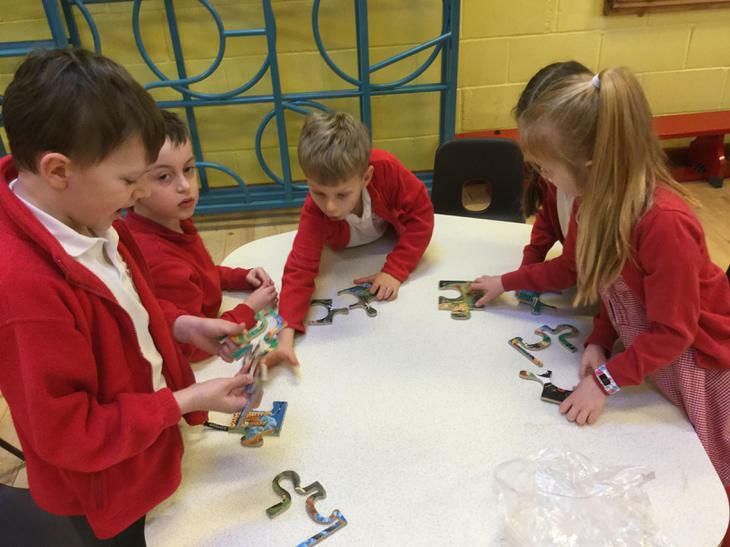 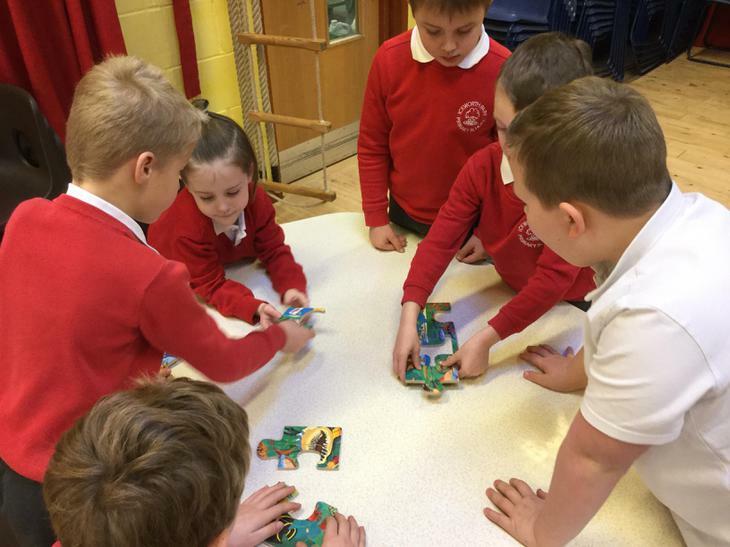 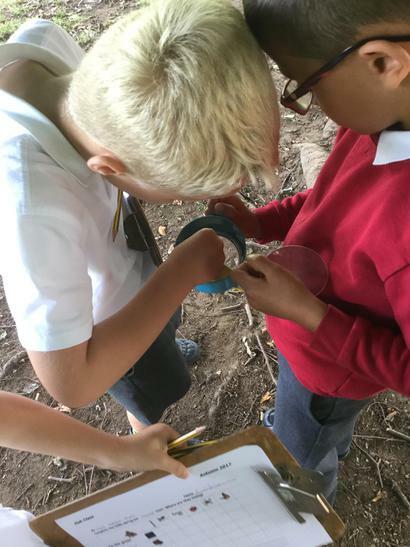 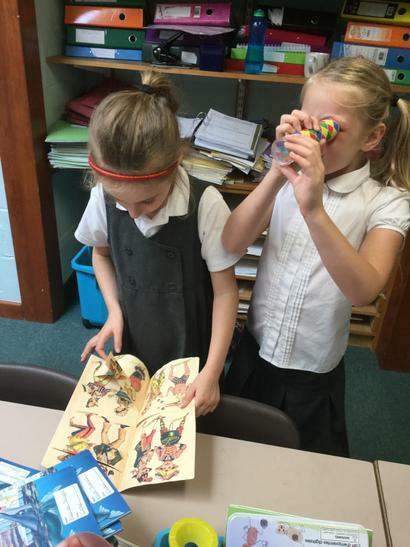 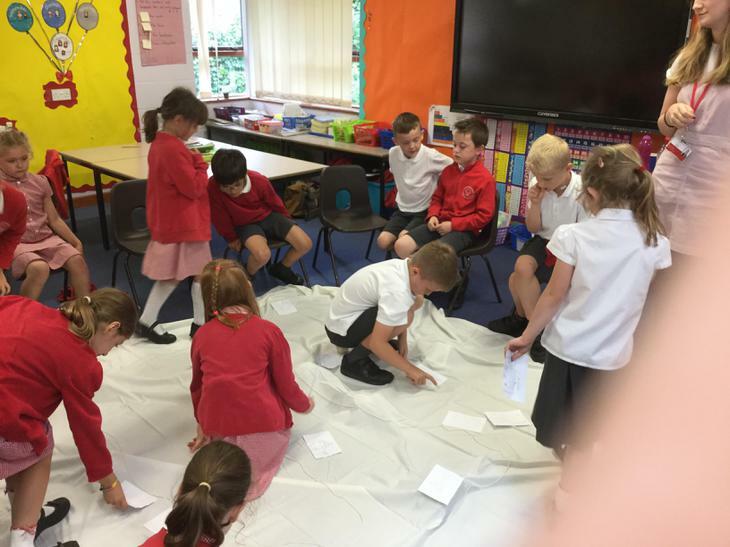 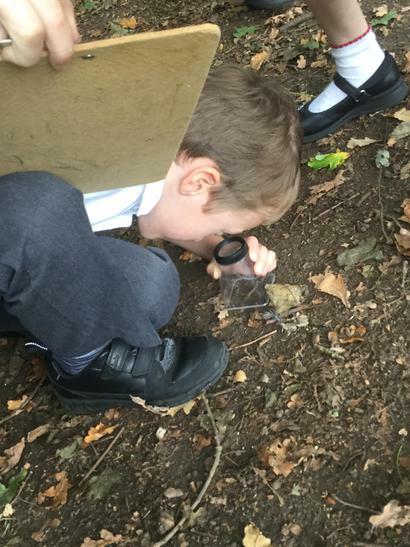 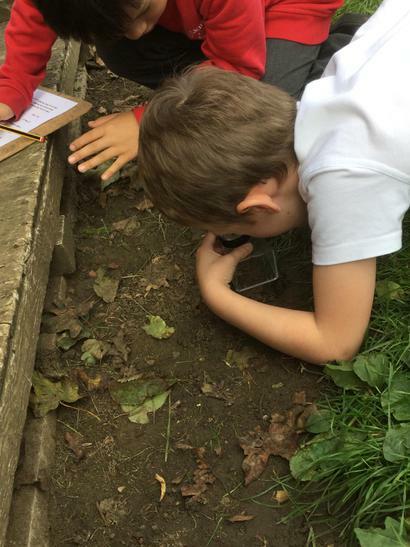 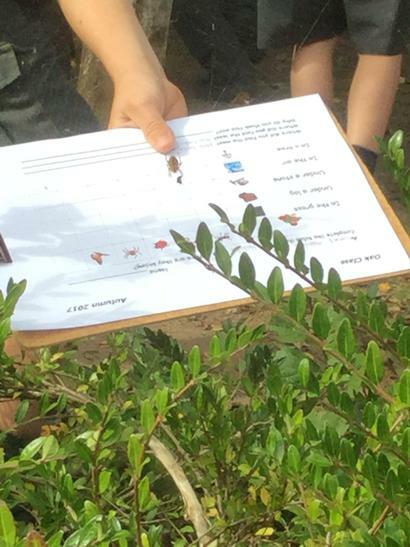 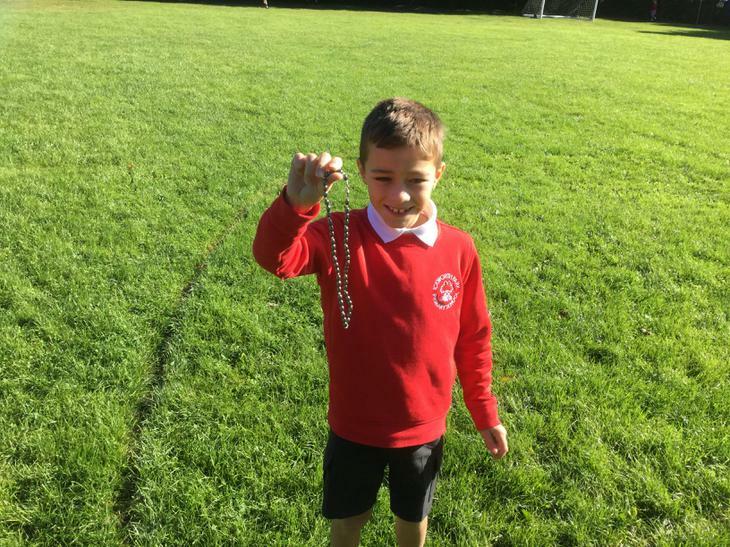 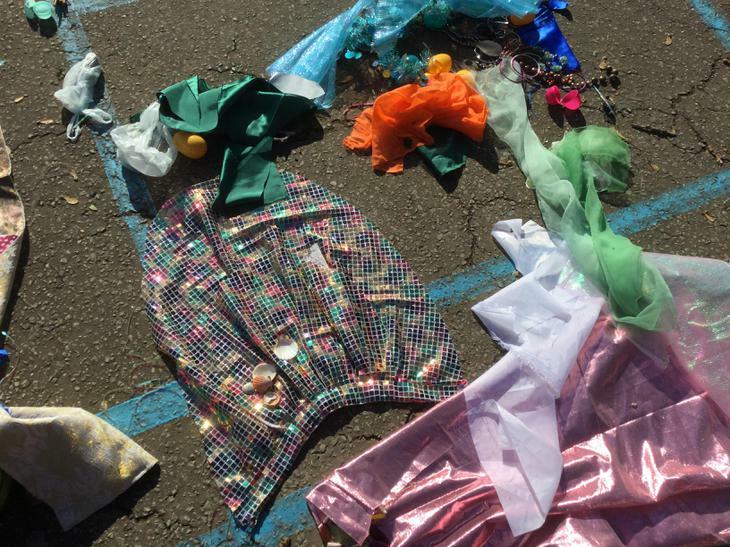 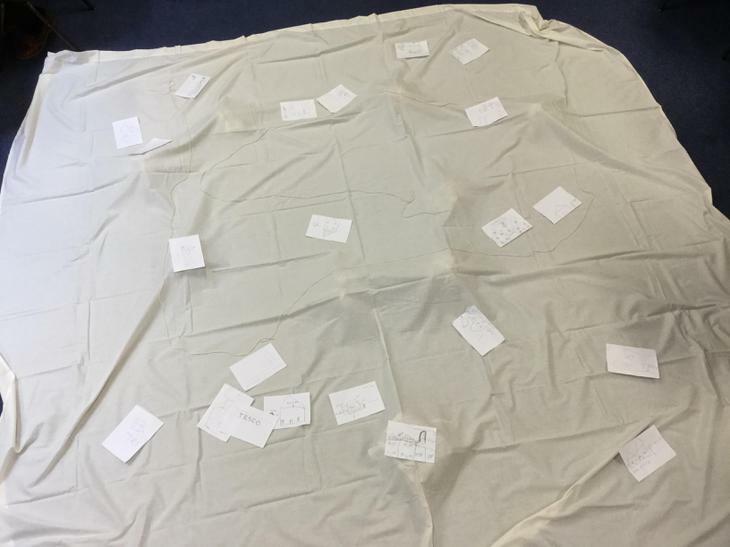 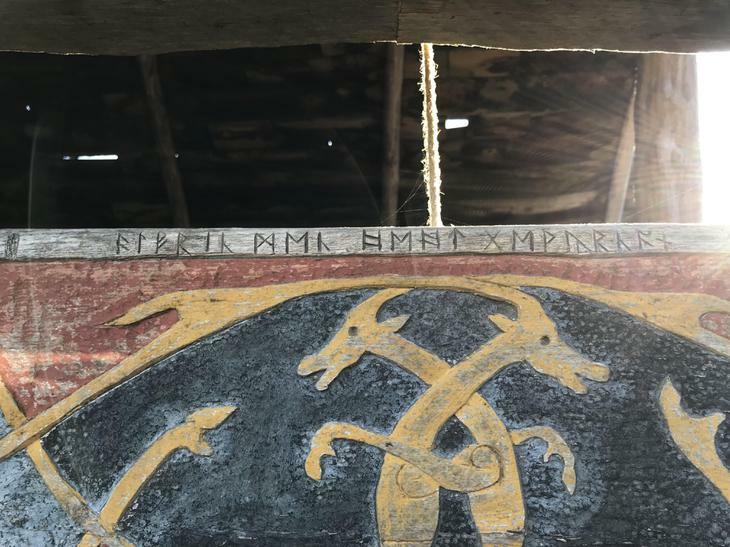 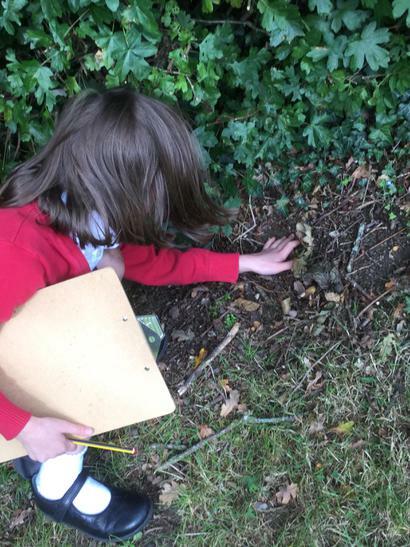 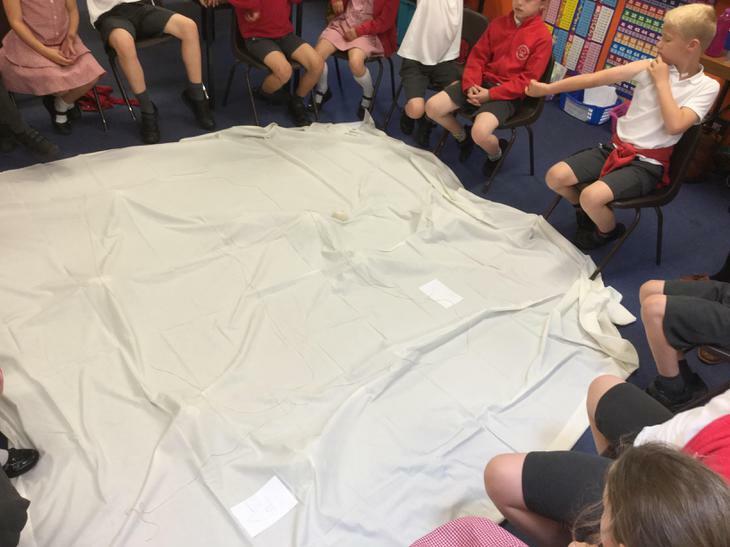 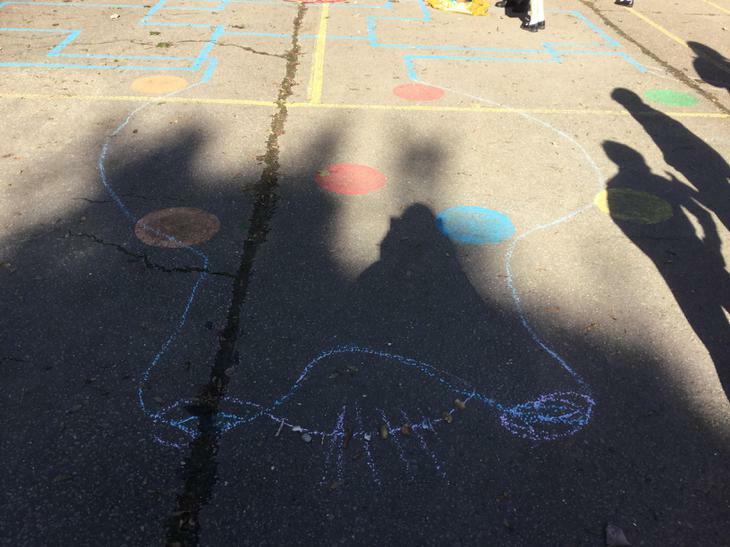 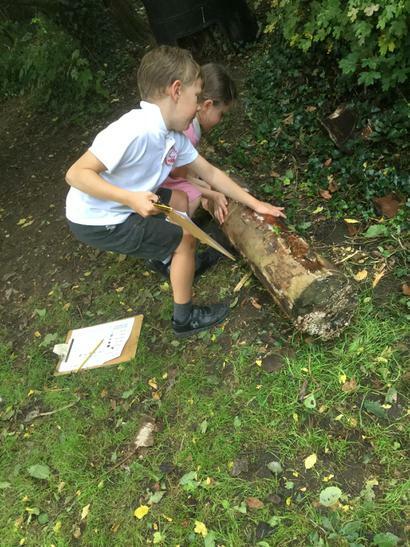 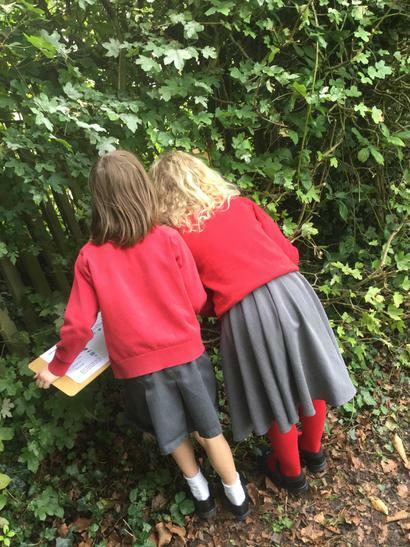 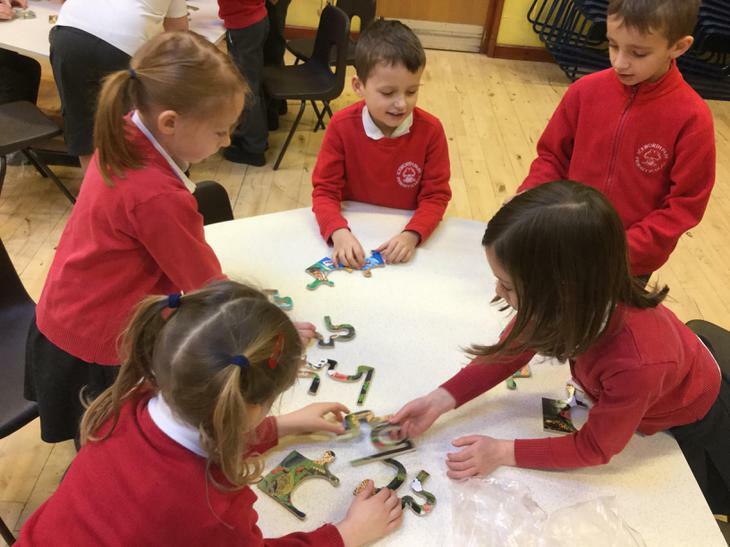 Take a look at our pictures to see what we found.